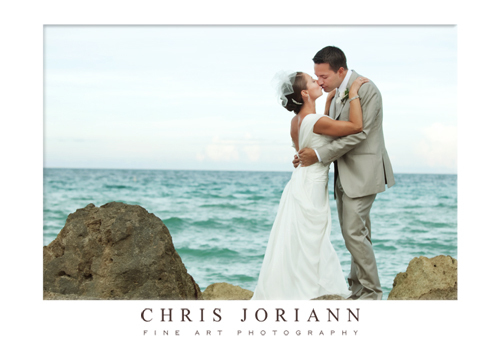 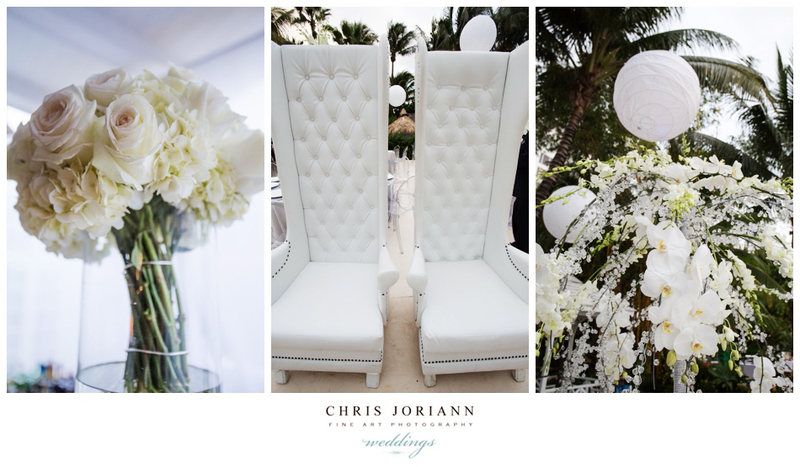 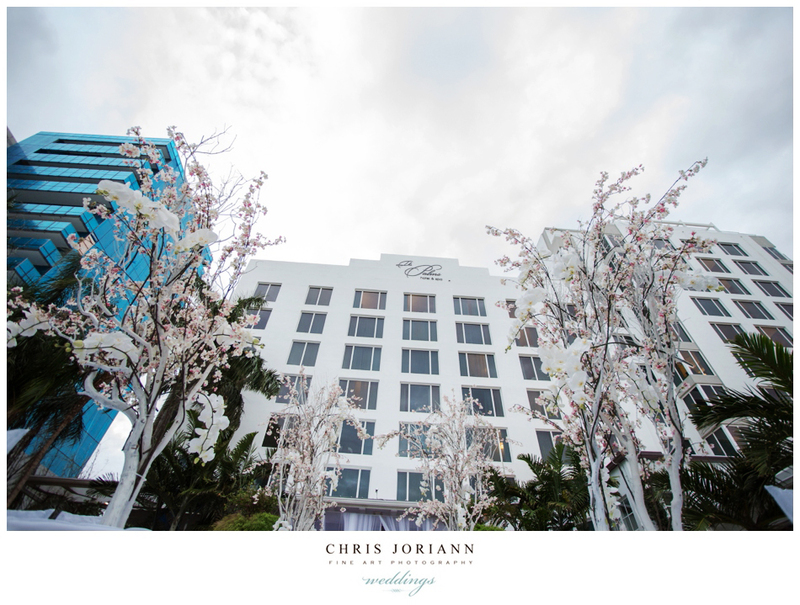 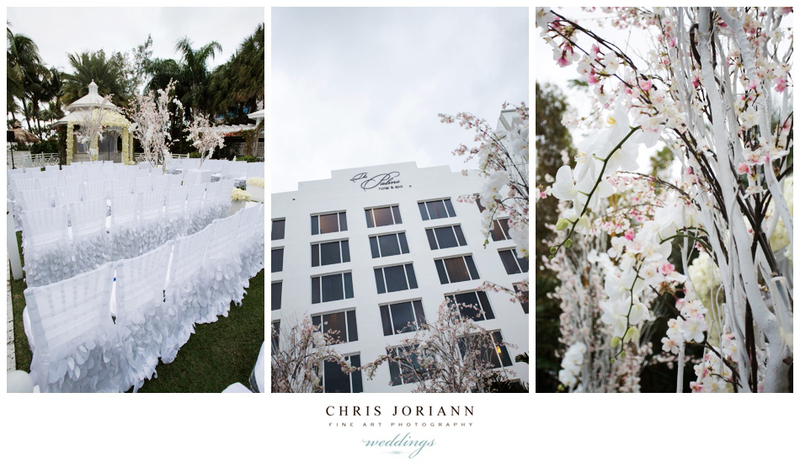 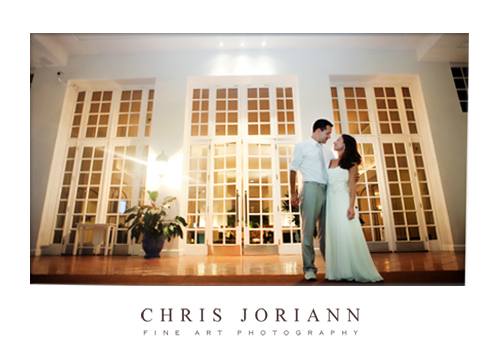 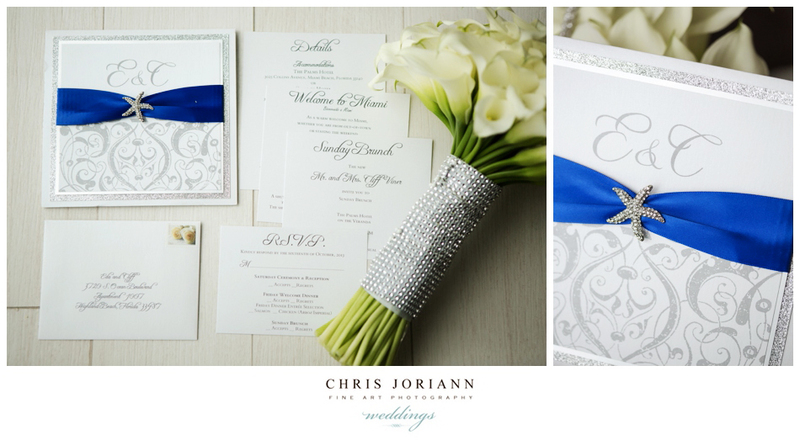 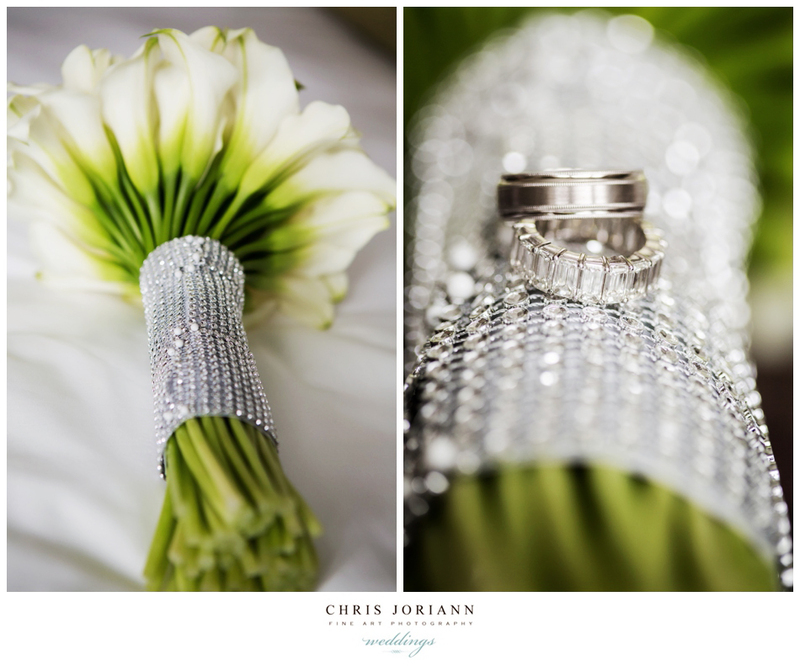 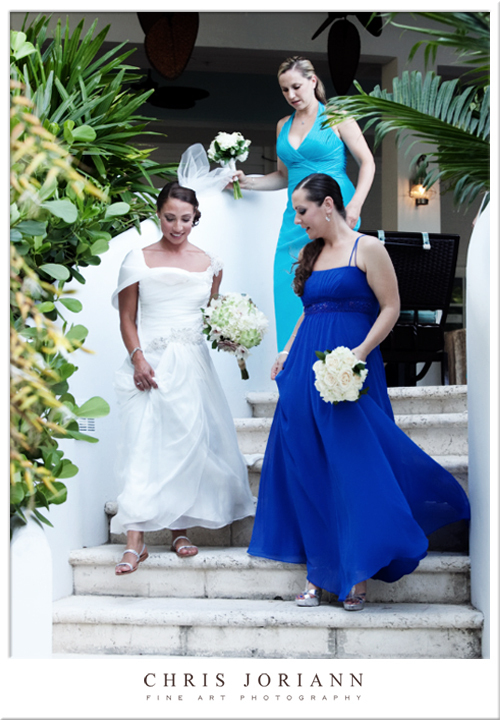 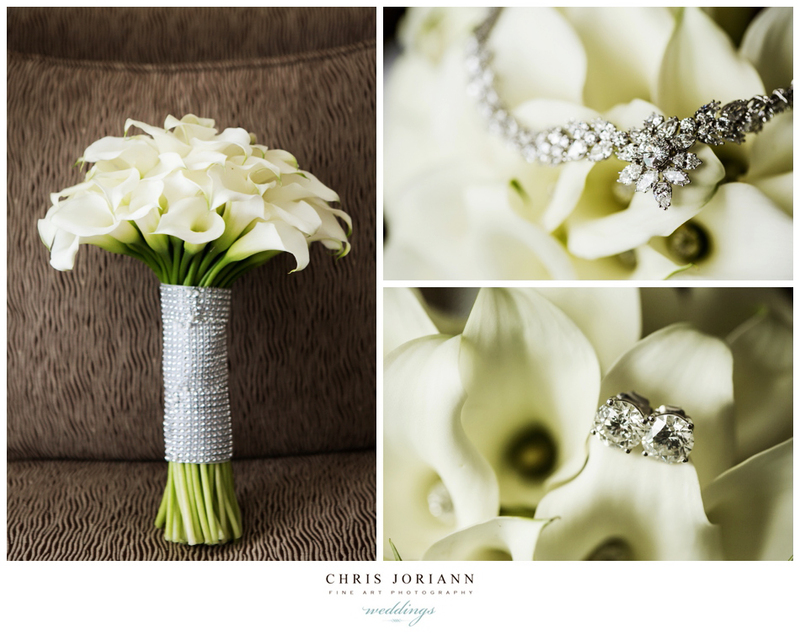 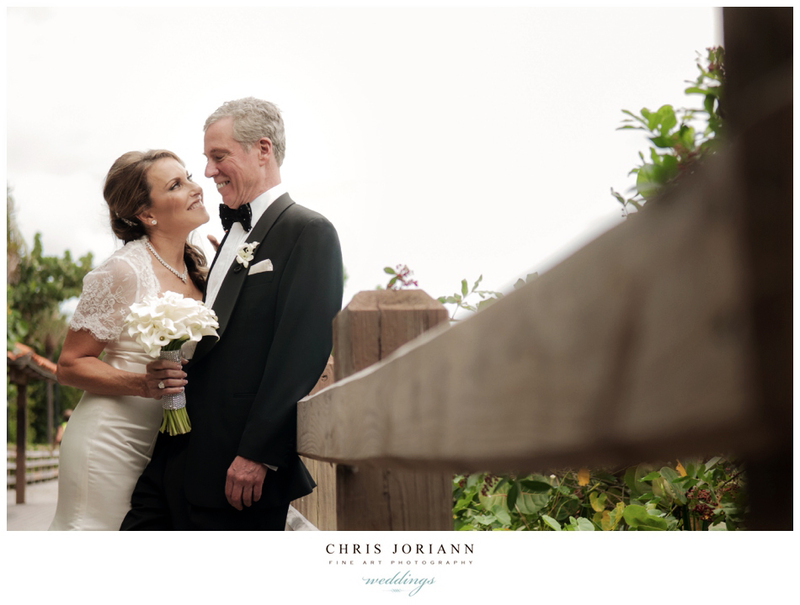 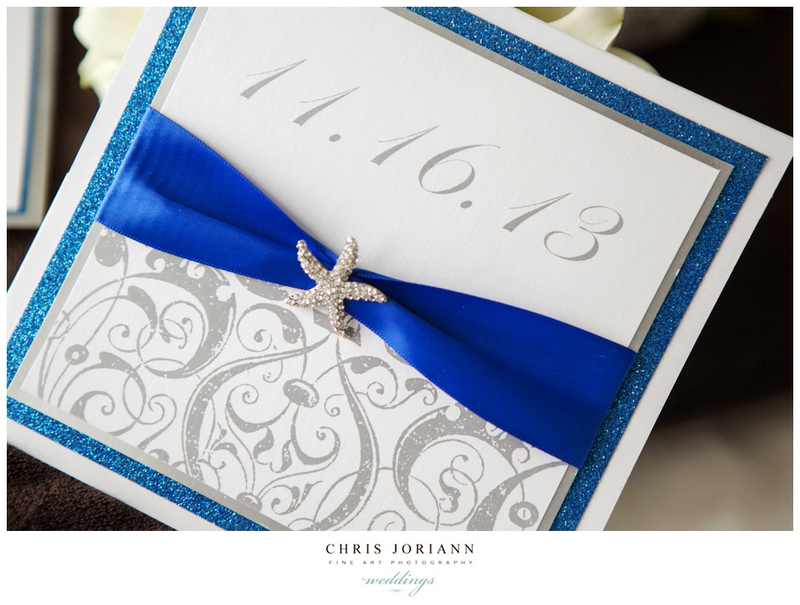 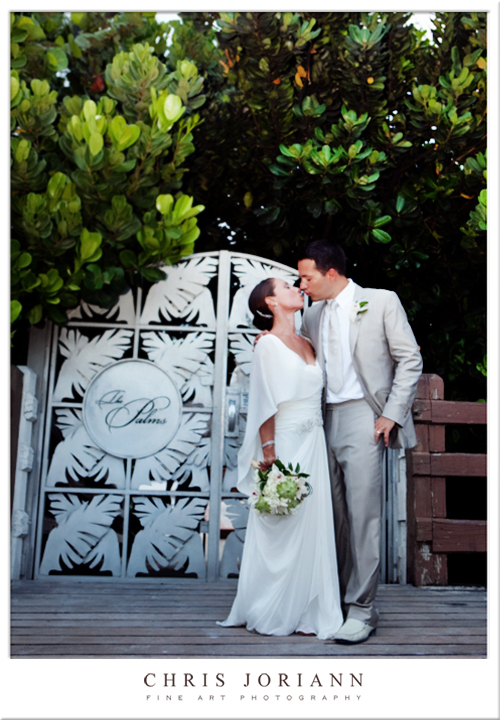 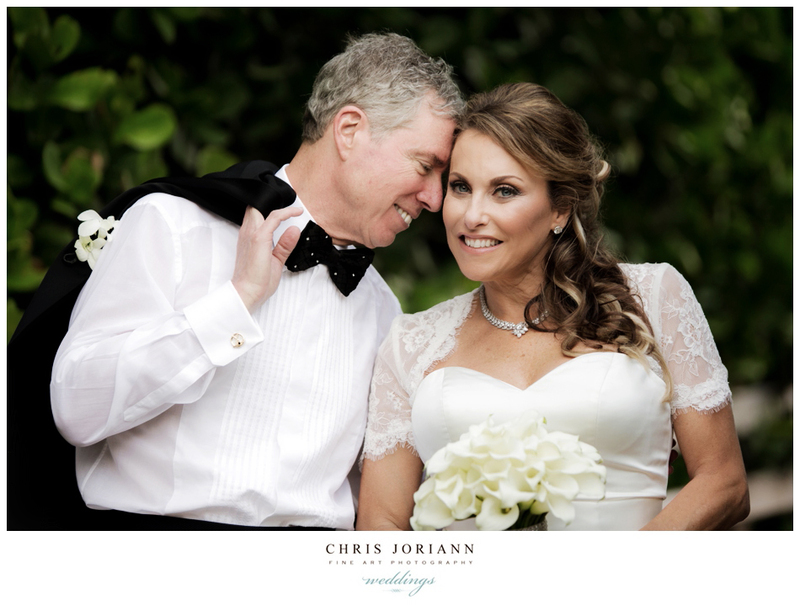 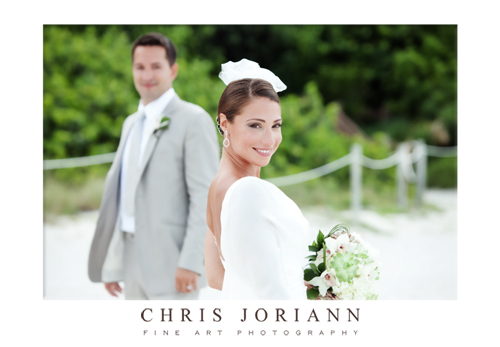 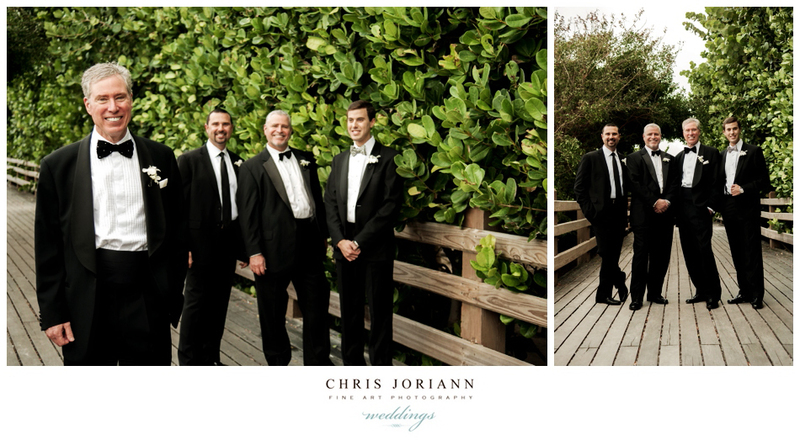 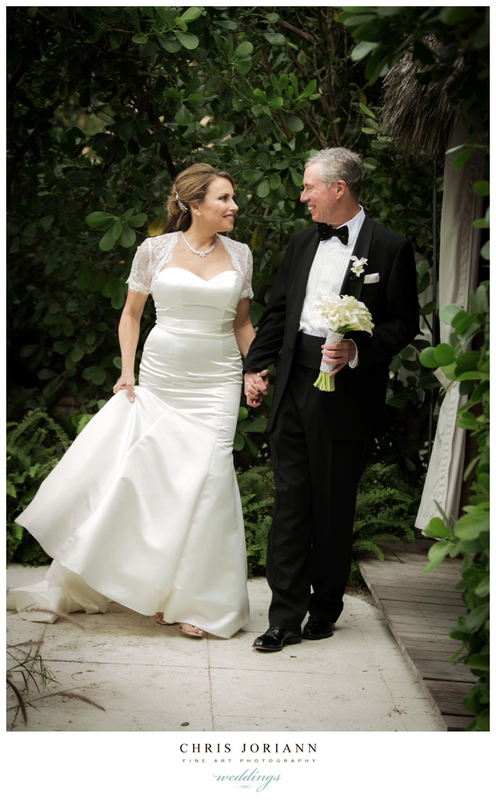 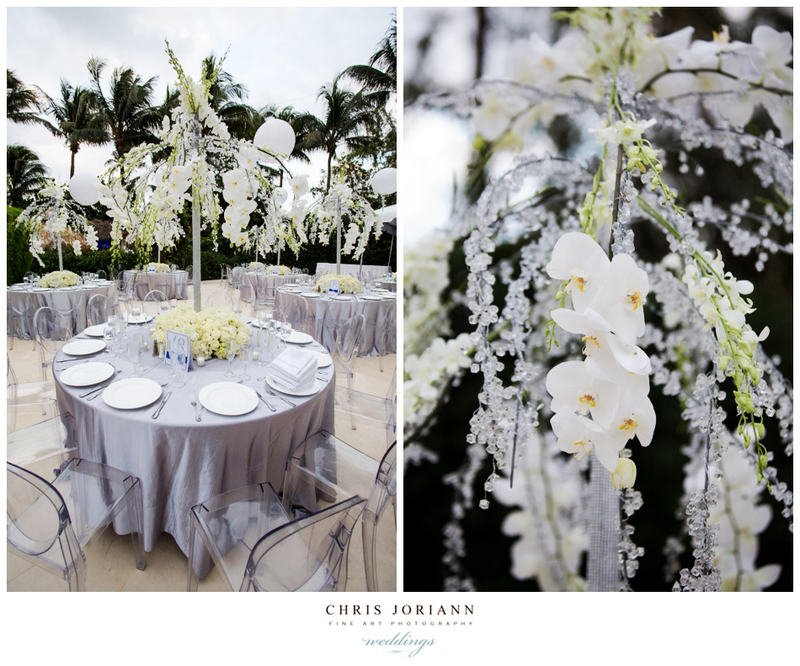 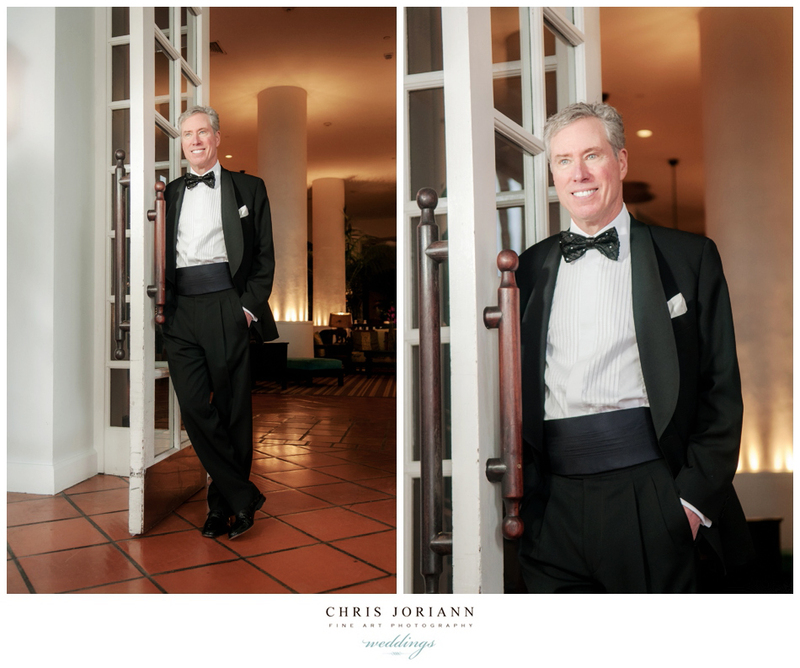 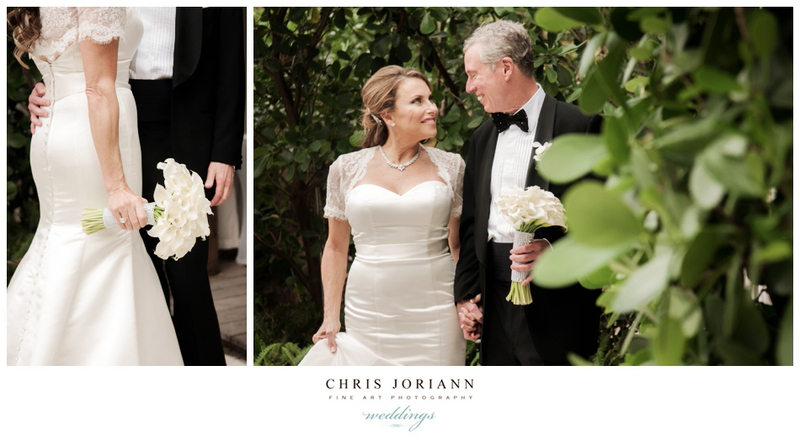 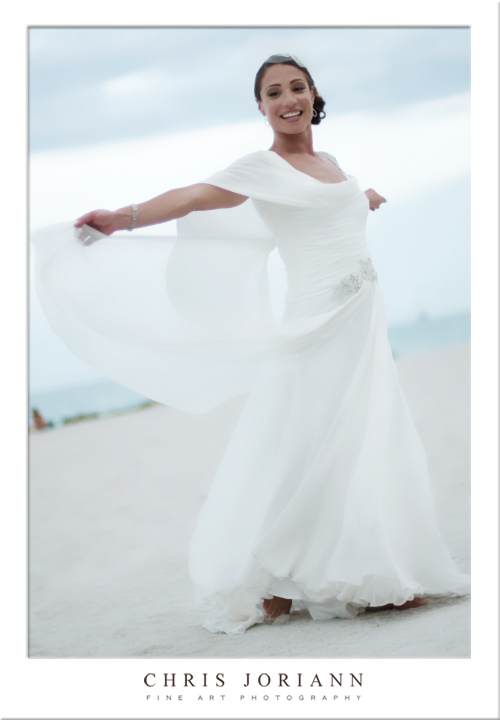 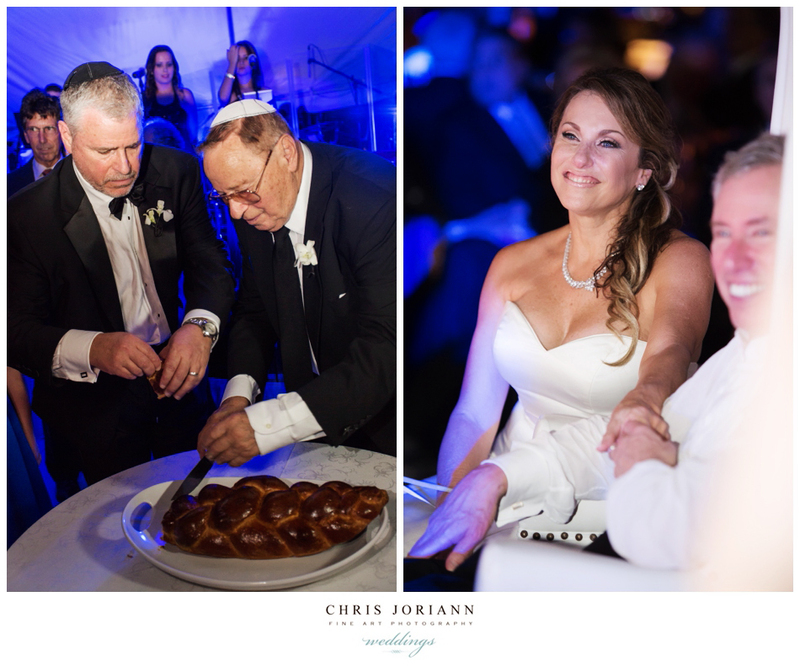 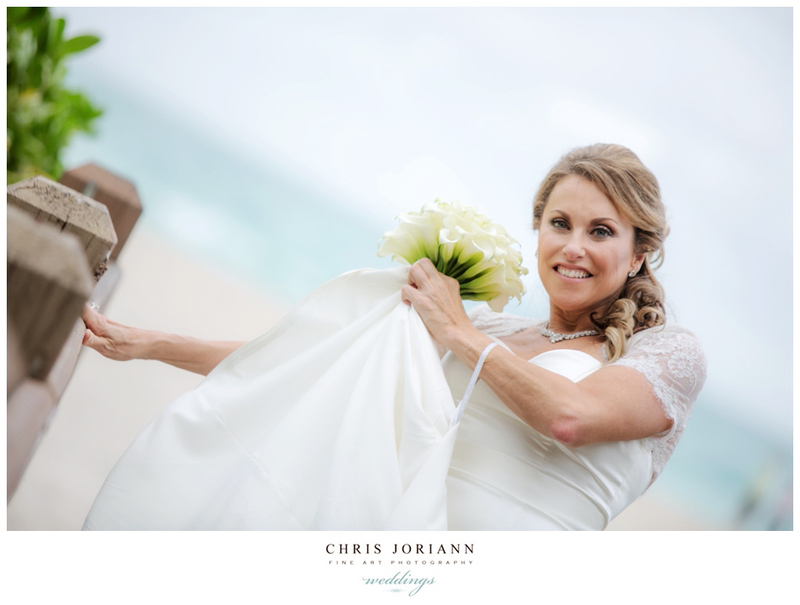 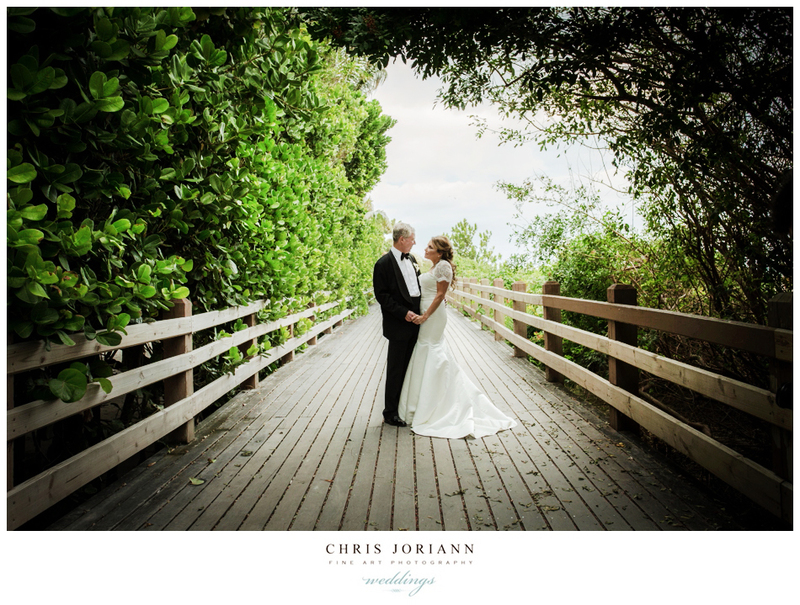 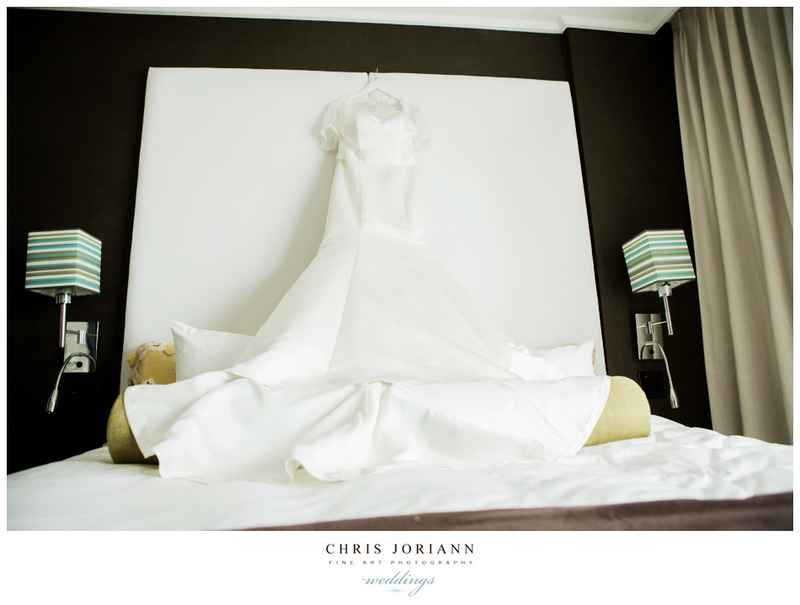 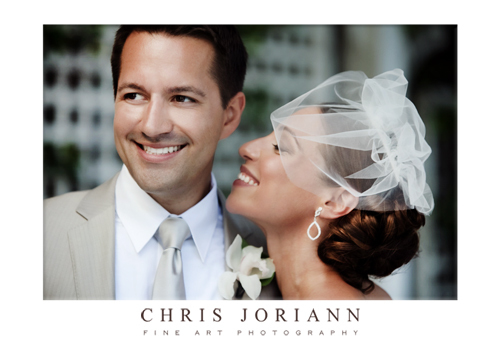 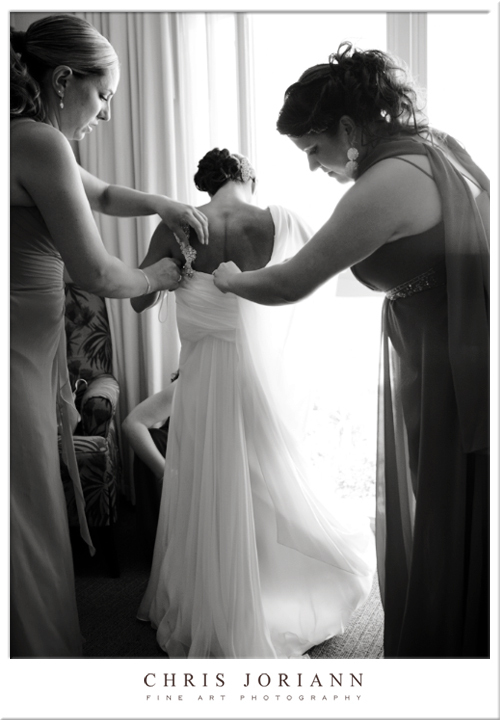 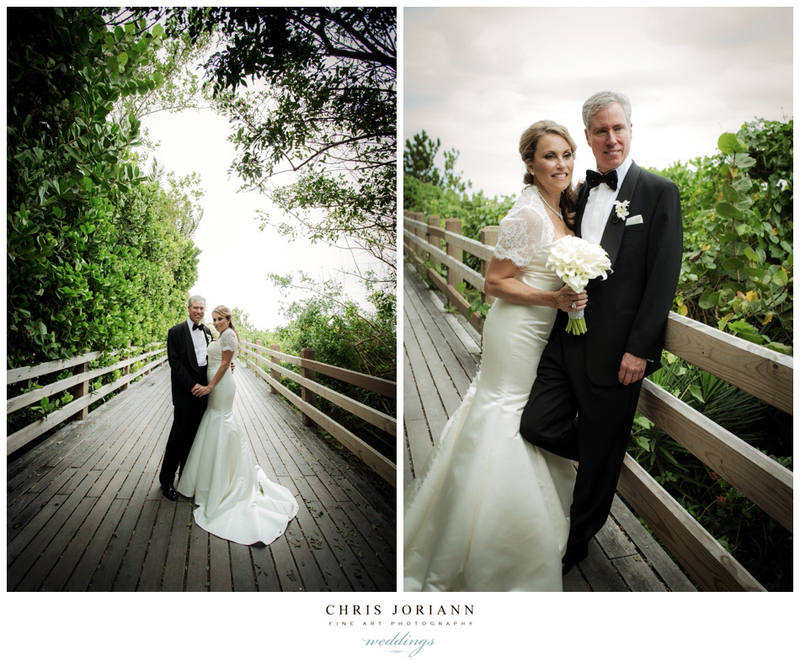 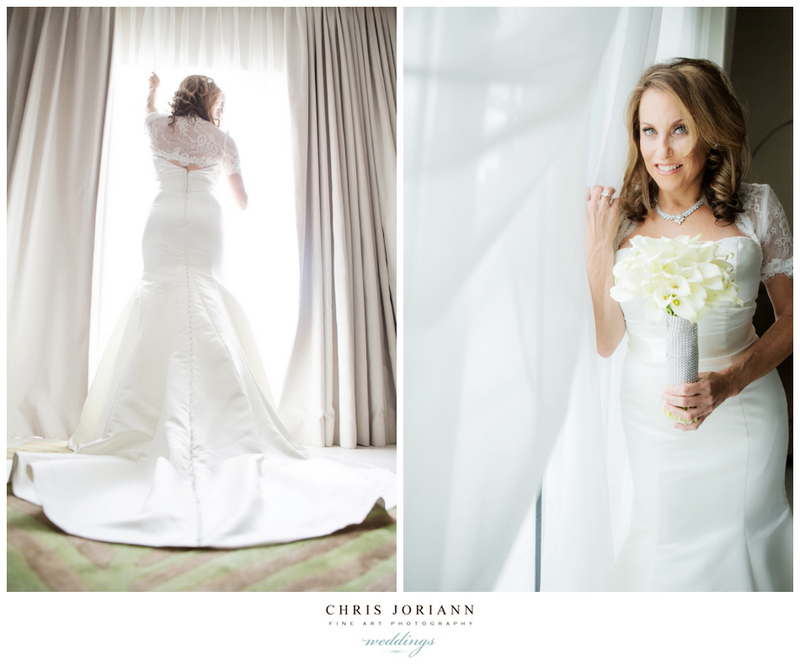 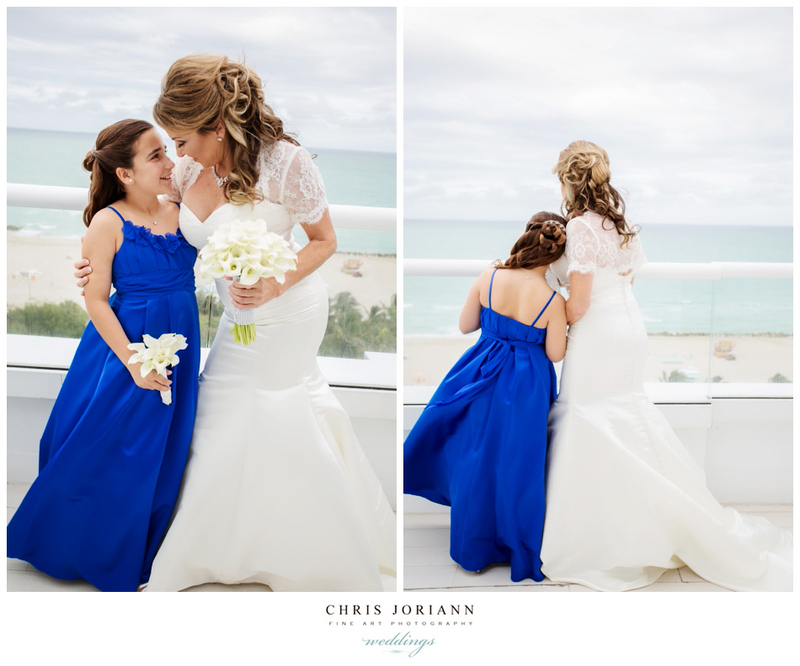 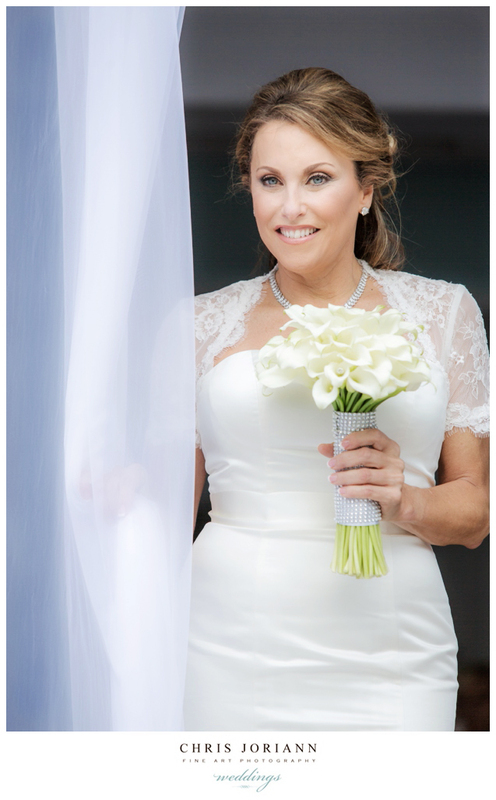 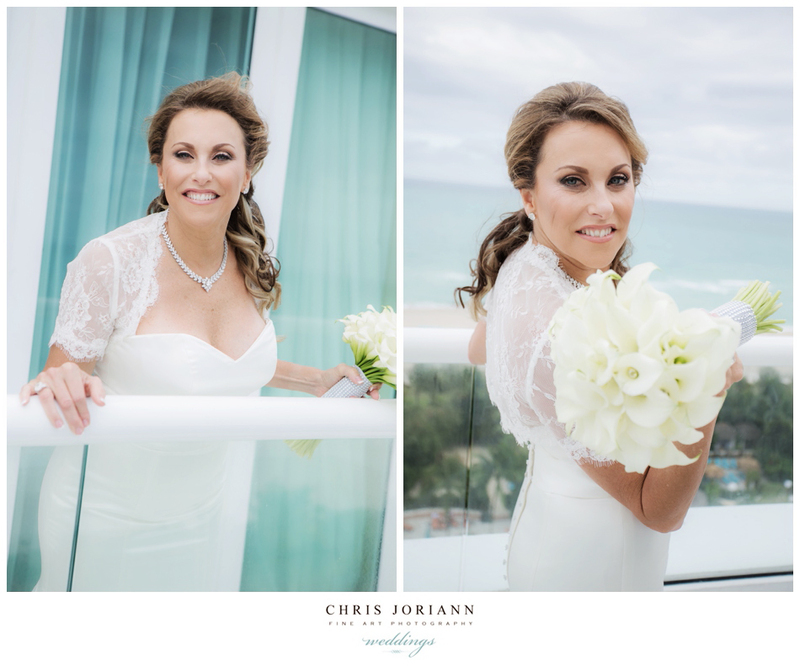 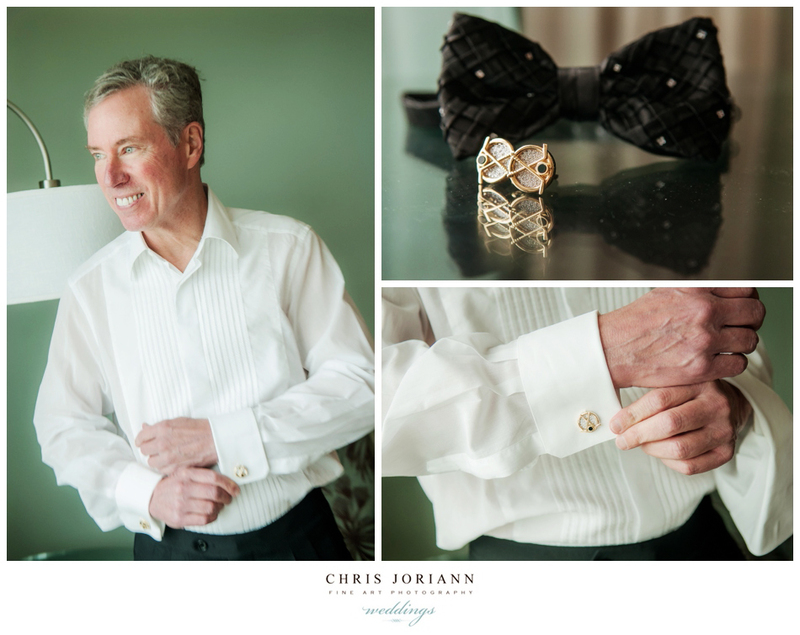 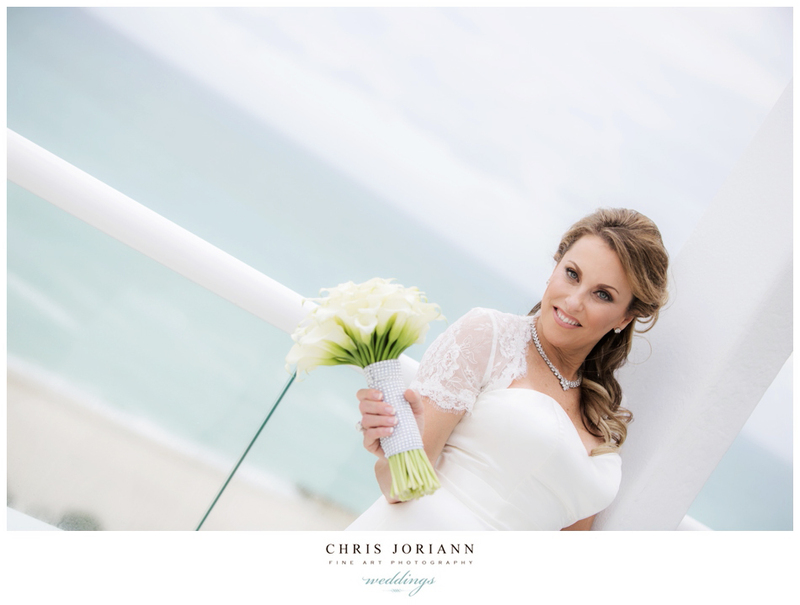 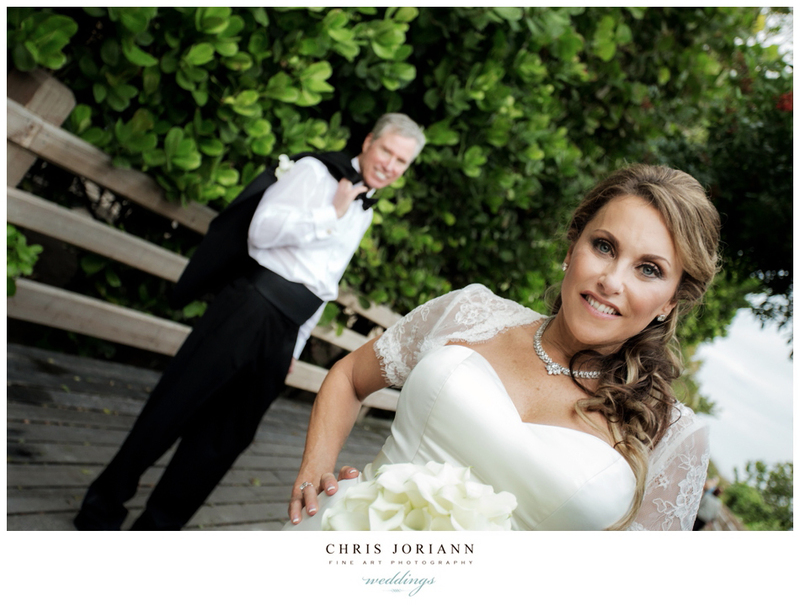 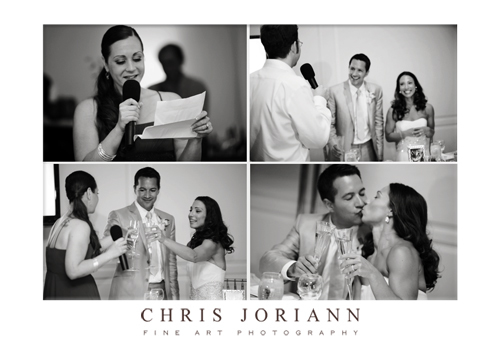 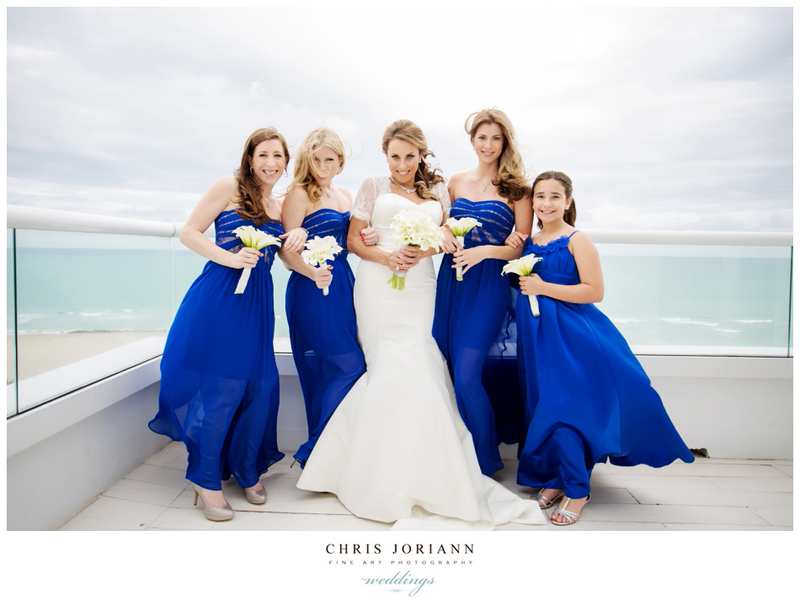 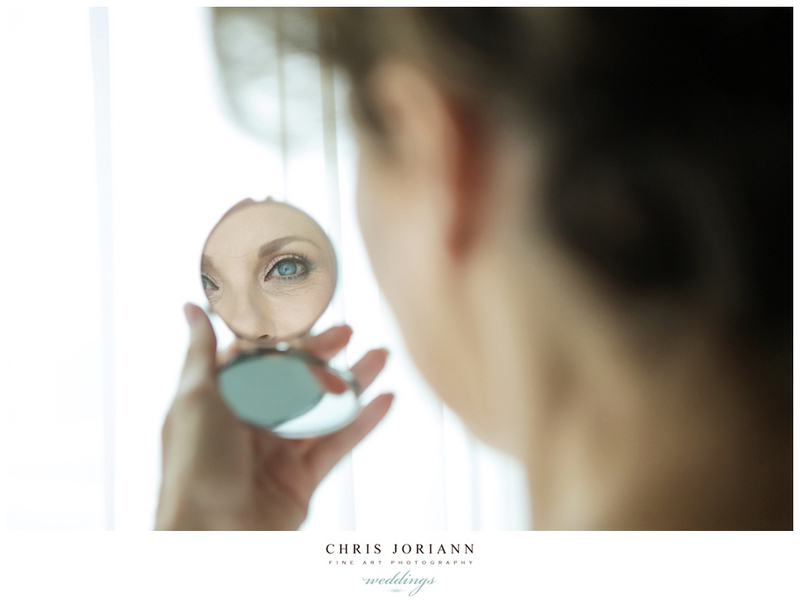 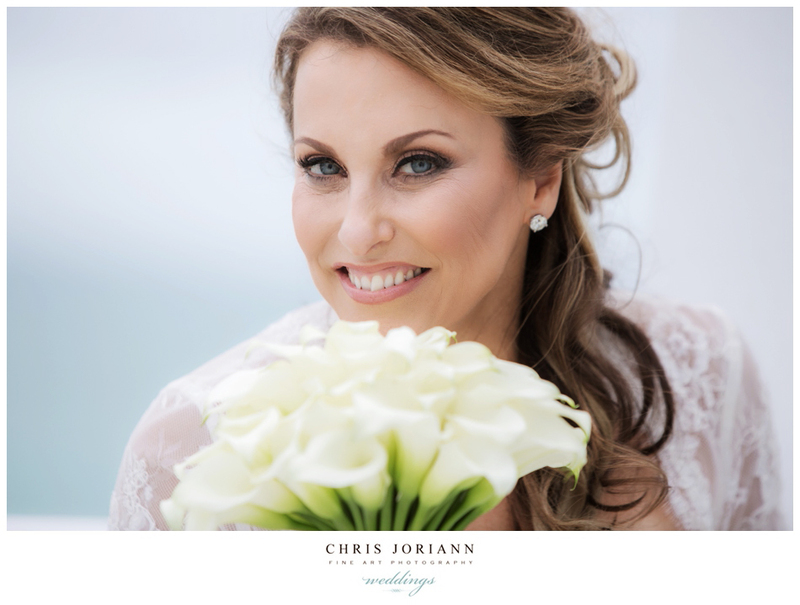 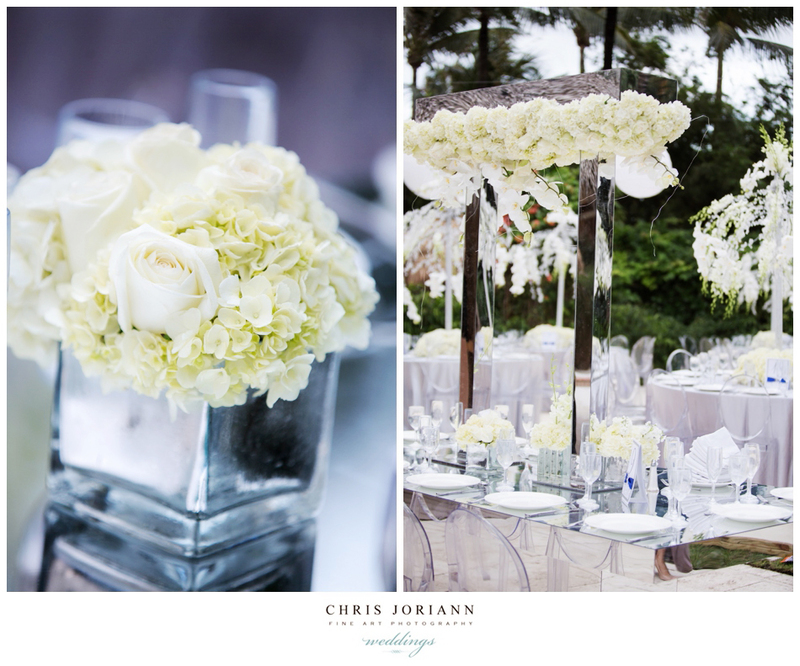 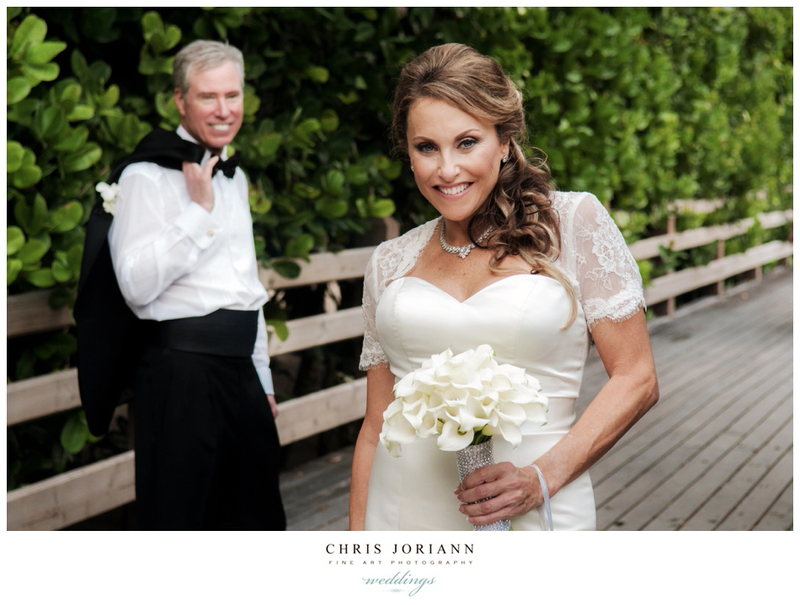 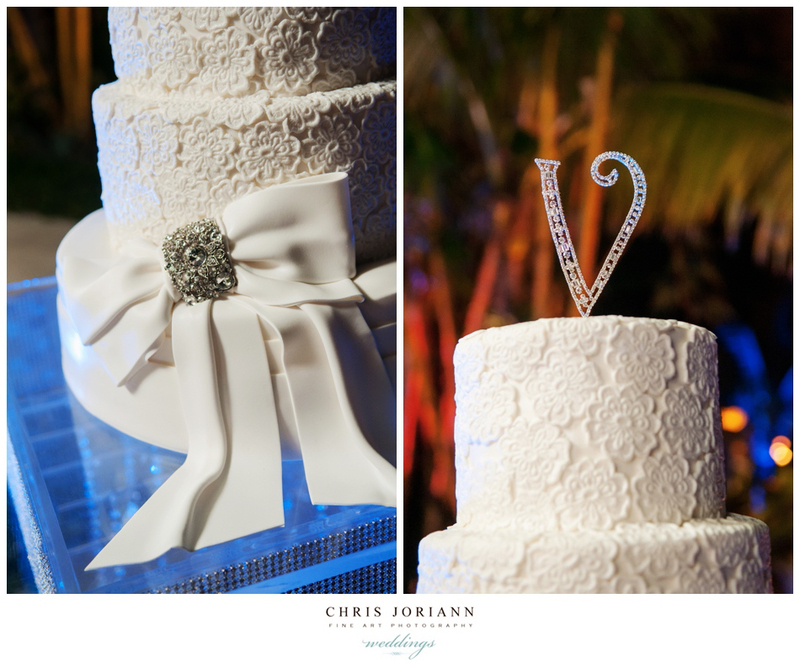 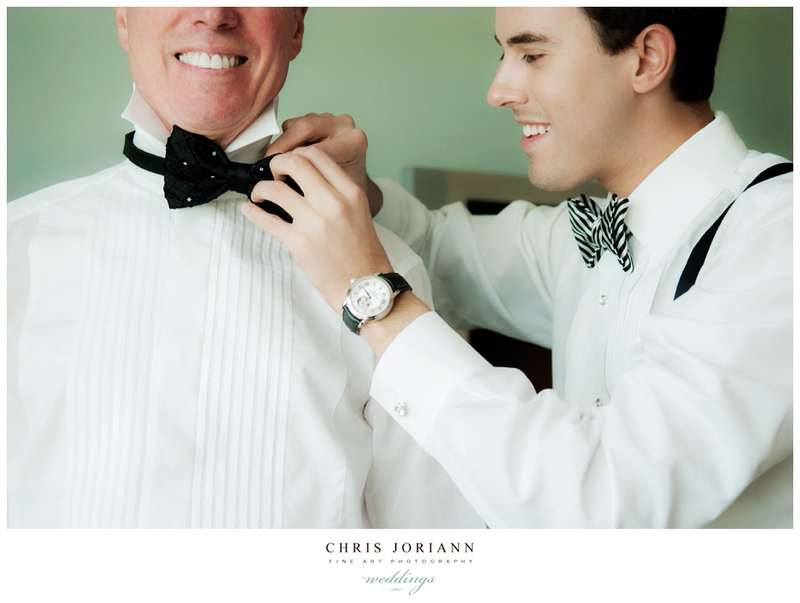 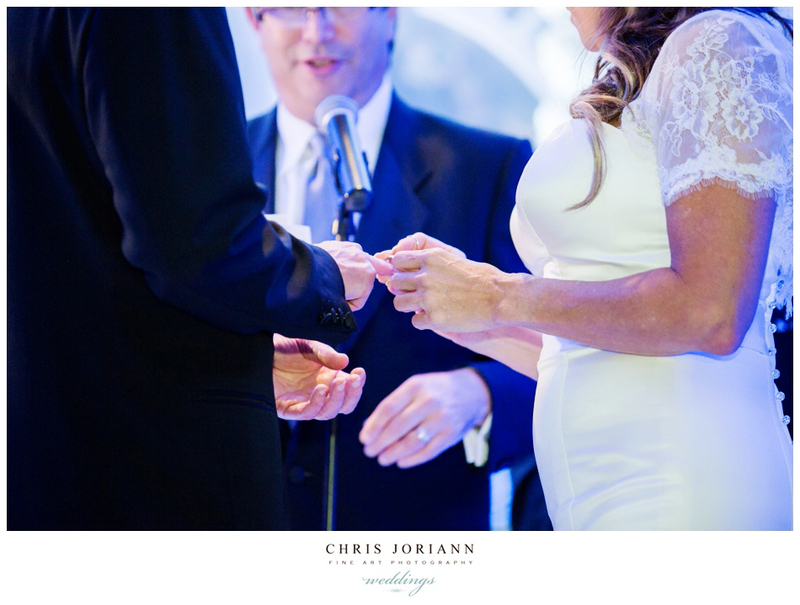 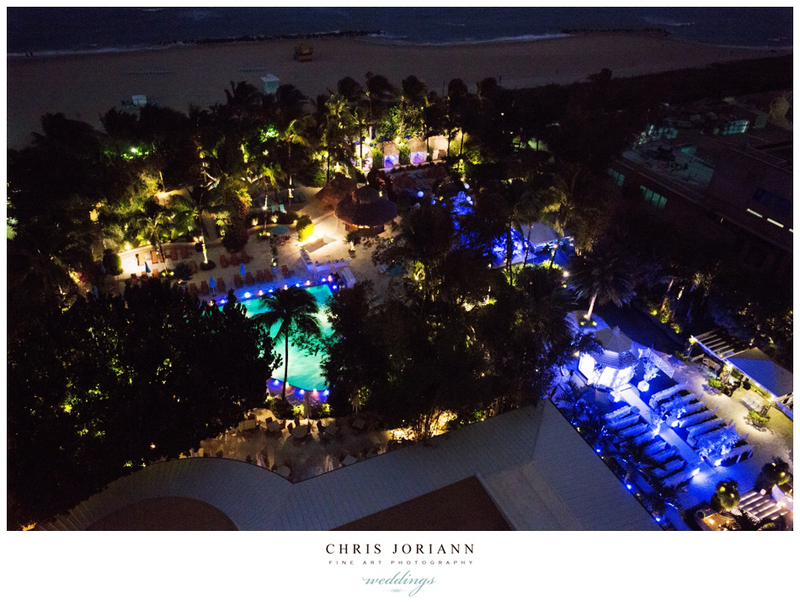 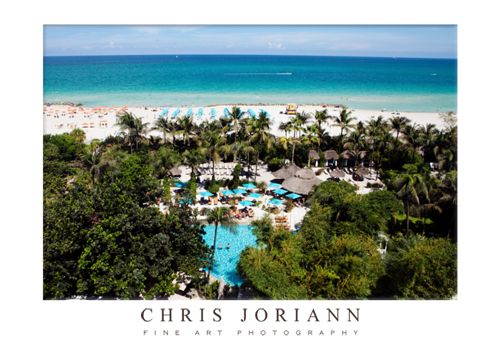 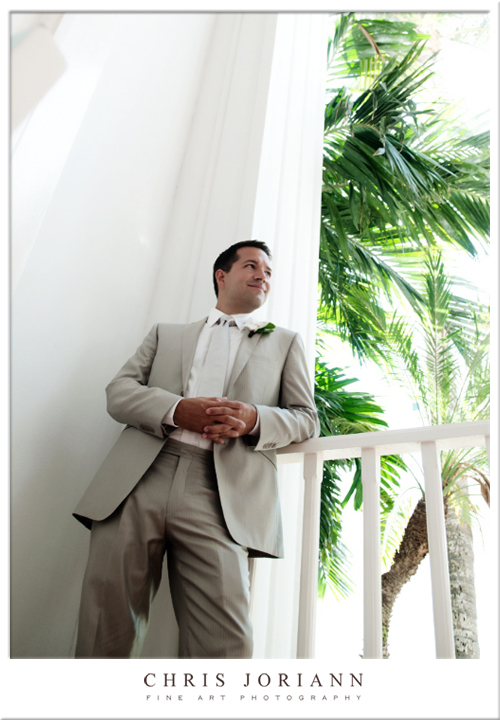 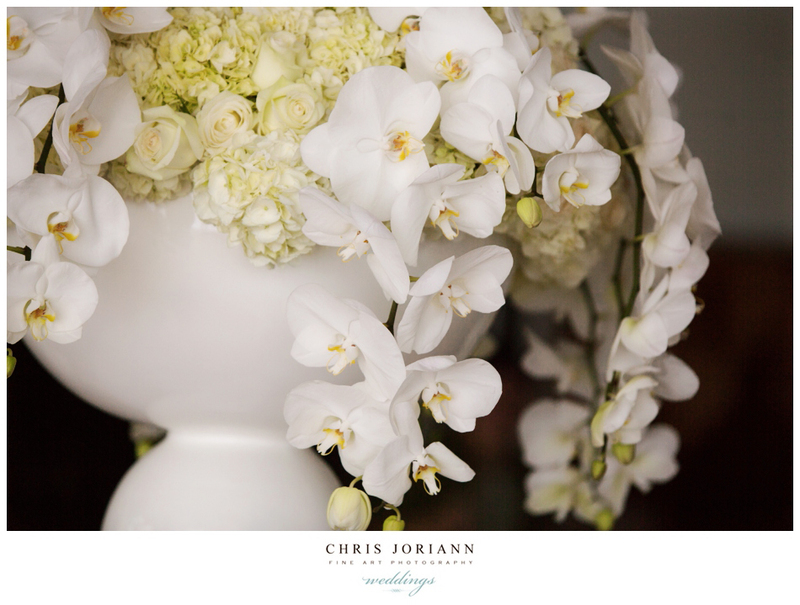 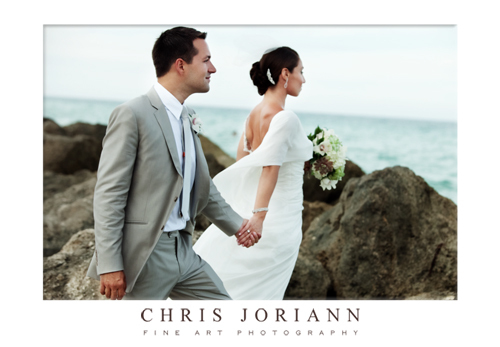 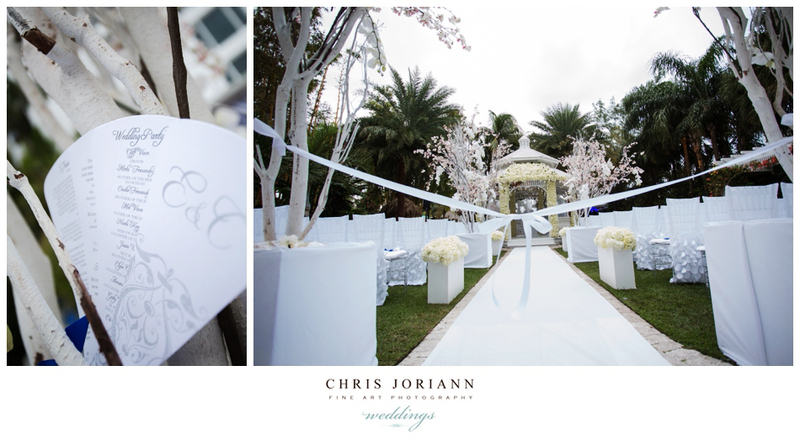 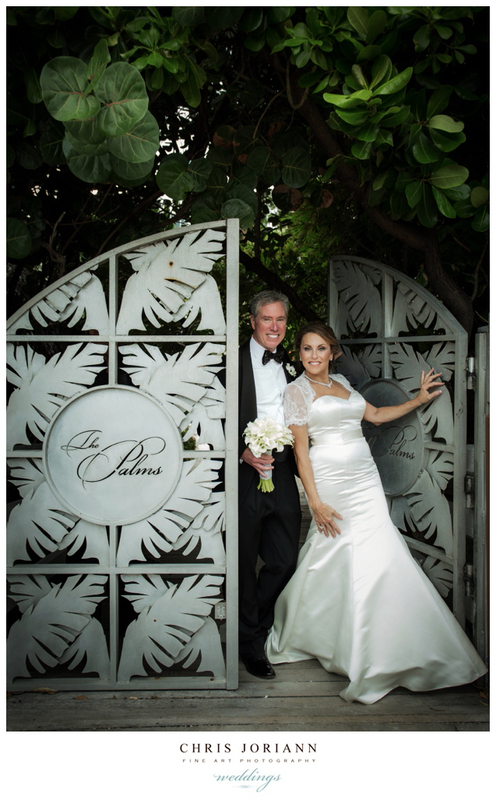 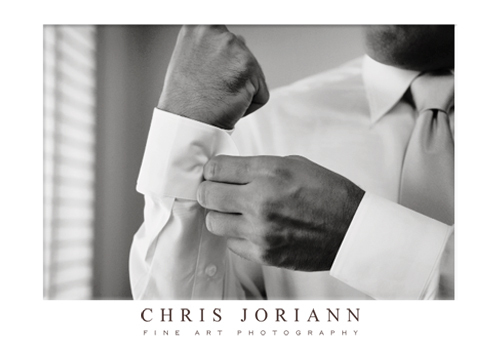 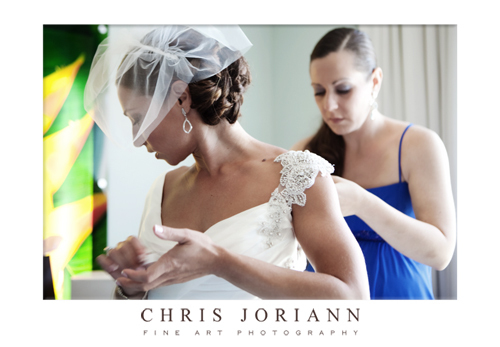 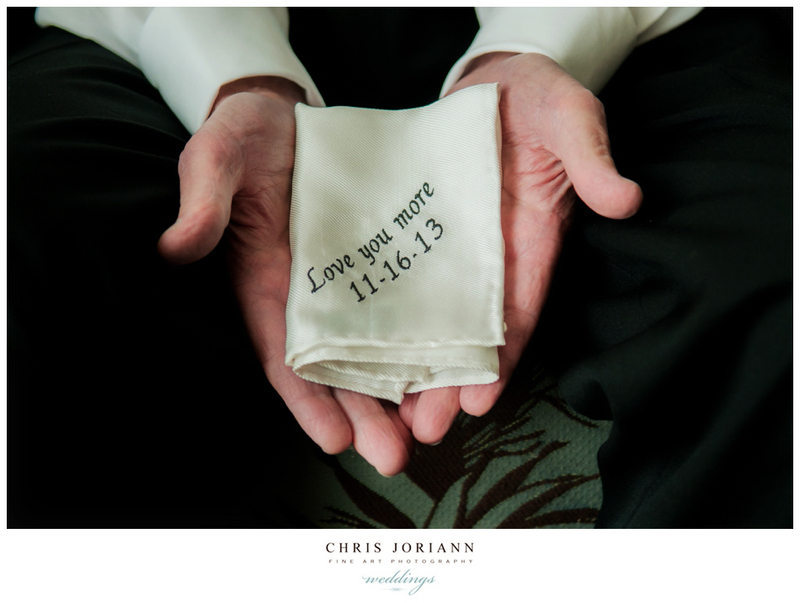 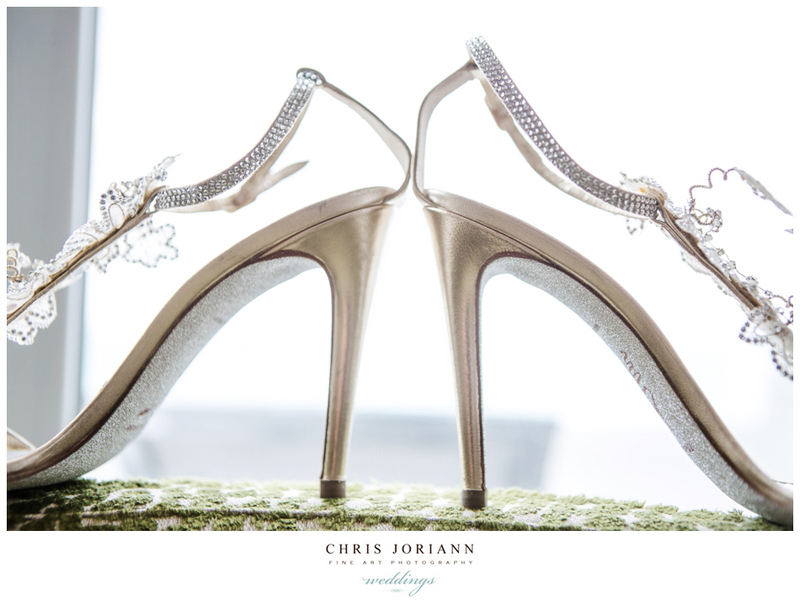 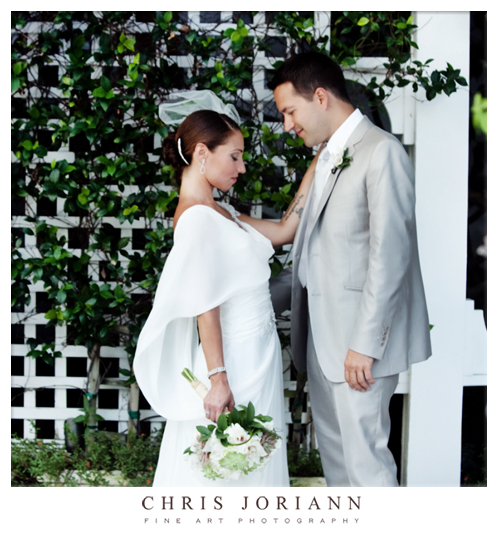 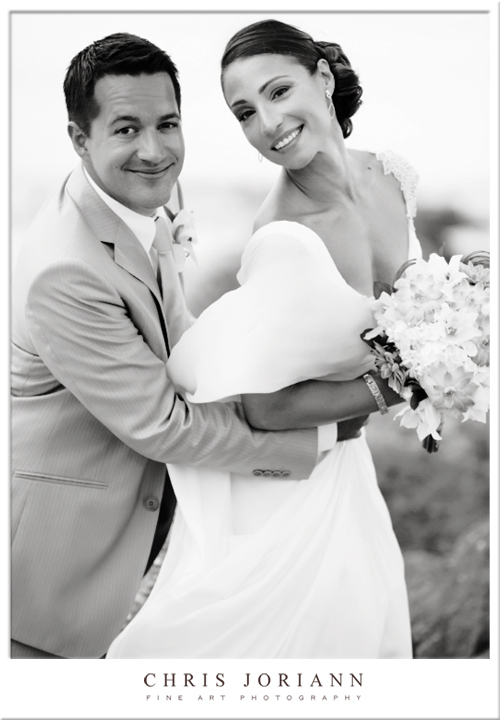 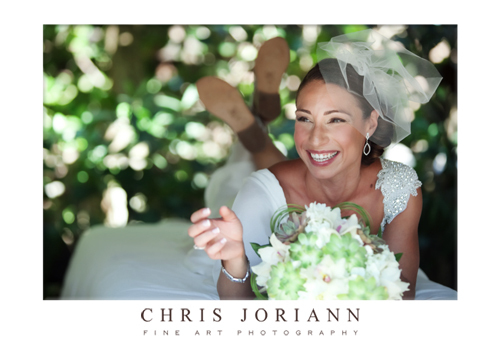 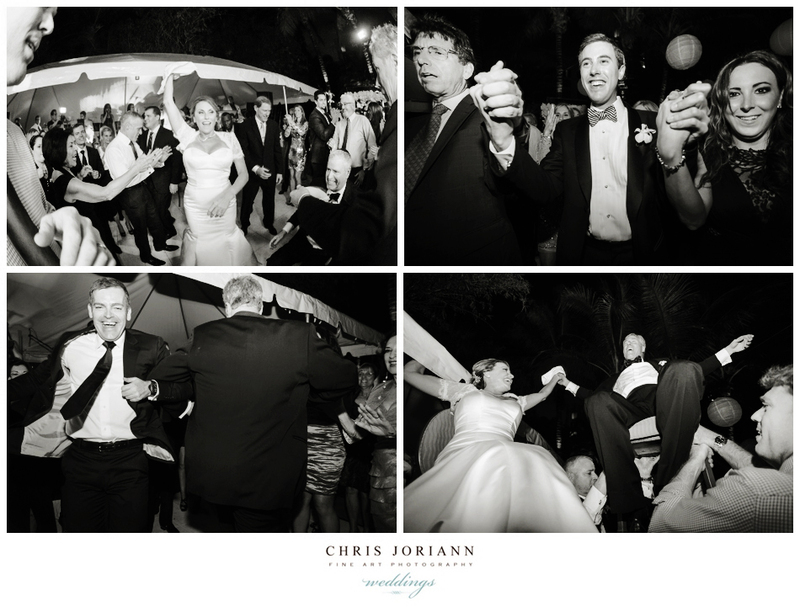 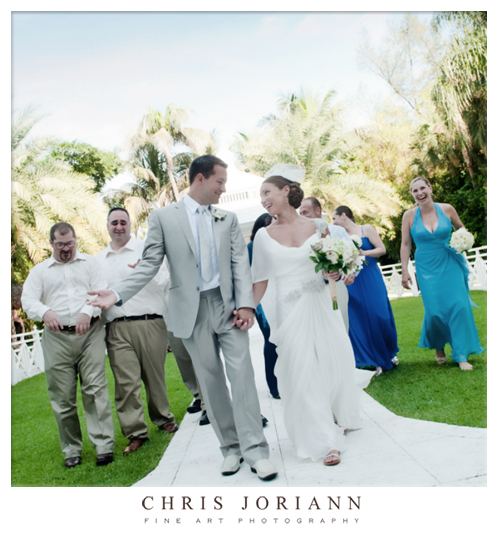 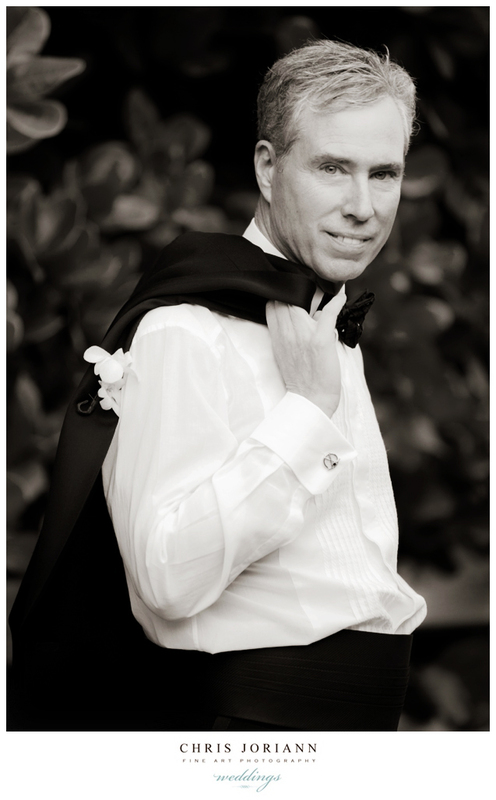 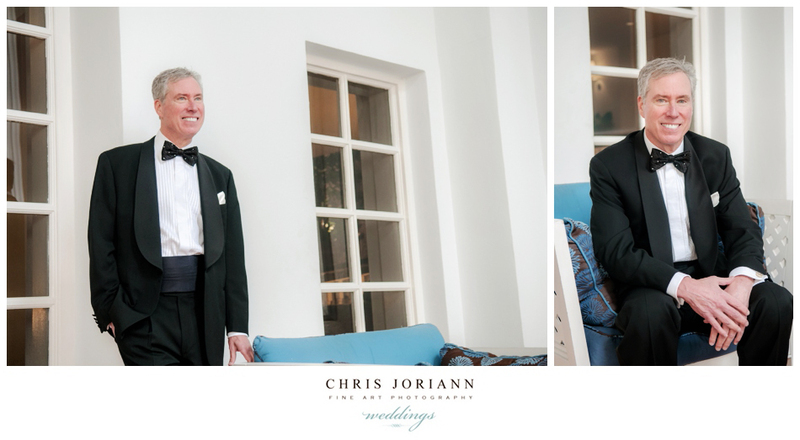 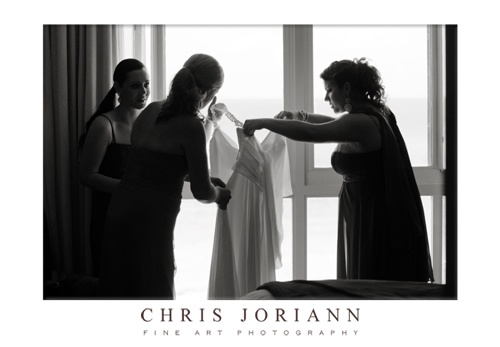 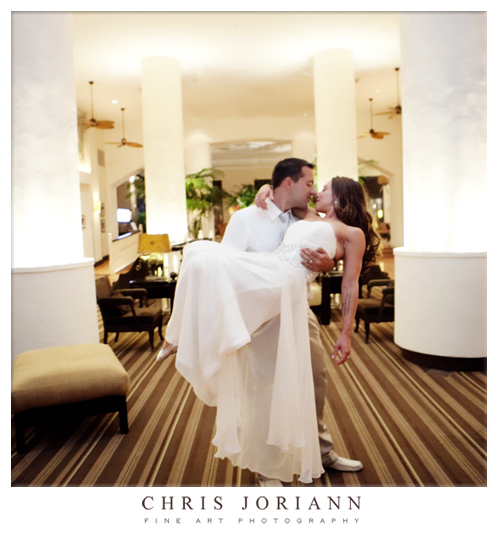 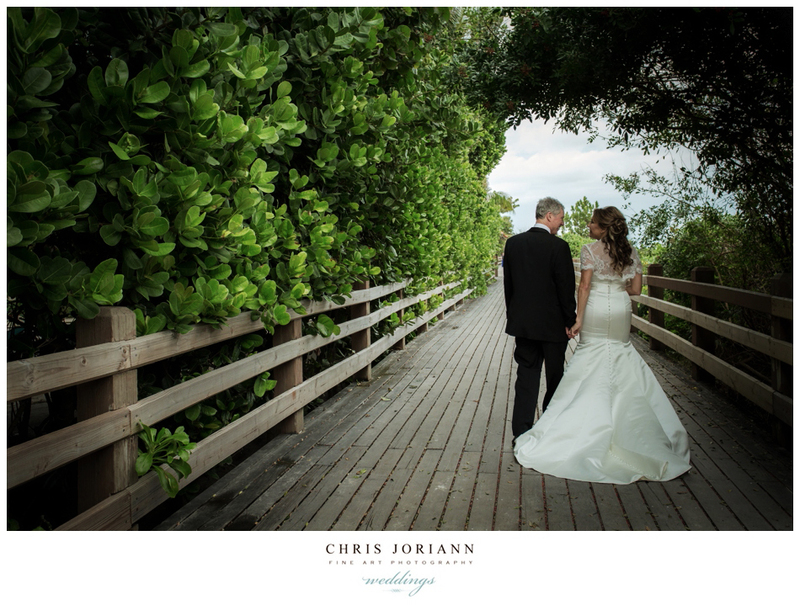 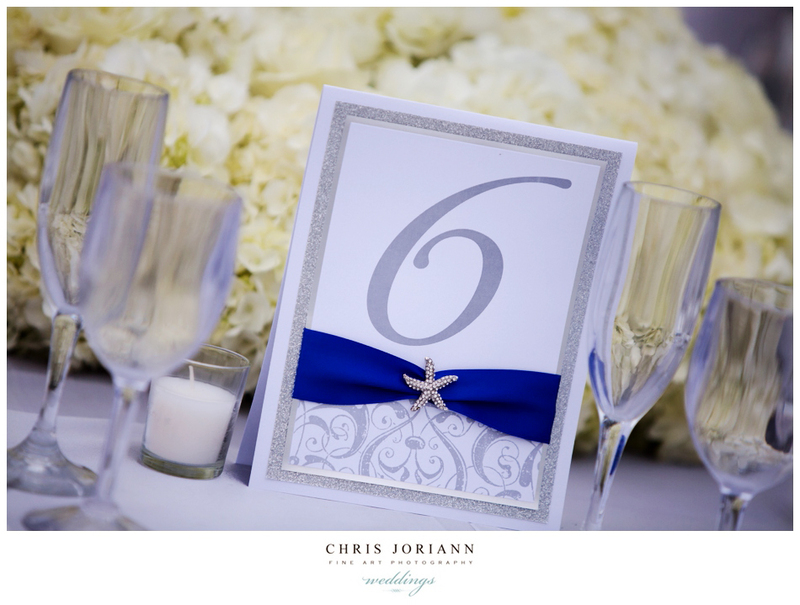 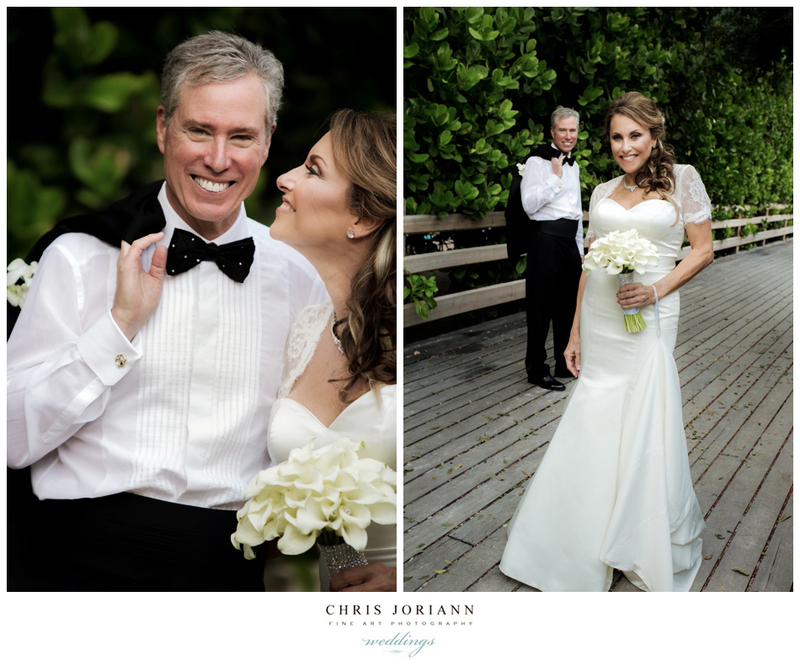 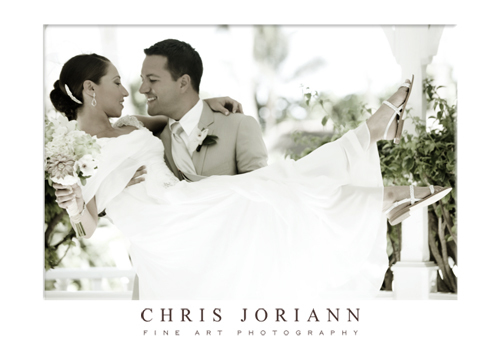 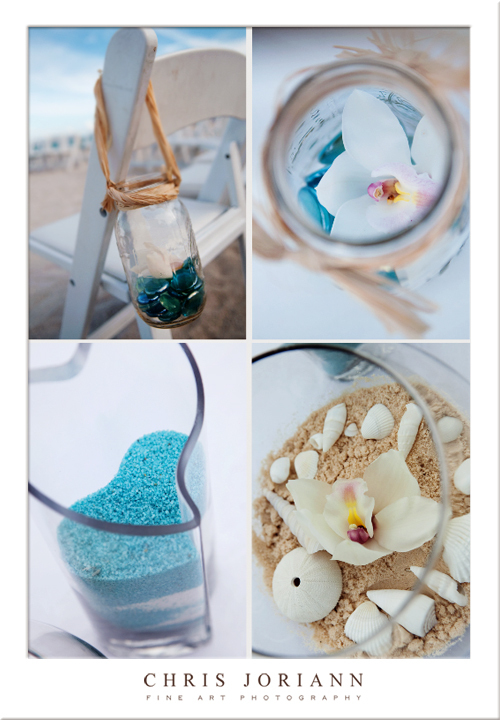 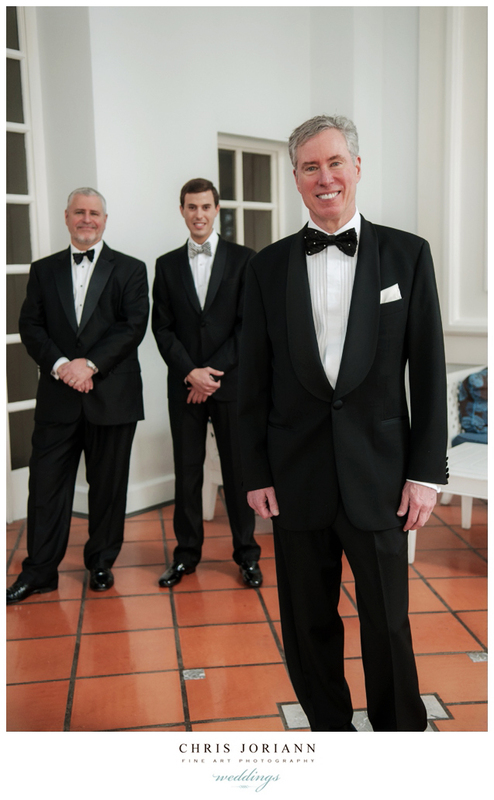 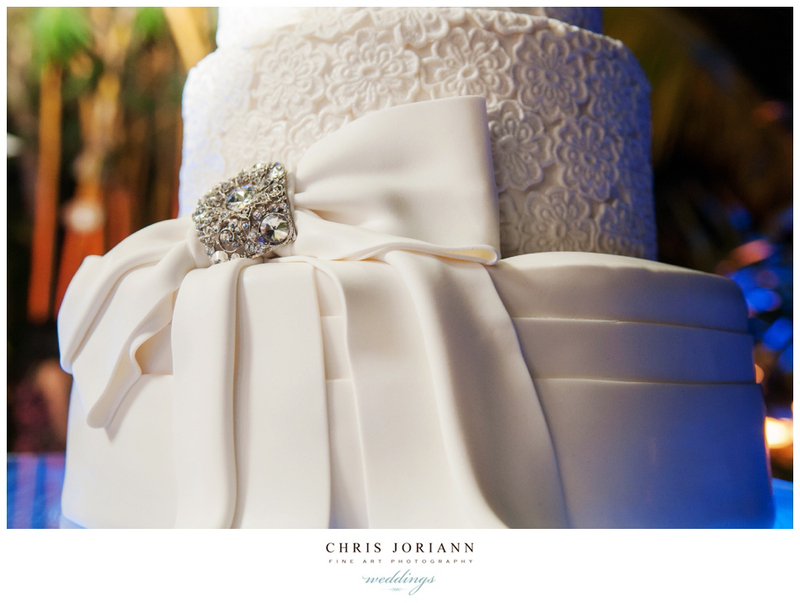 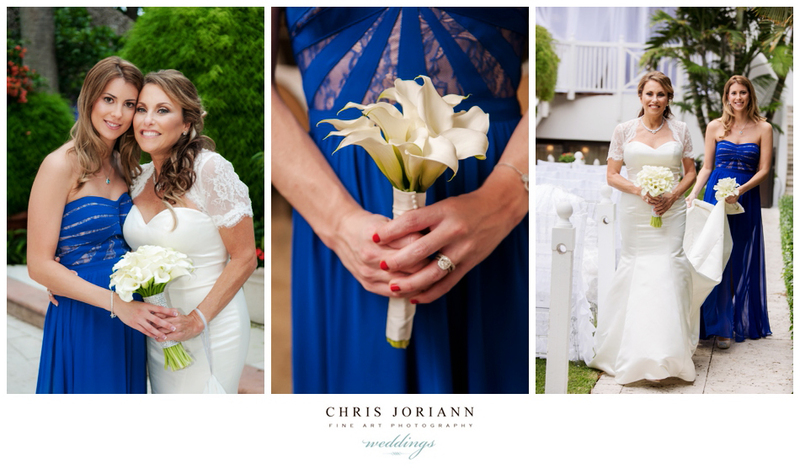 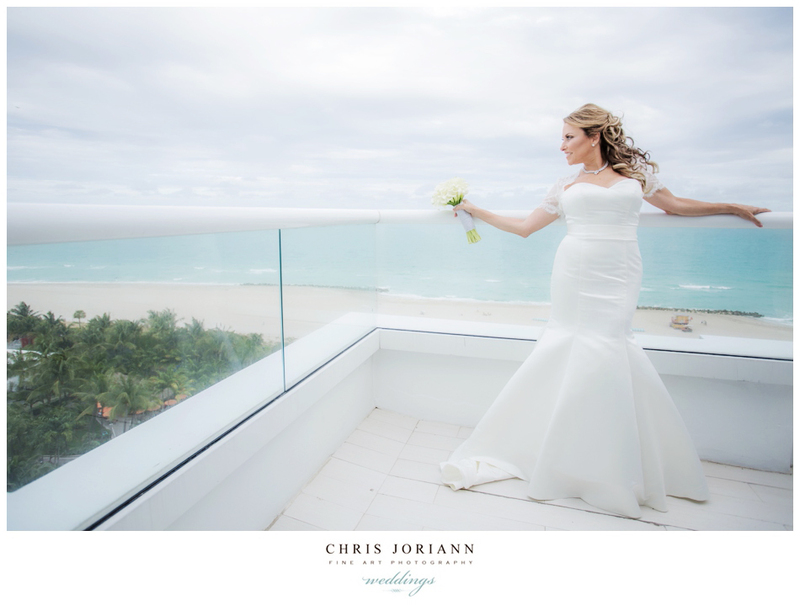 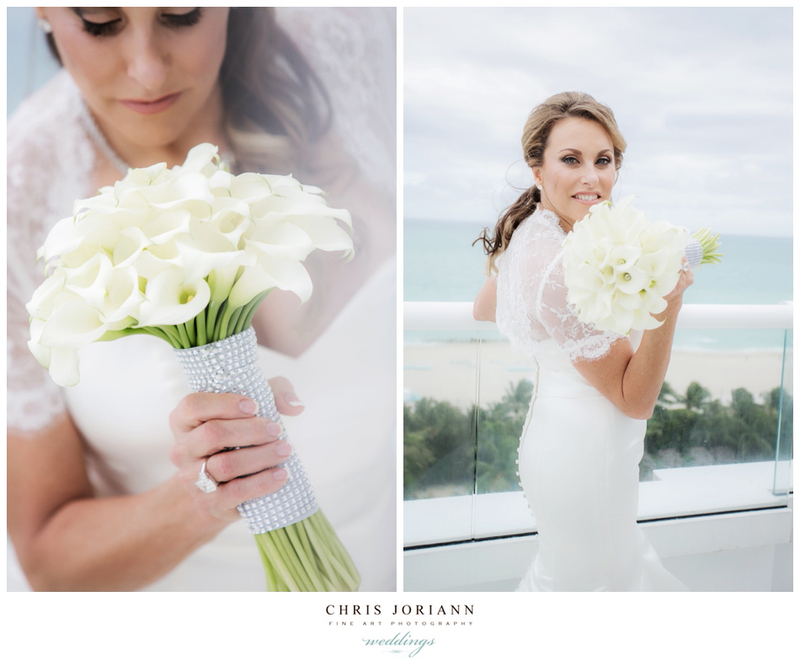 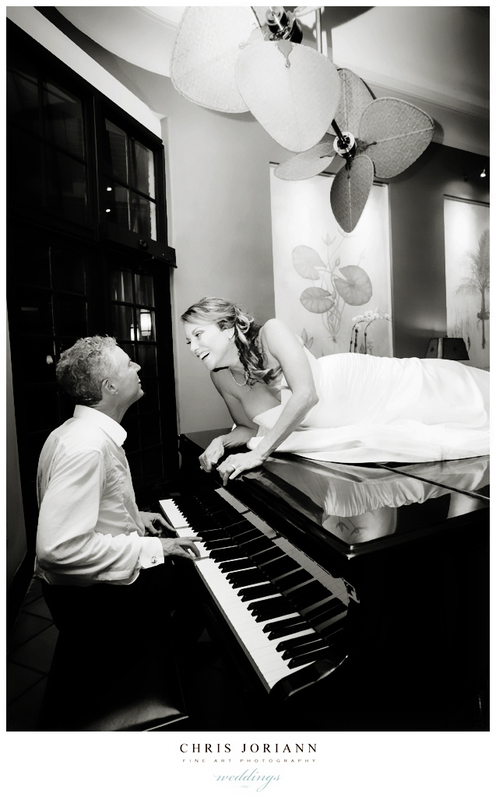 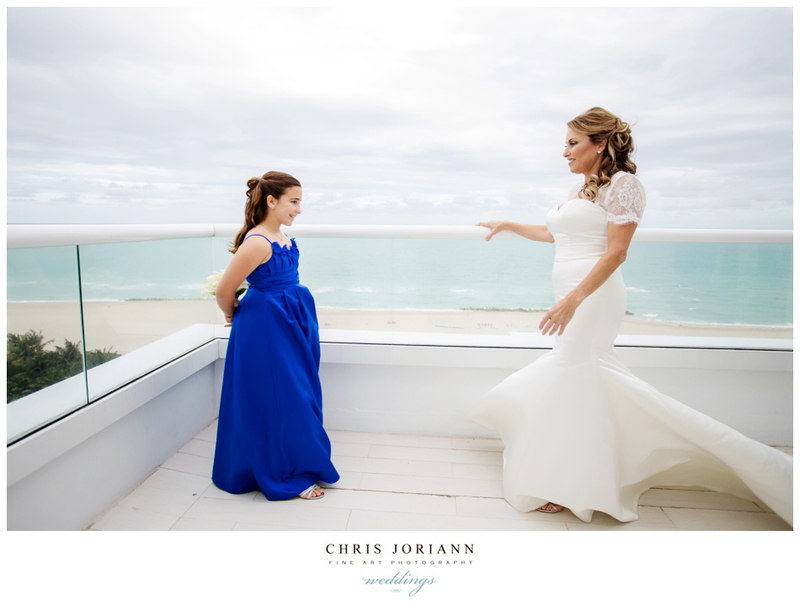 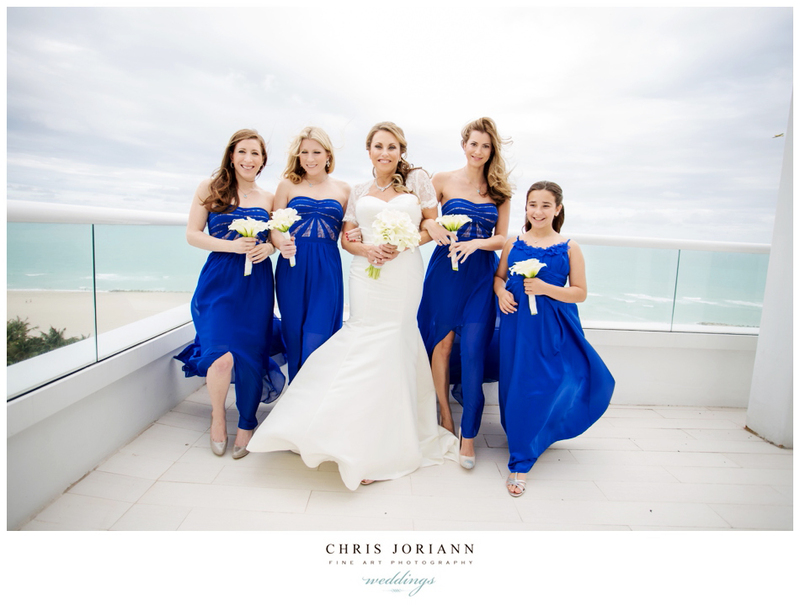 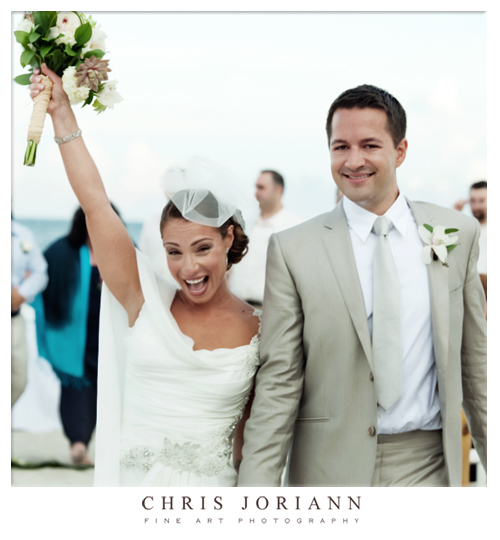 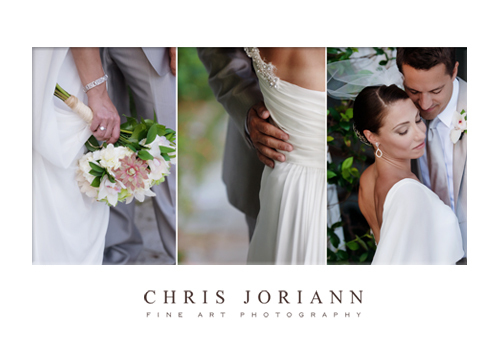 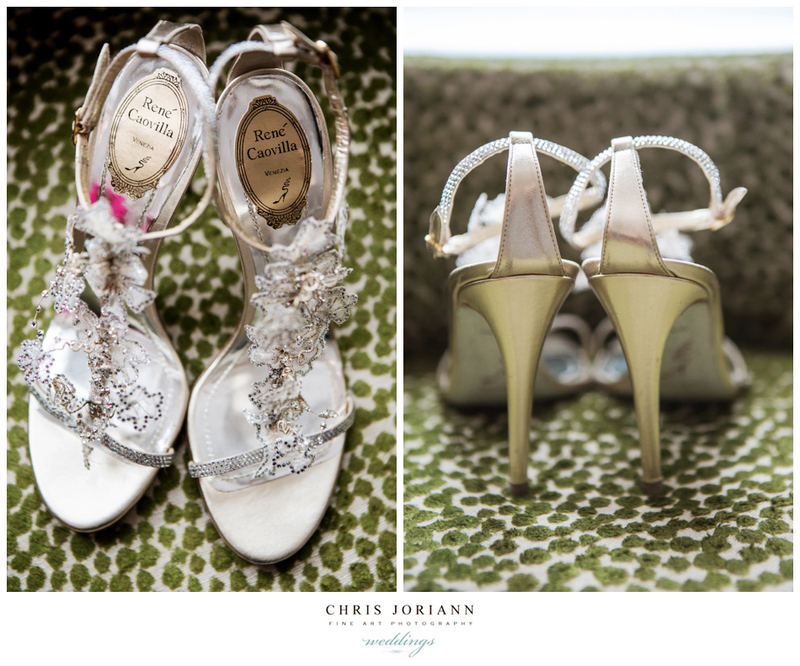 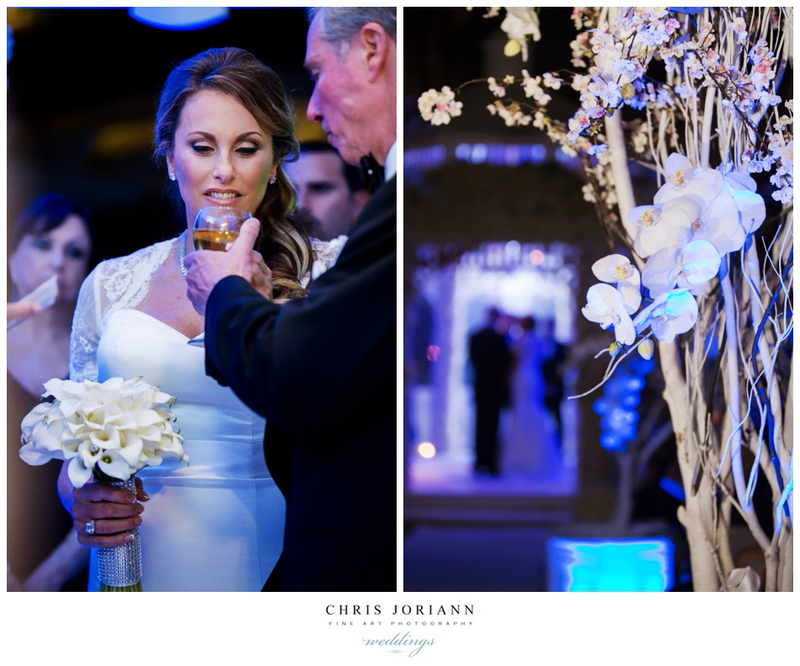 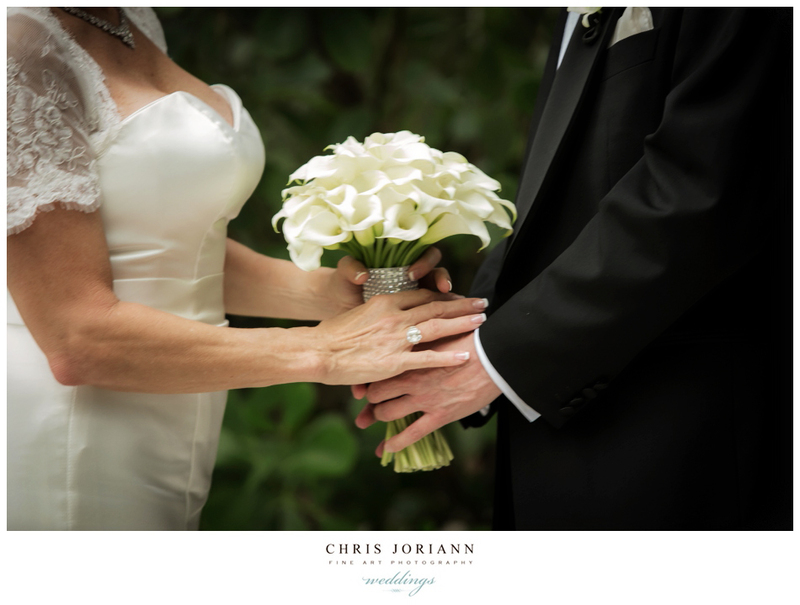 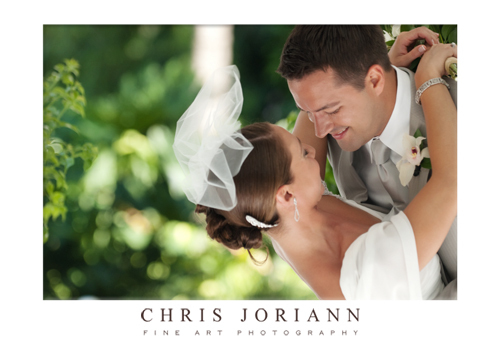 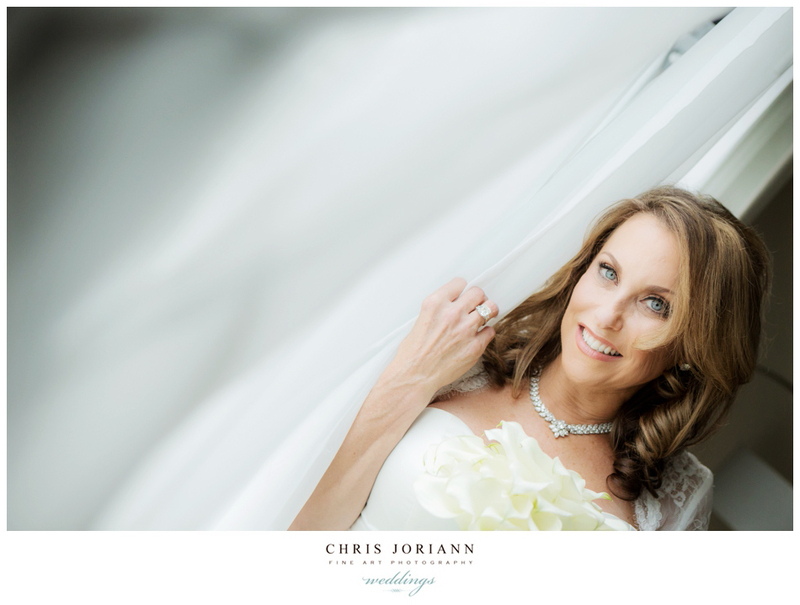 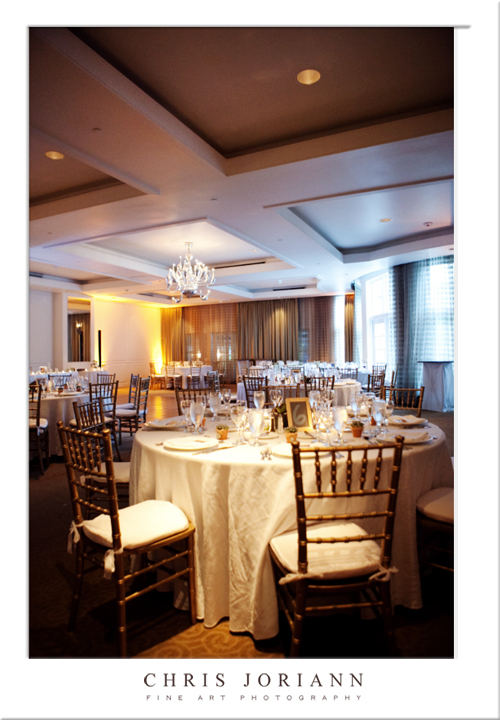 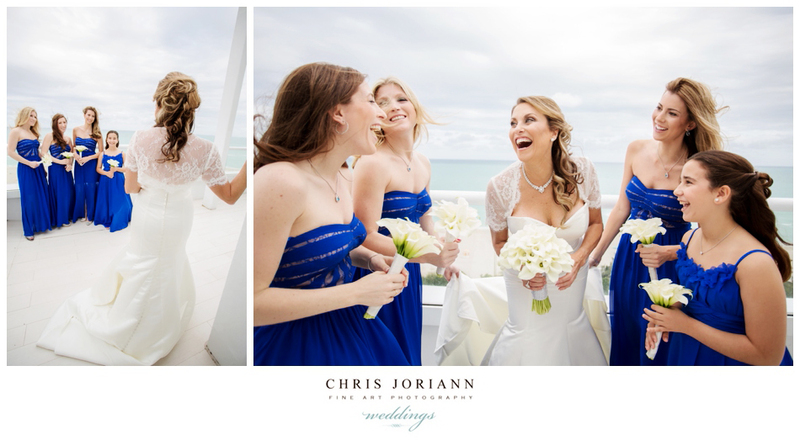 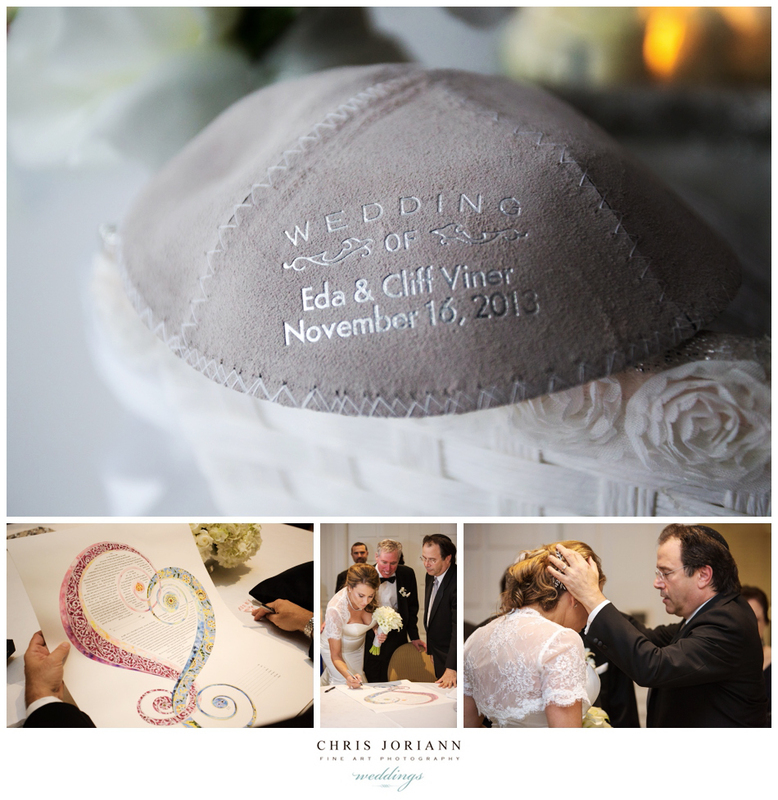 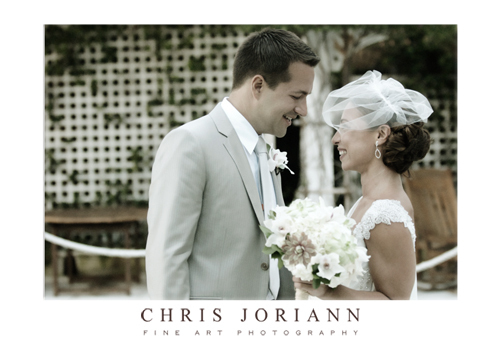 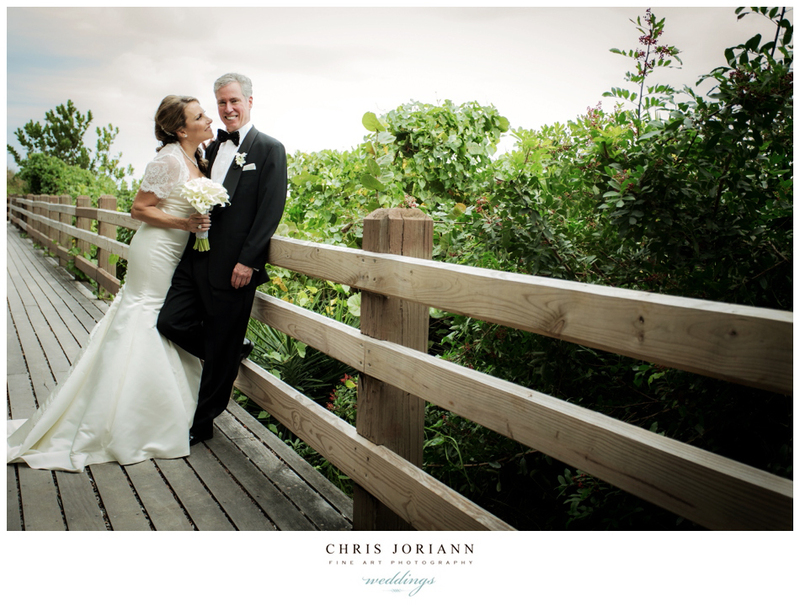 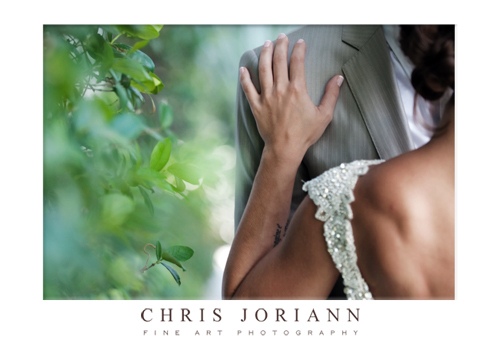 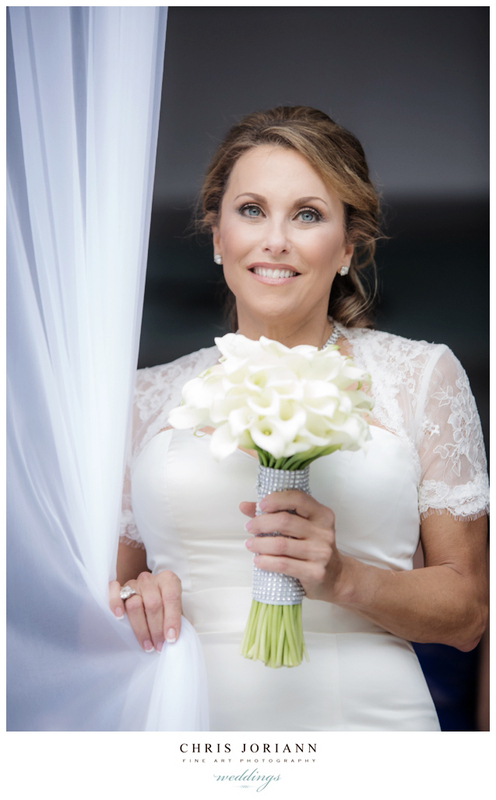 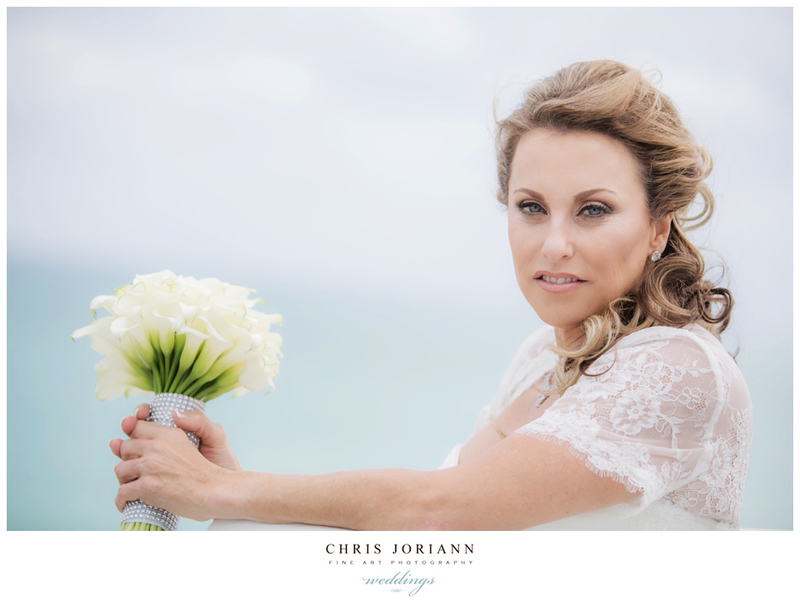 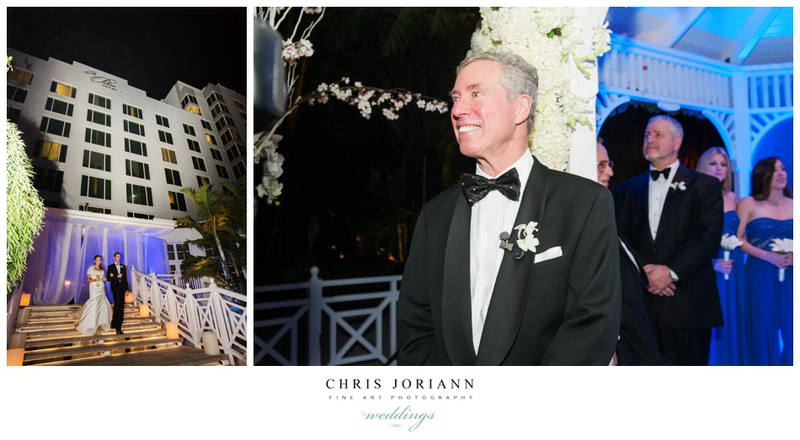 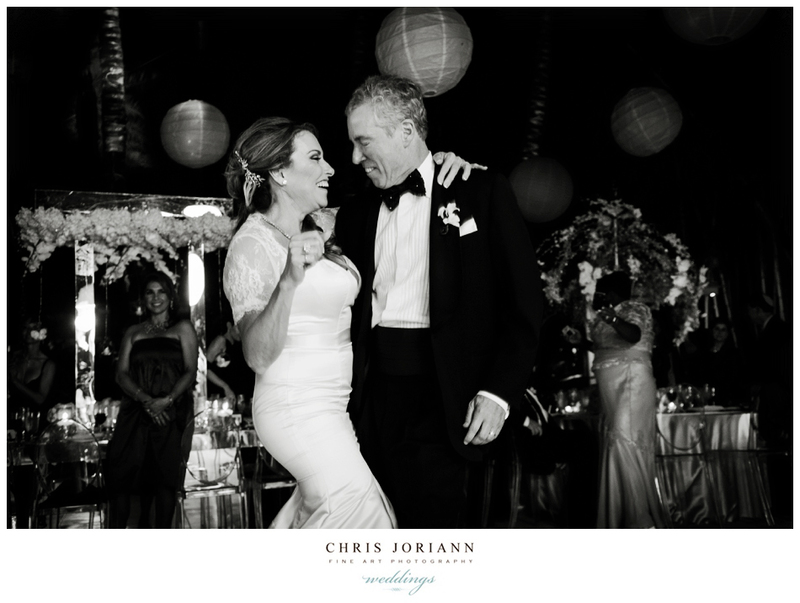 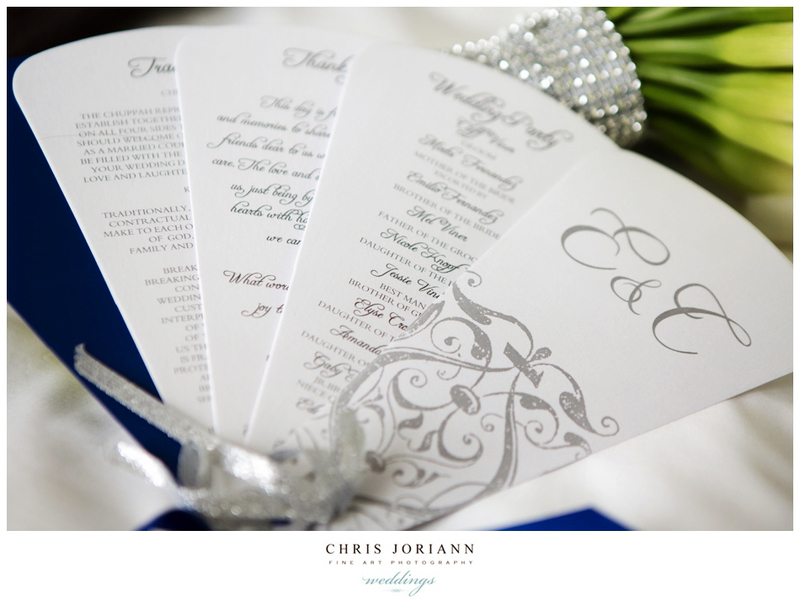 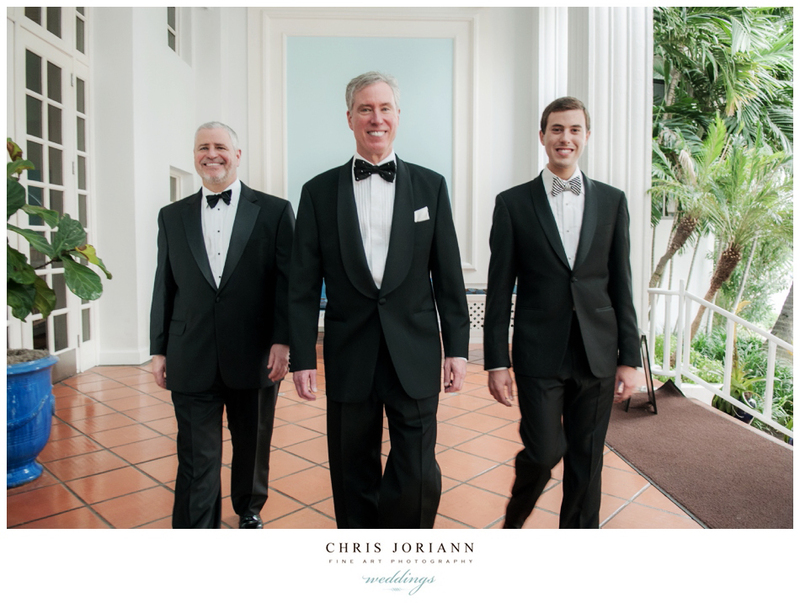 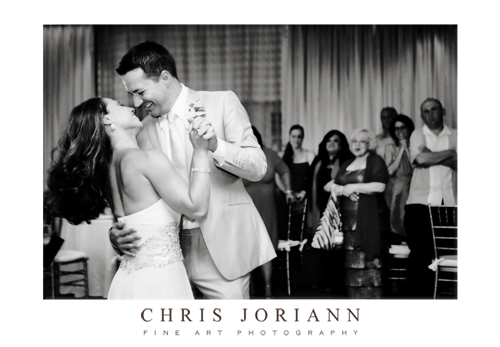 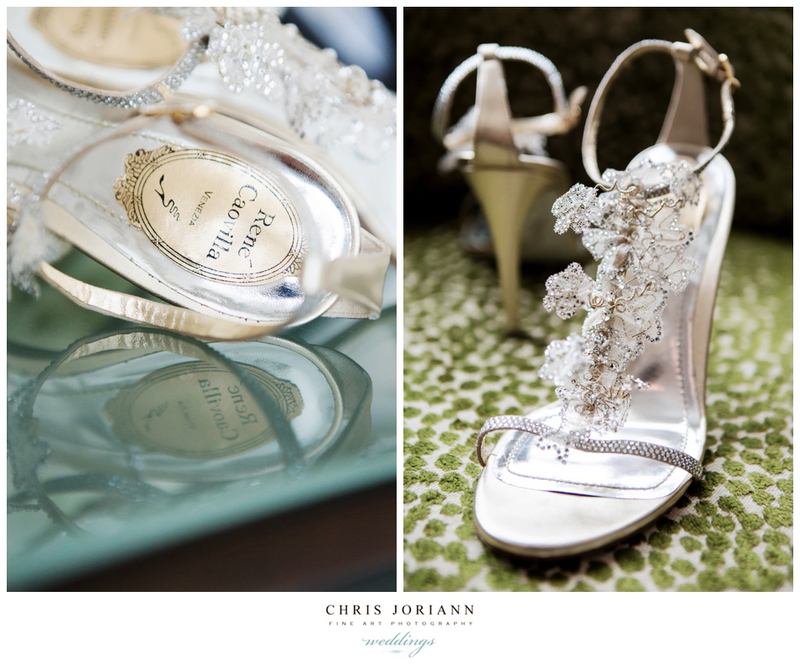 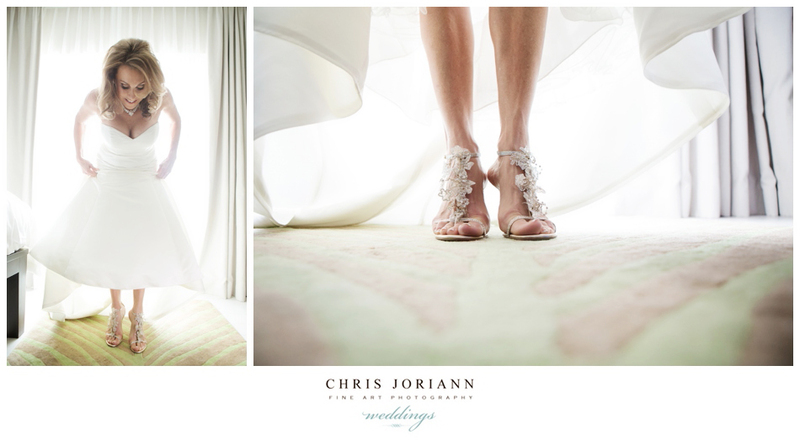 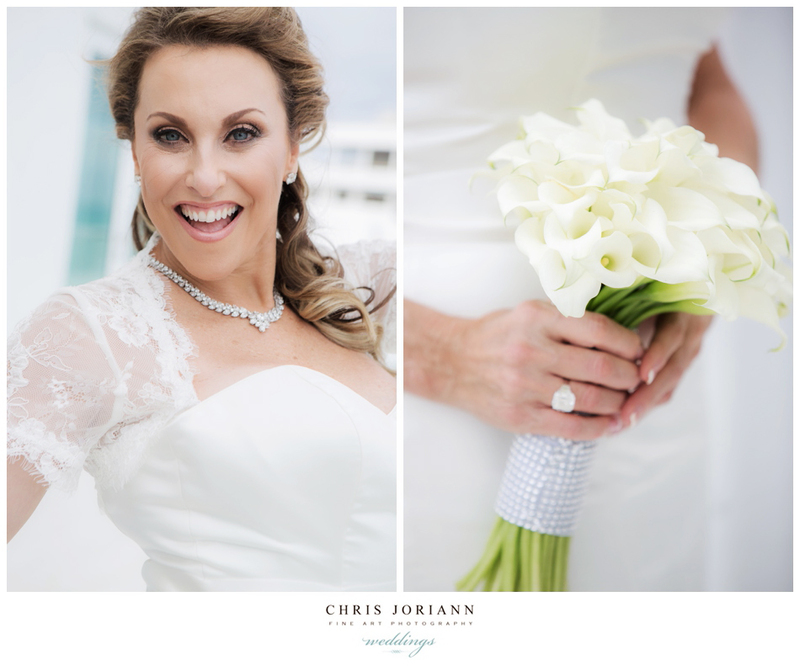 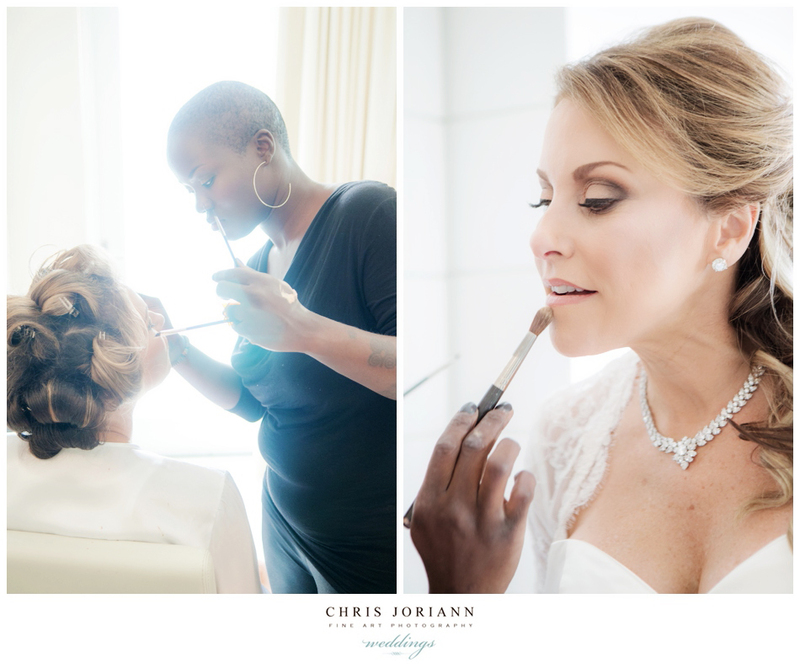 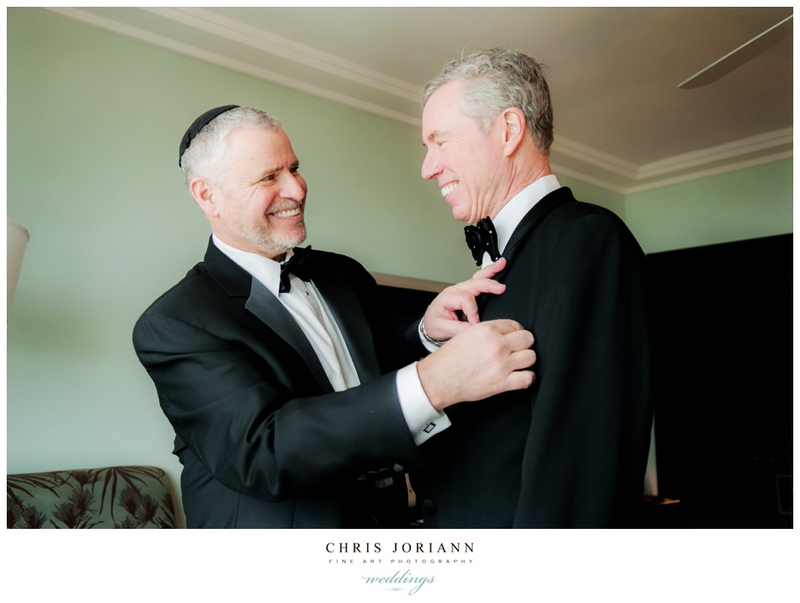 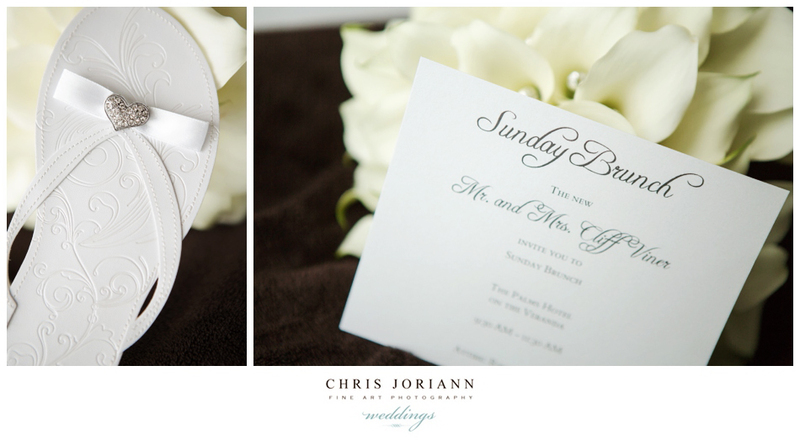 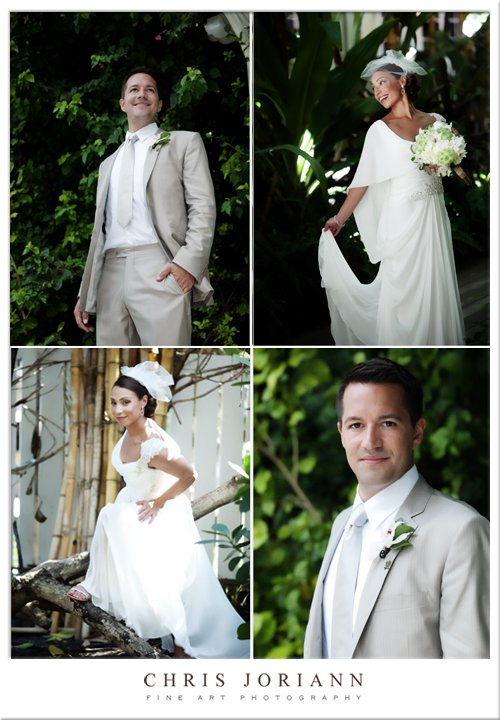 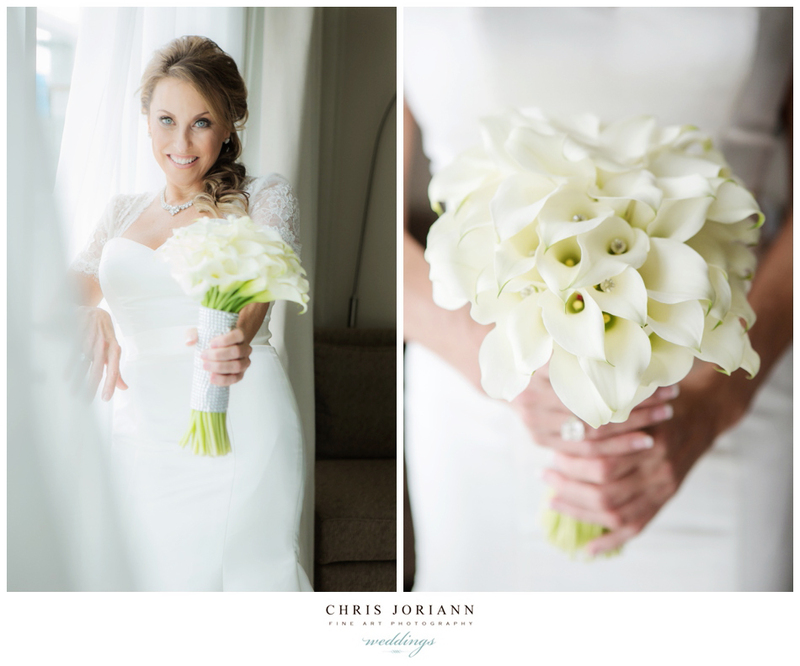 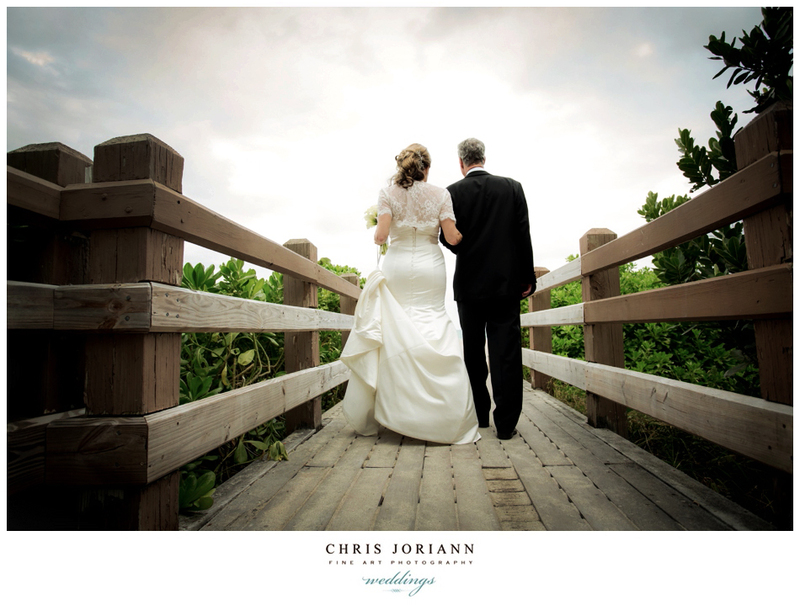 Eda + Cliff’s South Beach wedding took place at The Palms Hotel + Spa. 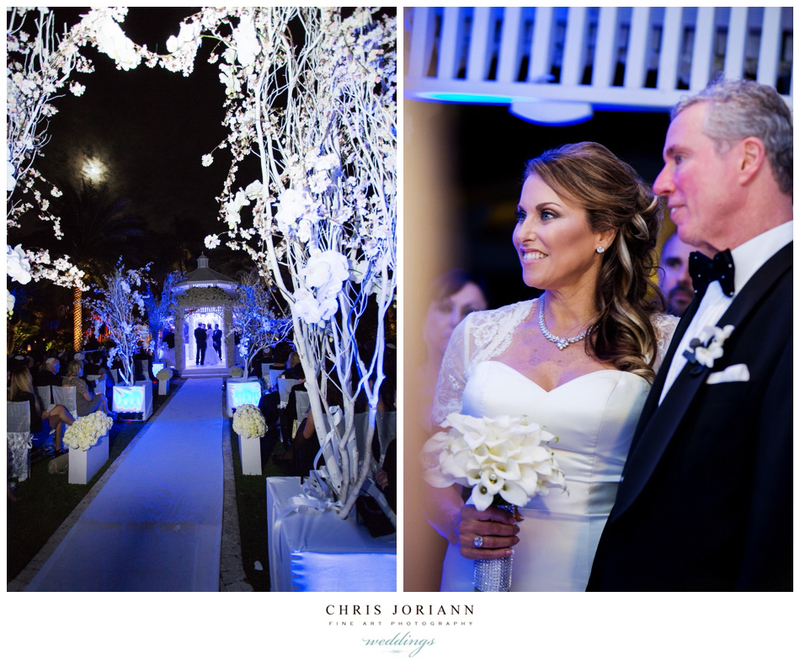 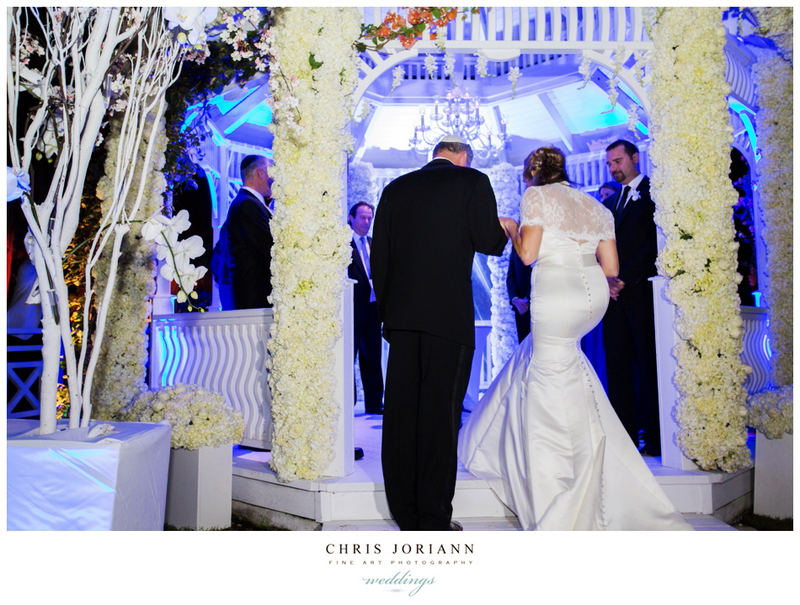 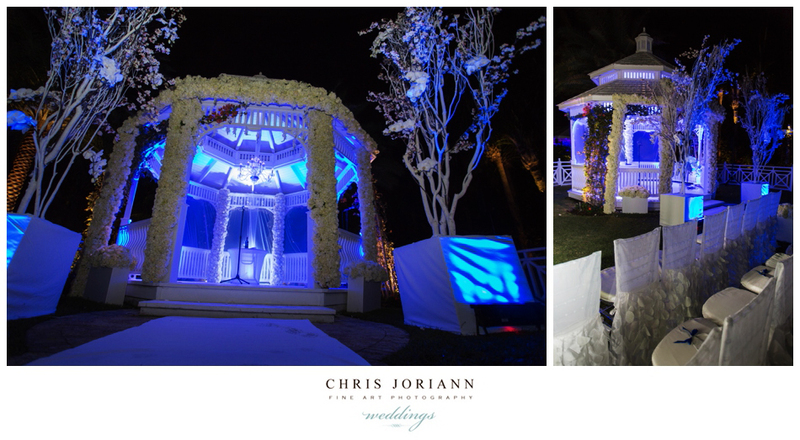 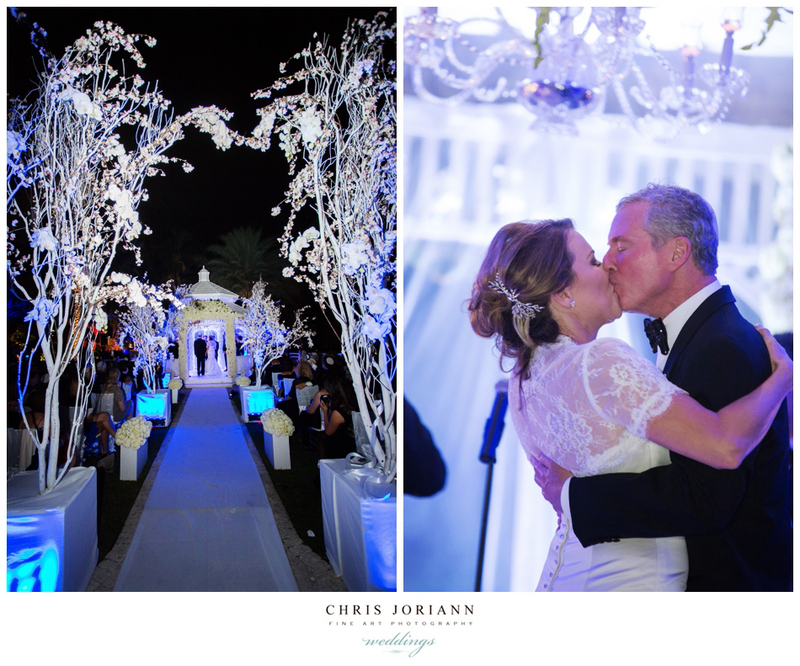 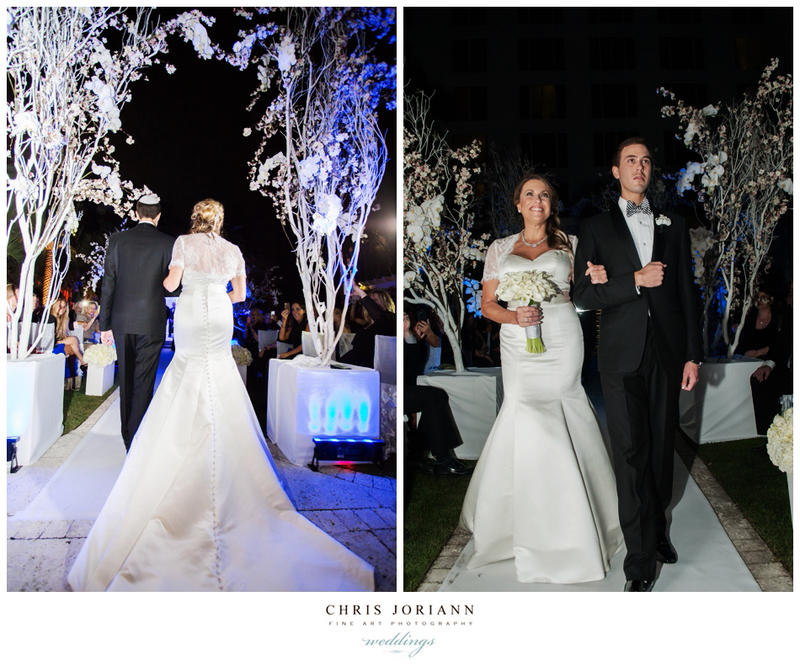 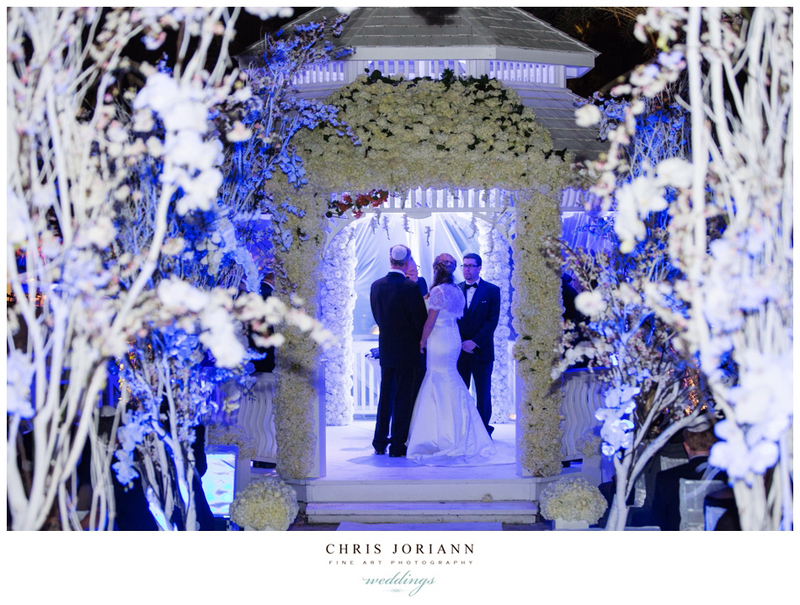 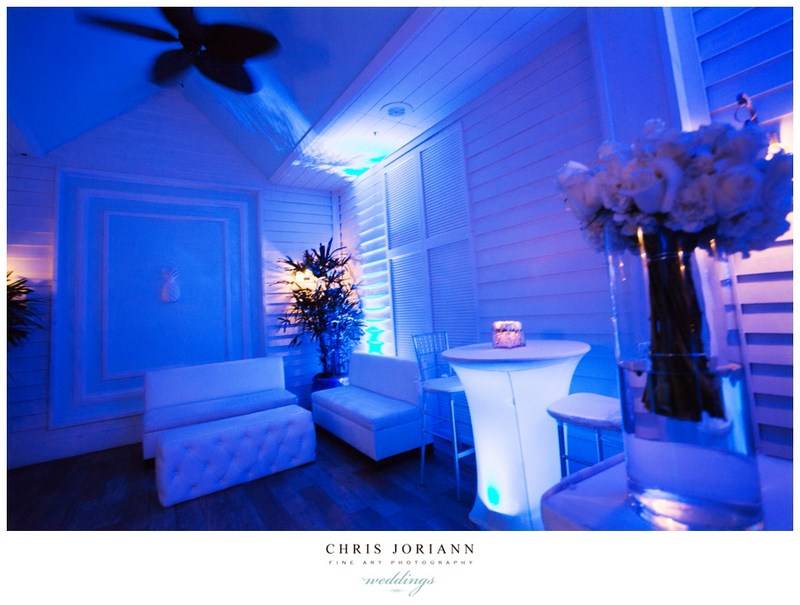 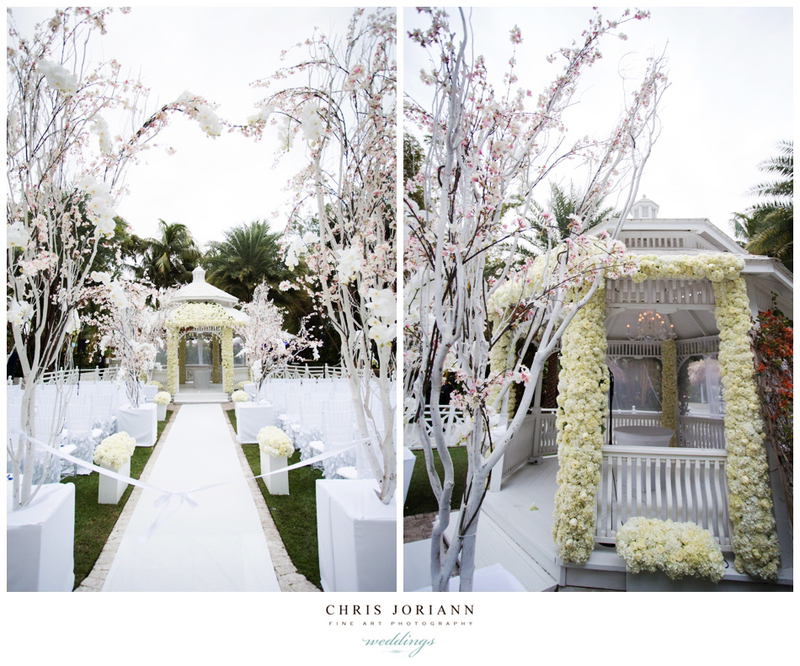 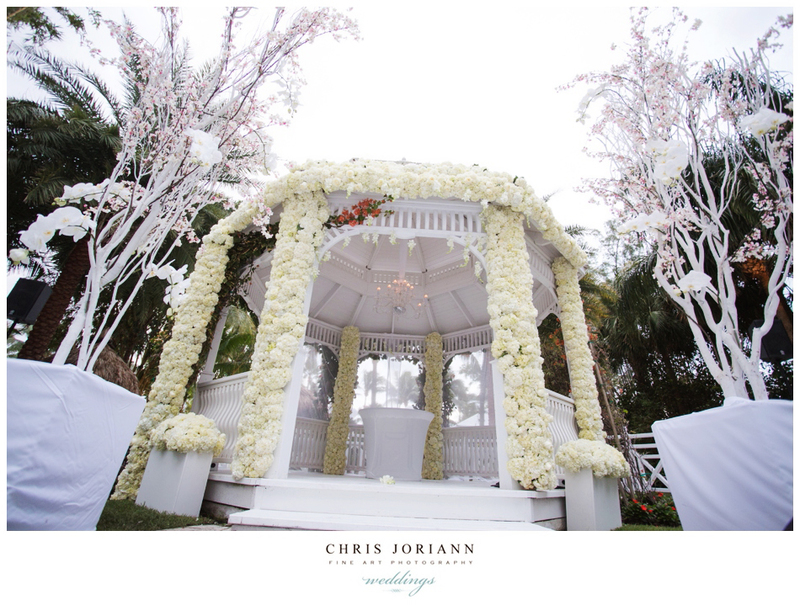 Their blue moonlit Miami ceremony was held beneath the white floral gazebo. 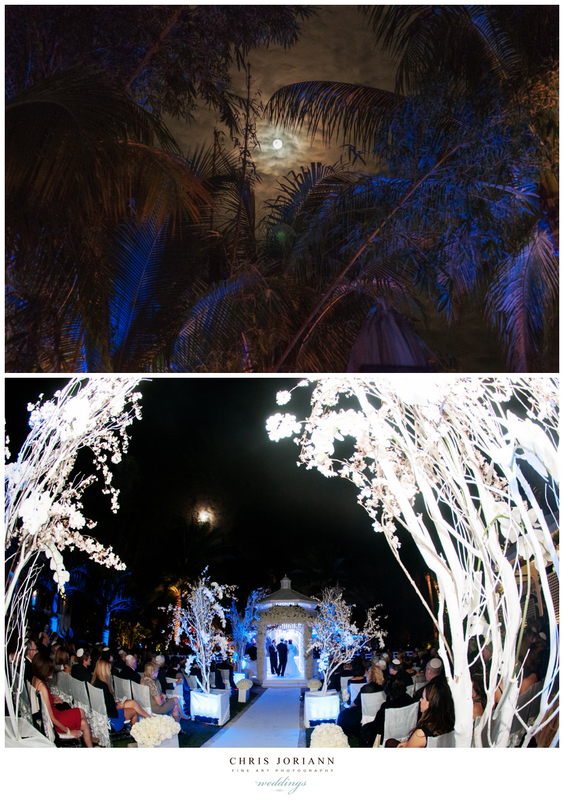 As the bride descended the staircase dressed in haute couture, she was escorted down the birch branches and orchids lined aisles by her son. 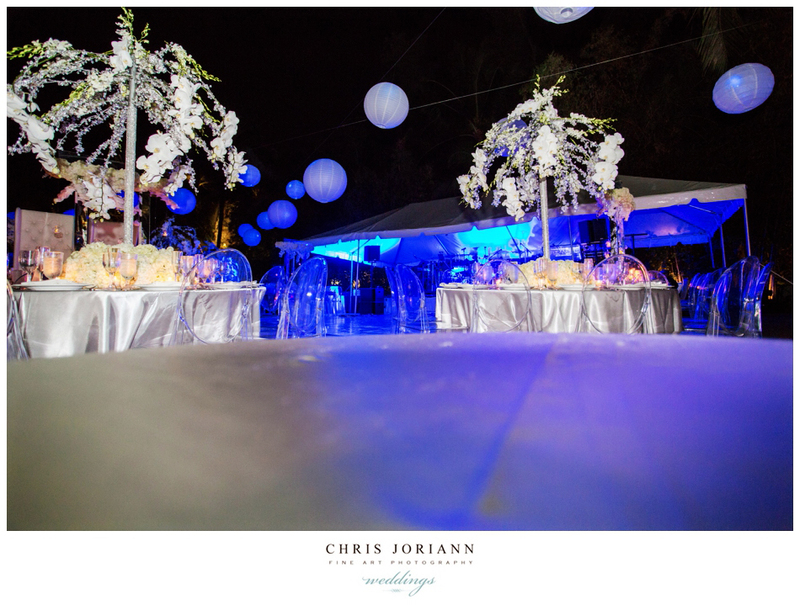 An outdoor reception followed. 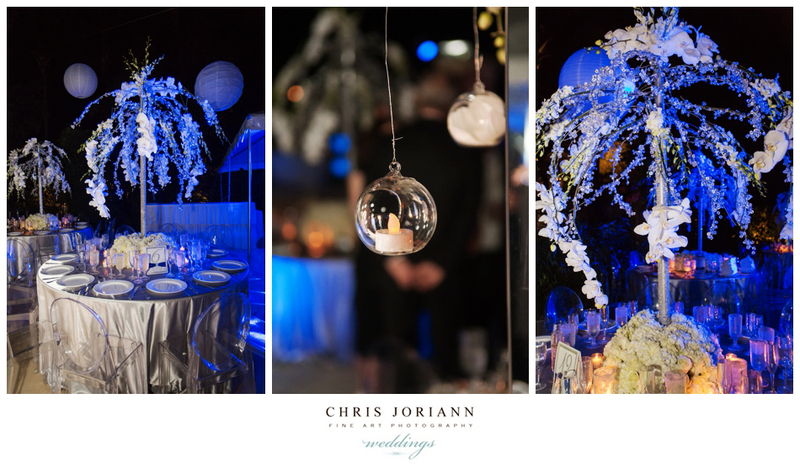 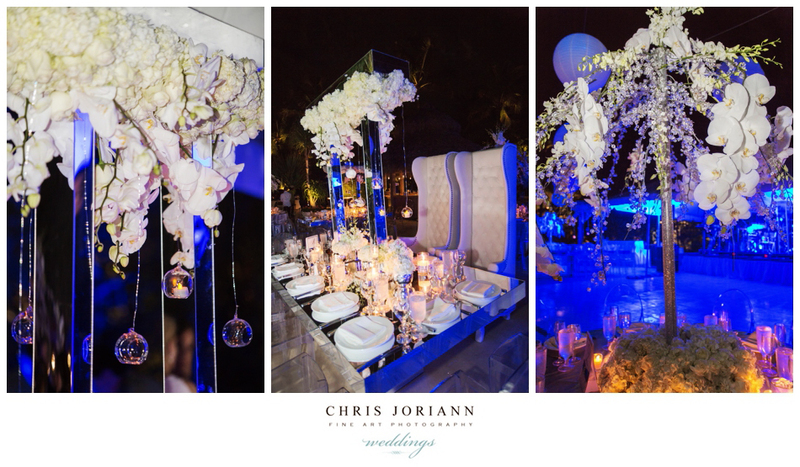 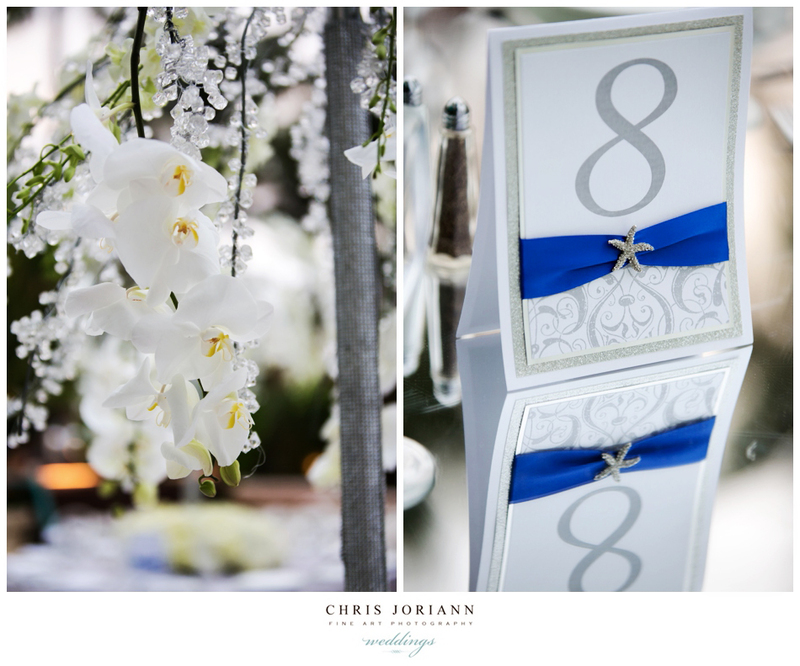 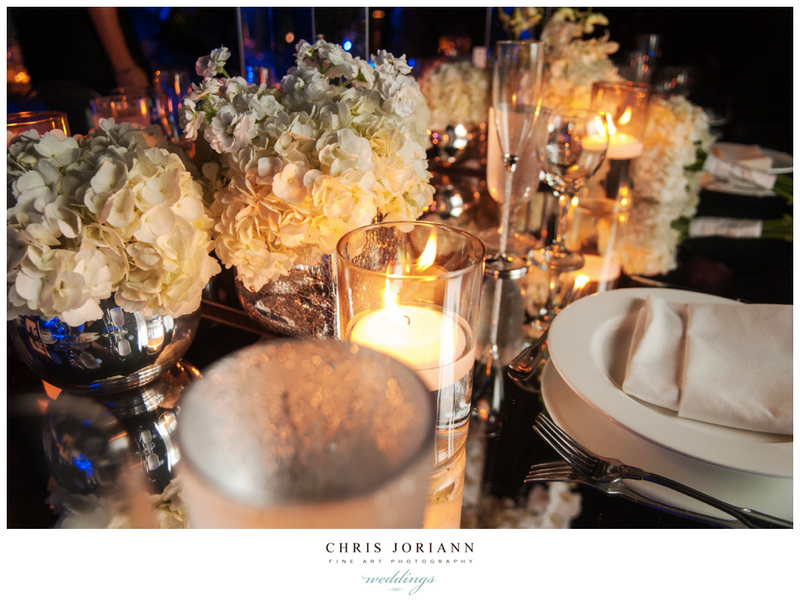 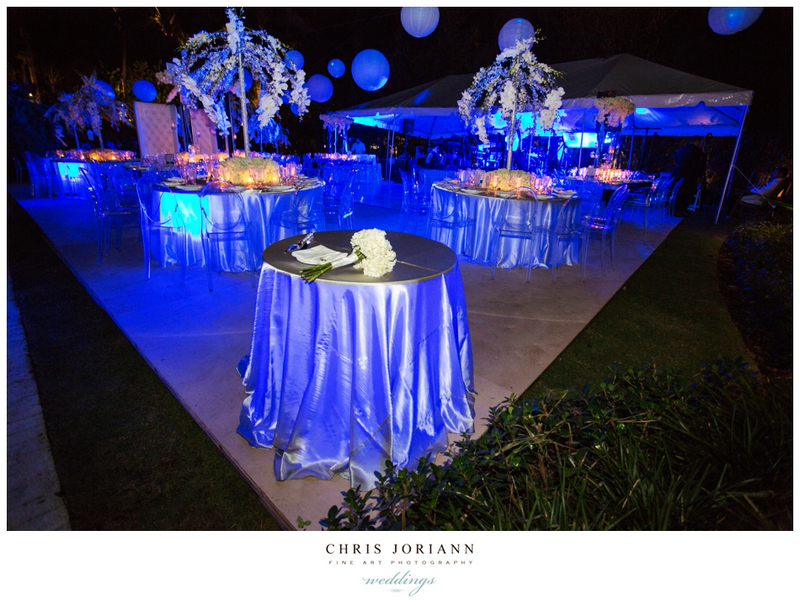 The space, featuring mirrored table tops with white orchid trees illuminated in hues of blue, surrounded guests who danced the night away beneath the stars. 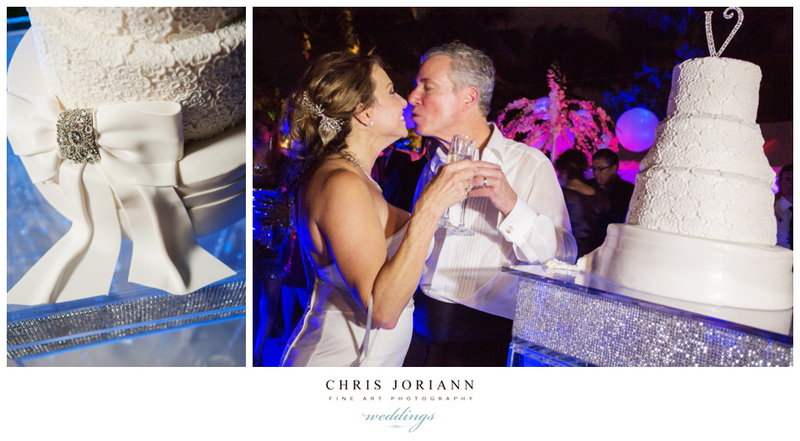 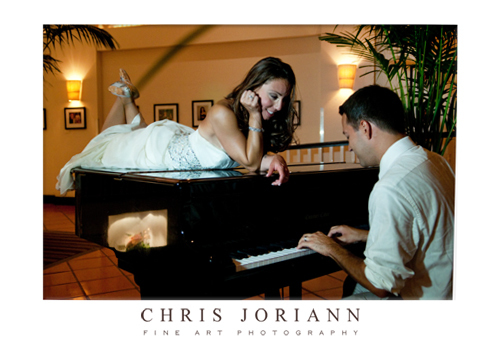 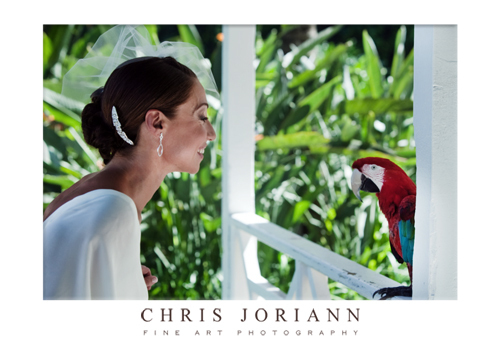 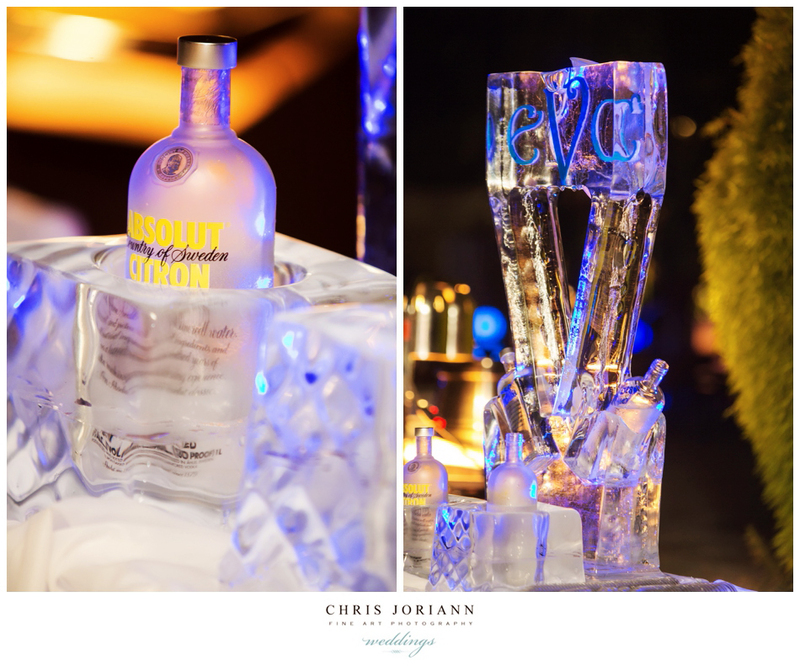 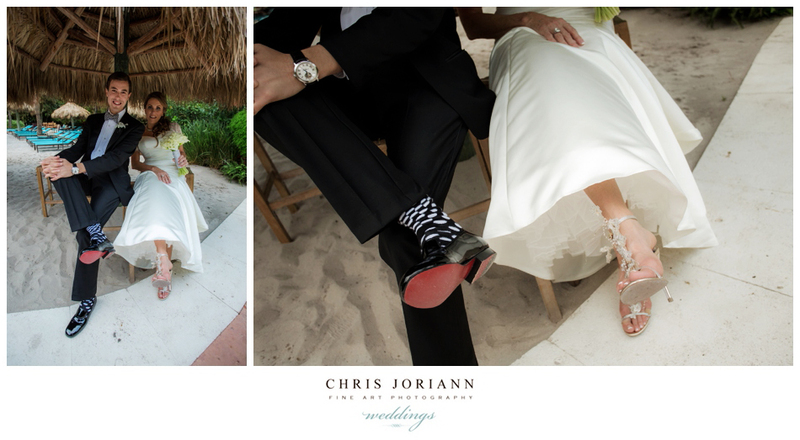 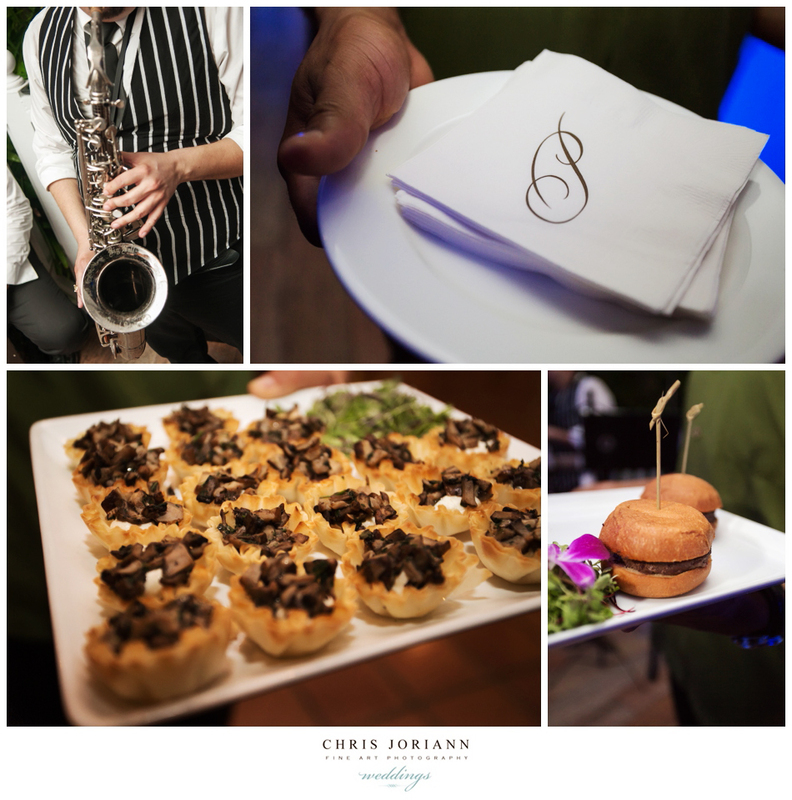 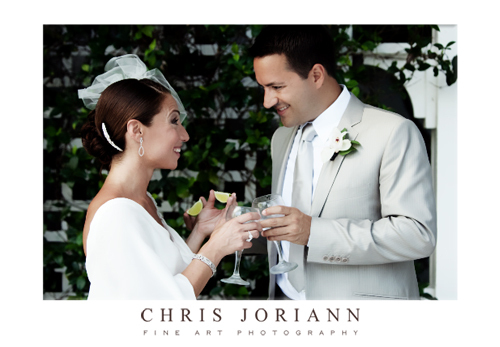 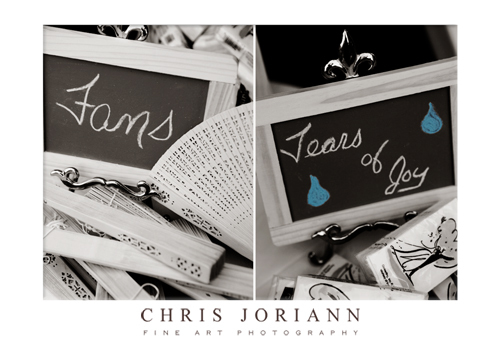 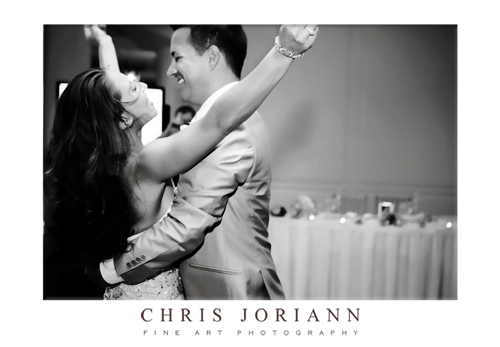 This artistic pair infused so much of their personalities into their fabulous SoBE destination wedding at The Palms Hotel & Spa in Miami. 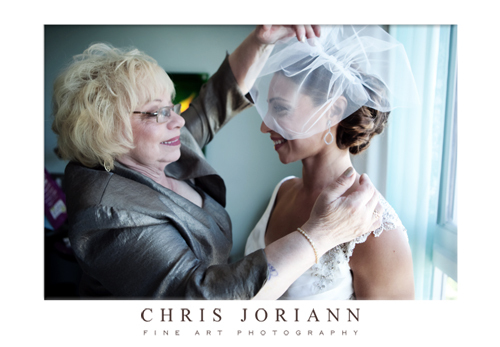 Alissa’s retro-glam veil was the perfect choice. 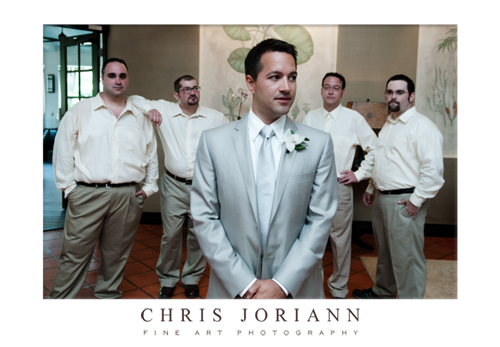 As was Justins, silver tux. 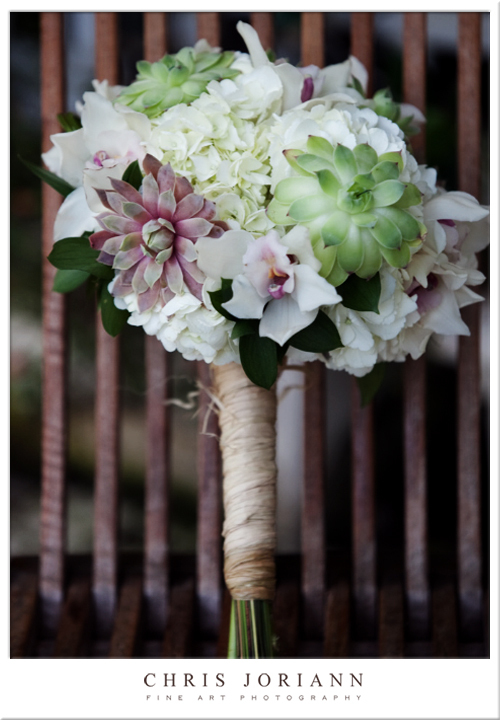 The floral theme for the event was “succulents,” and this amazing bouquet designed by Balmelli Creative did not disappoint. 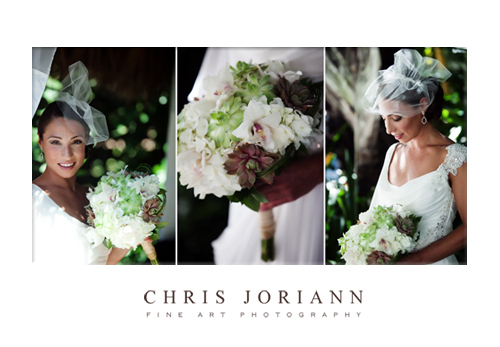 Wrapped in raffia, the mix of orchids, white hydrangeas, and antique rose and green succulents looked unbelievably gorgeous. 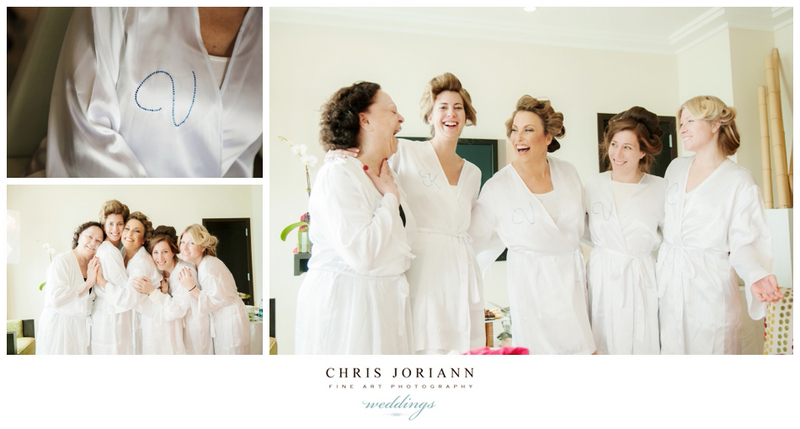 While Anna Maja visited the bride who was having her makeup done in The Palms Spa. 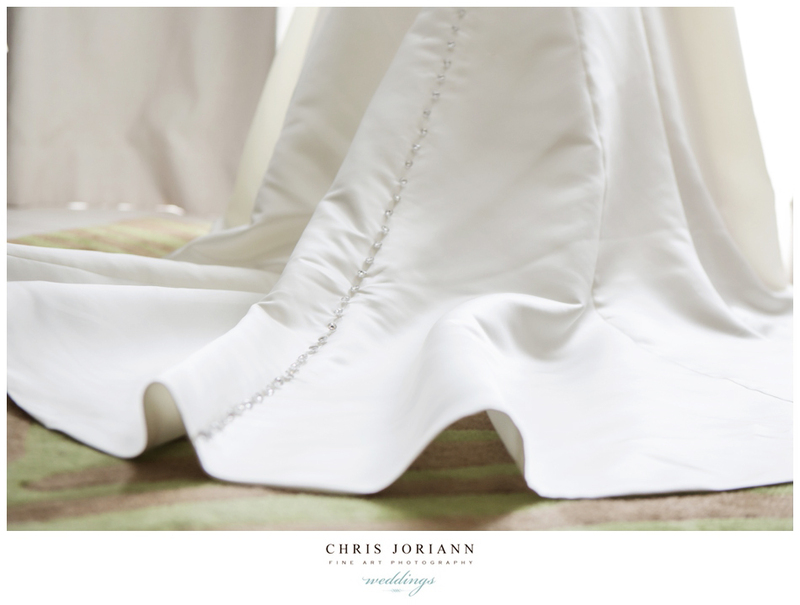 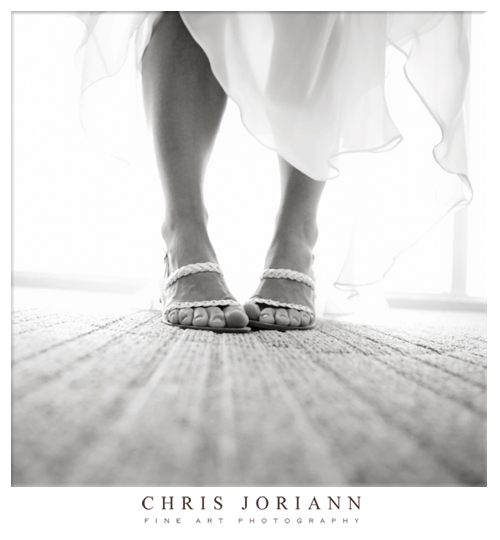 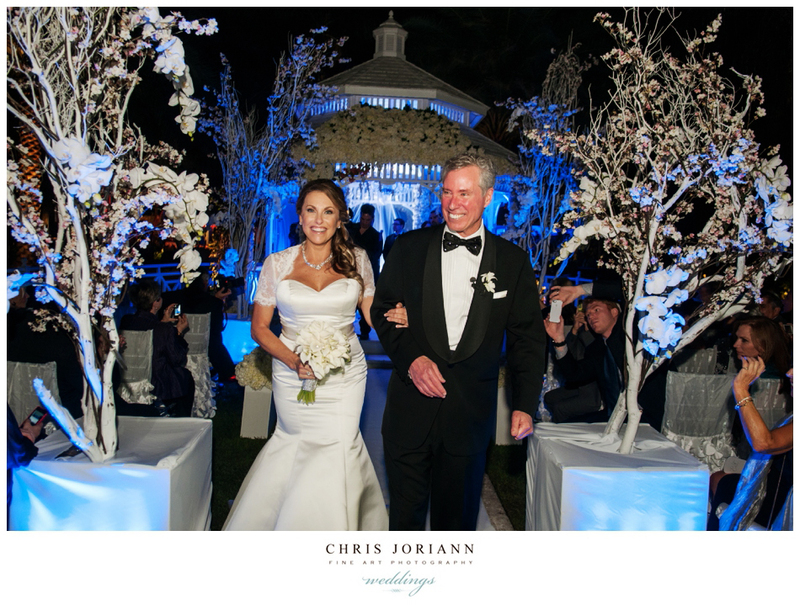 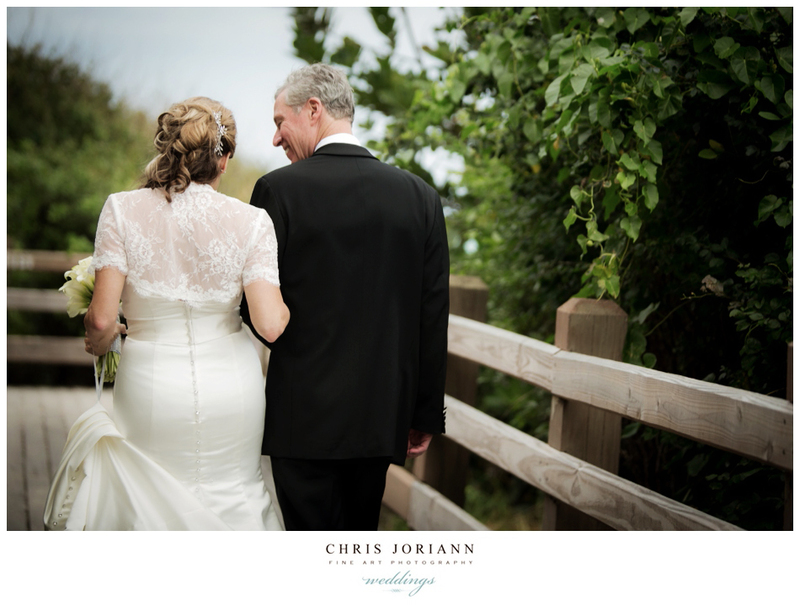 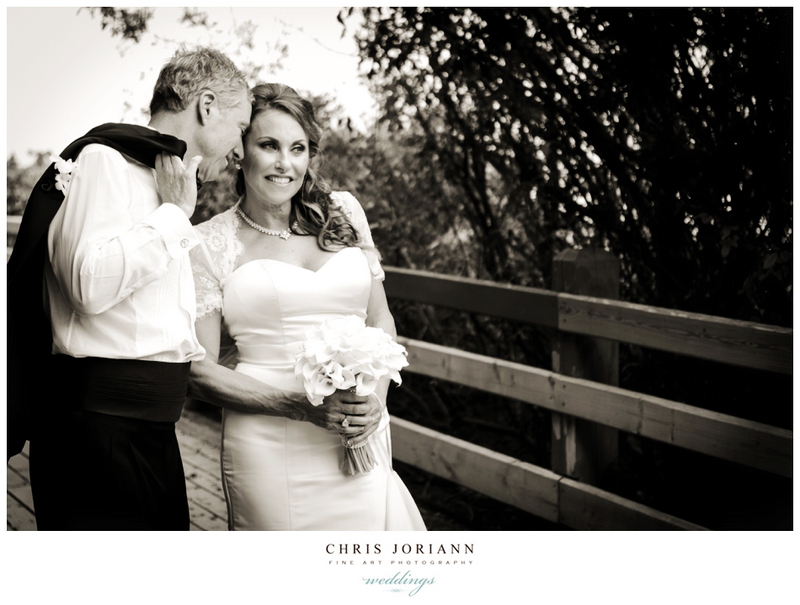 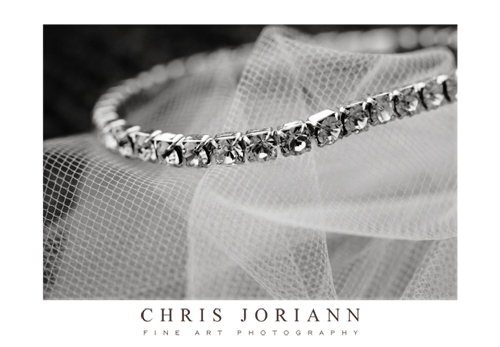 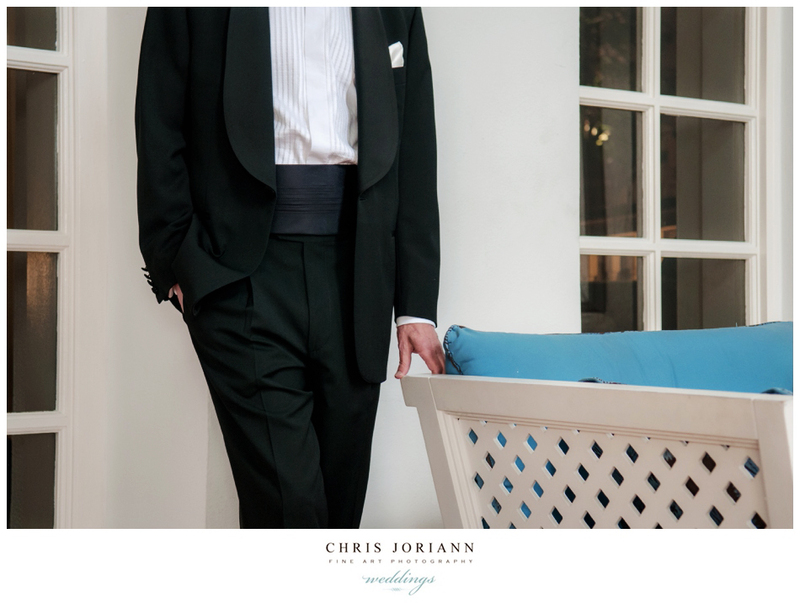 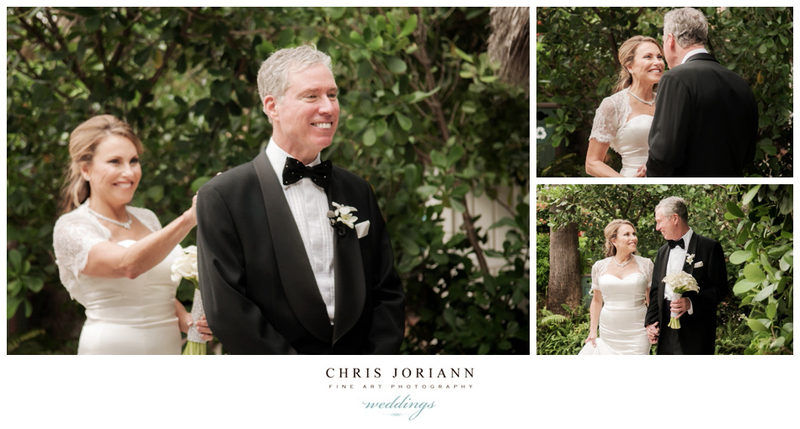 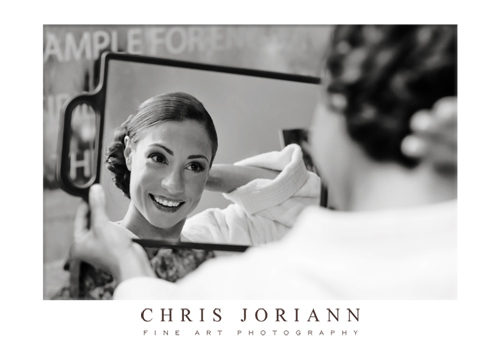 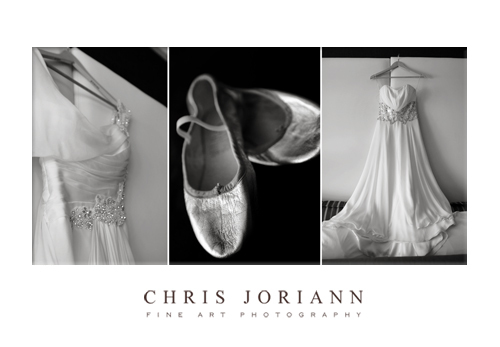 Soon it was time to dress the bride in her gown by Jenny Packham. 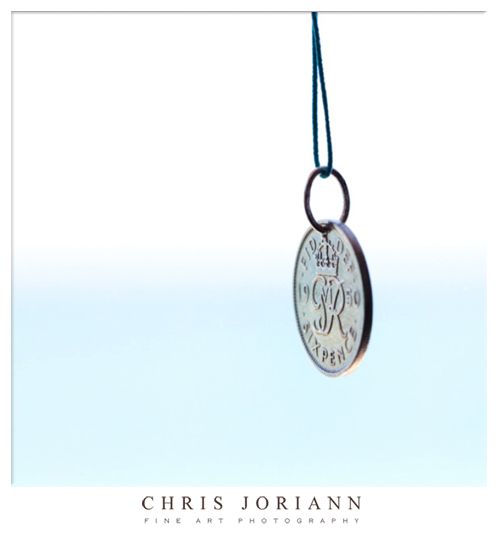 Her lucky six pence. 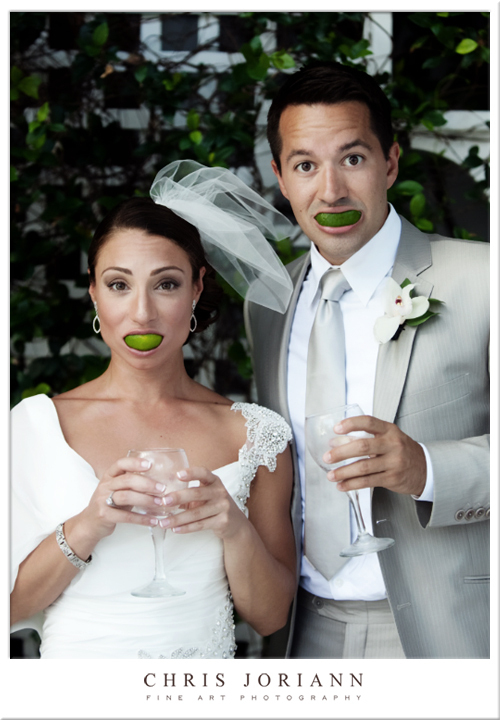 Can’t get married without that! 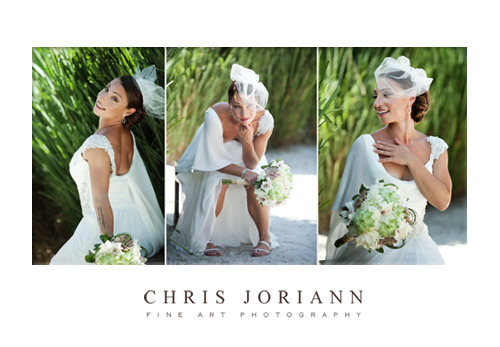 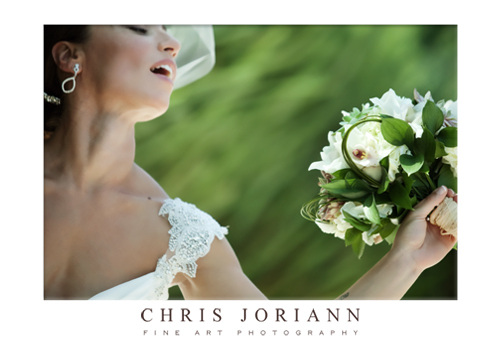 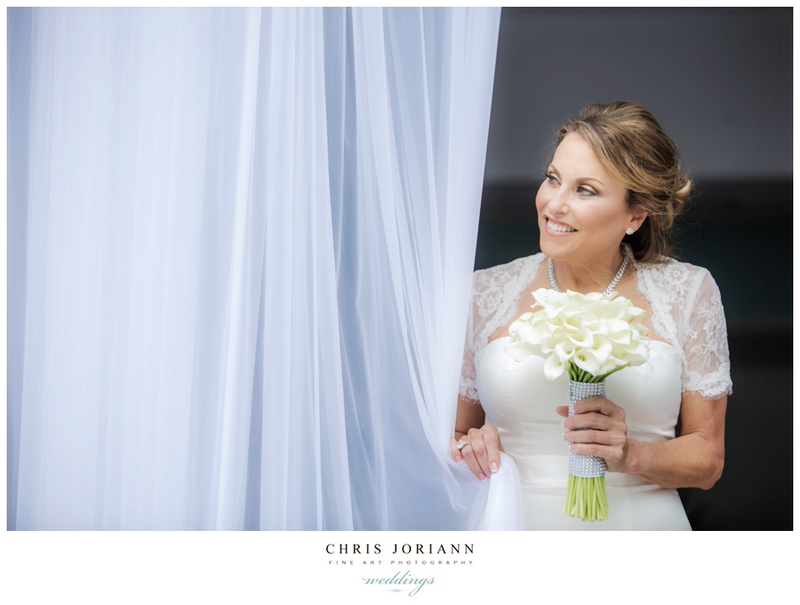 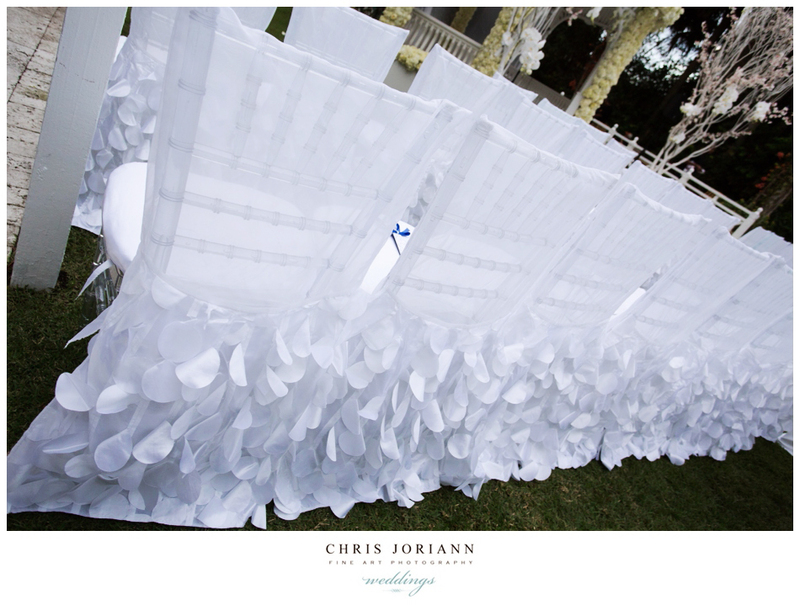 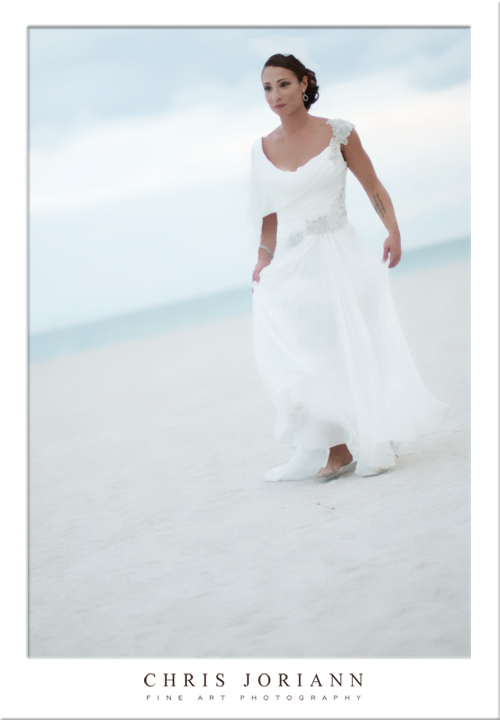 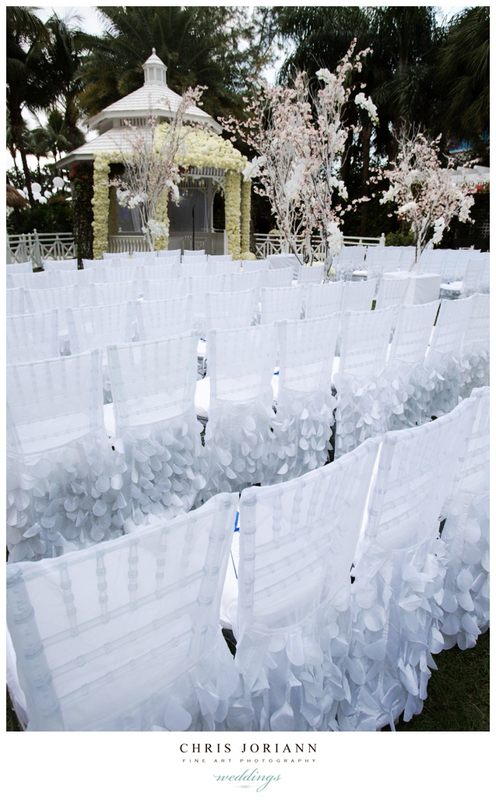 I just love this shot of the bride between the sea foam sheers. 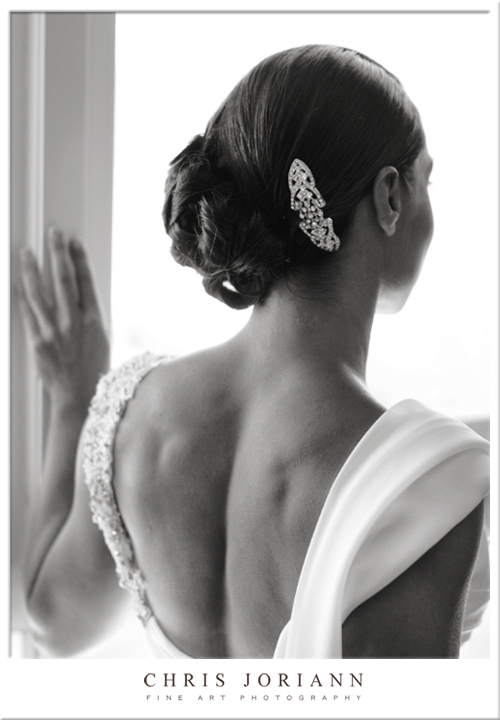 to complete the brides look, infused with old hollywood glamour. 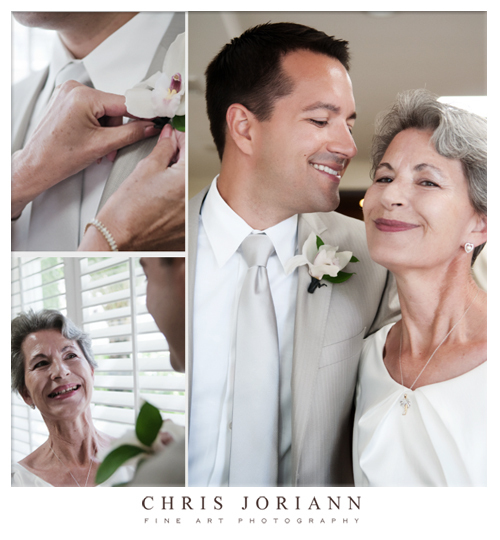 Mom dropped in to add a white orchid to Justin’s, oh, so dapper, ensemble. 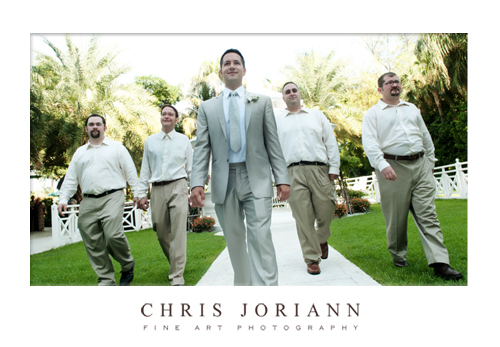 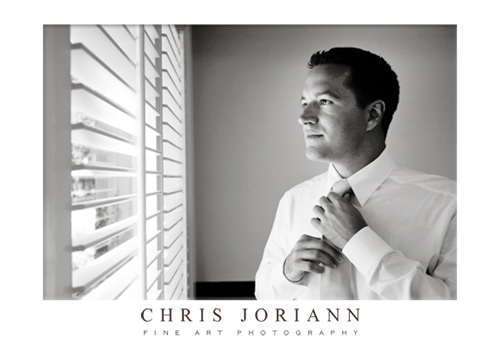 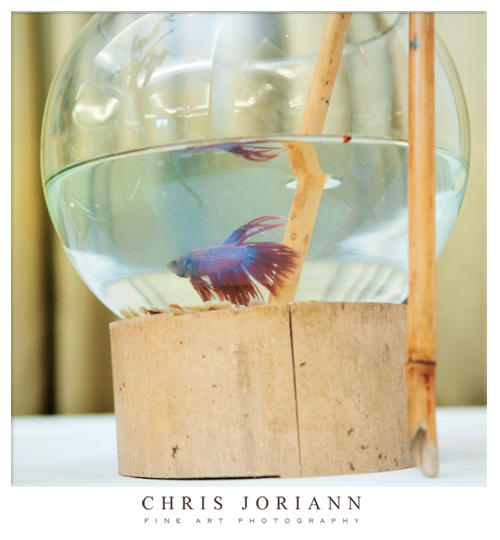 Then, it was off for some portraits with the boyz. 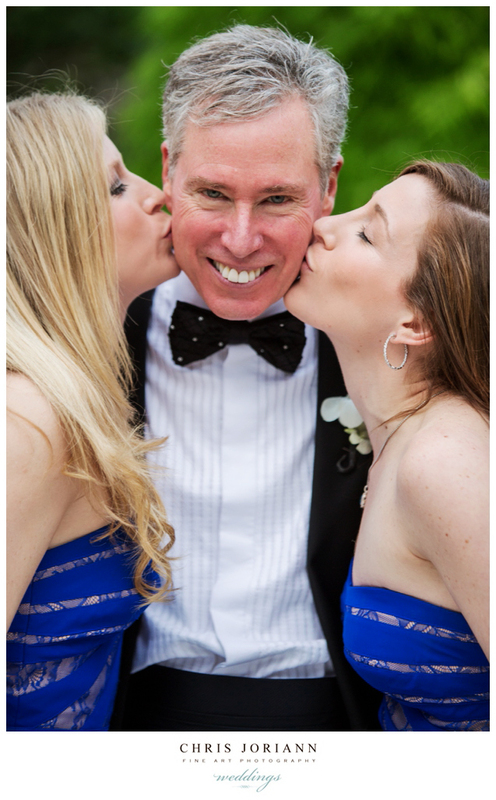 her “man of honor” came by and offered a quick kiss for luck. 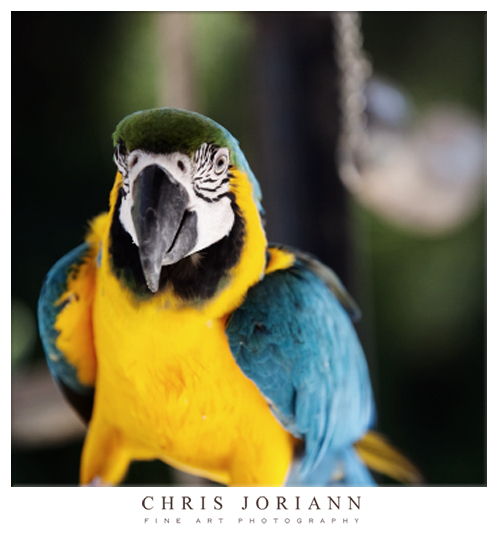 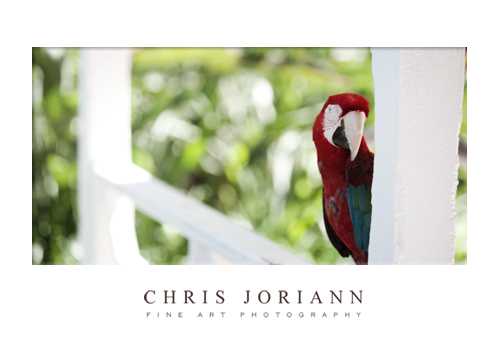 As the tropical birds looked on. 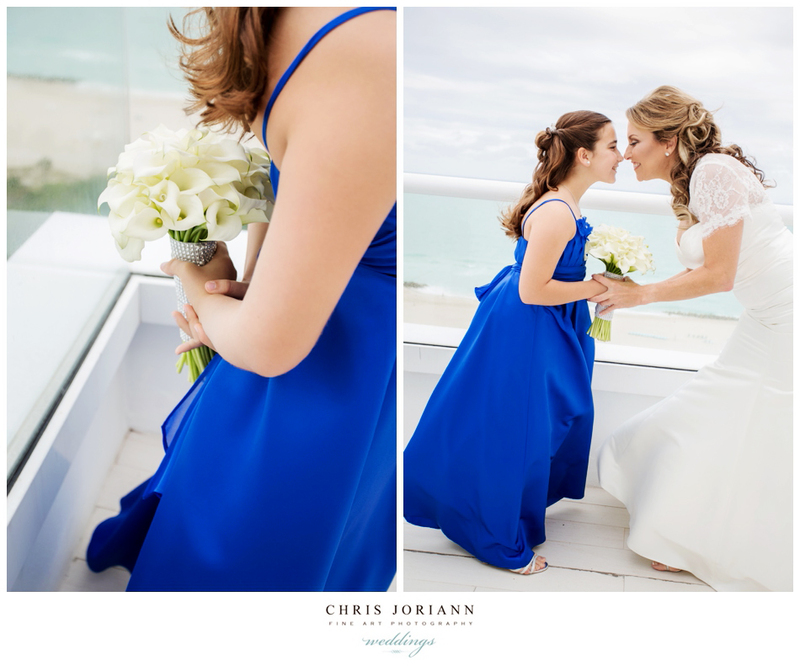 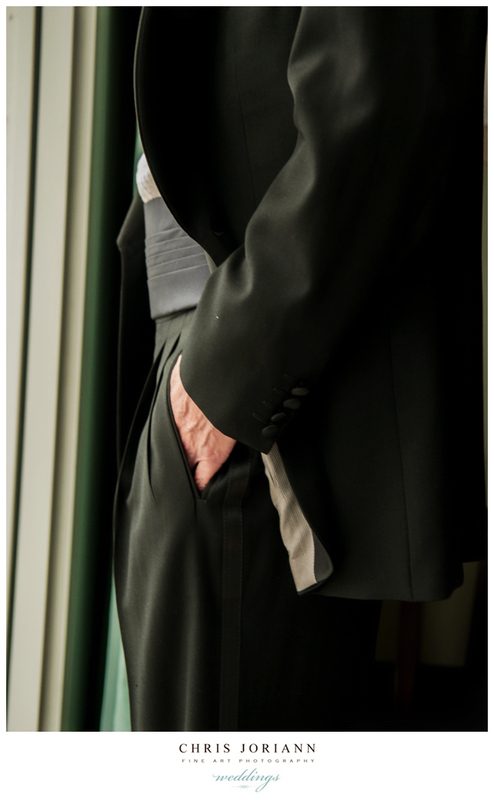 “What… you want a kiss too?” asked the bride. 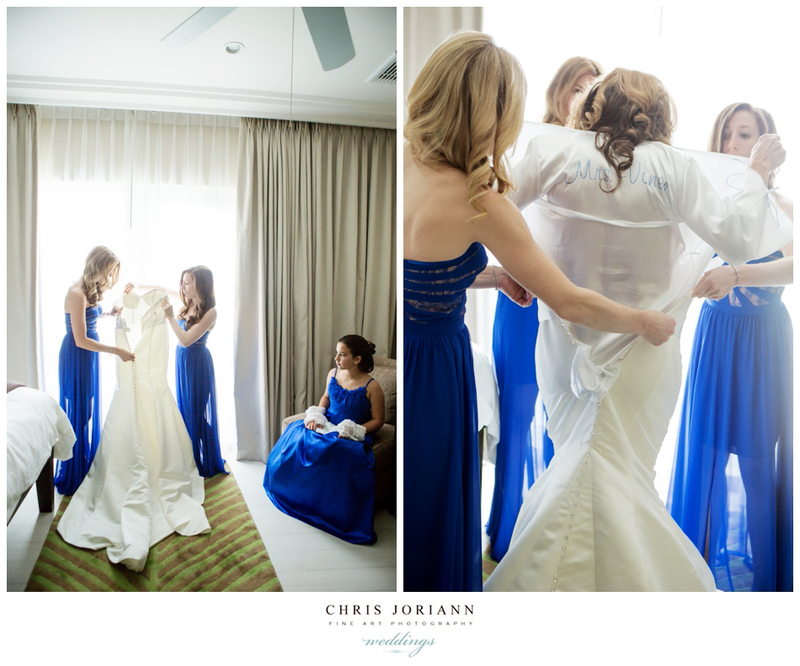 Moments later, the big reveal was orchestrated. 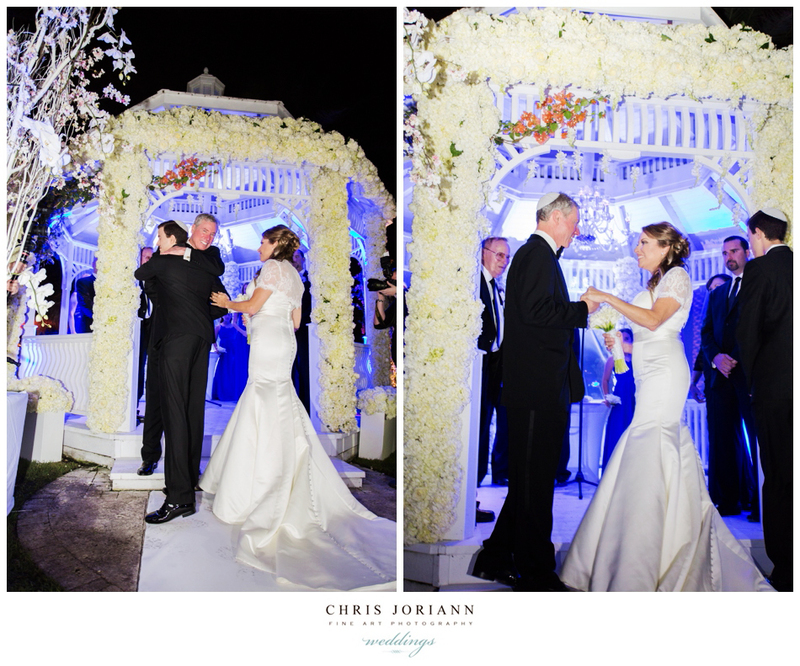 As Justin waited in the gazebo, Alissa descended the staircase grinning from ear to ear. 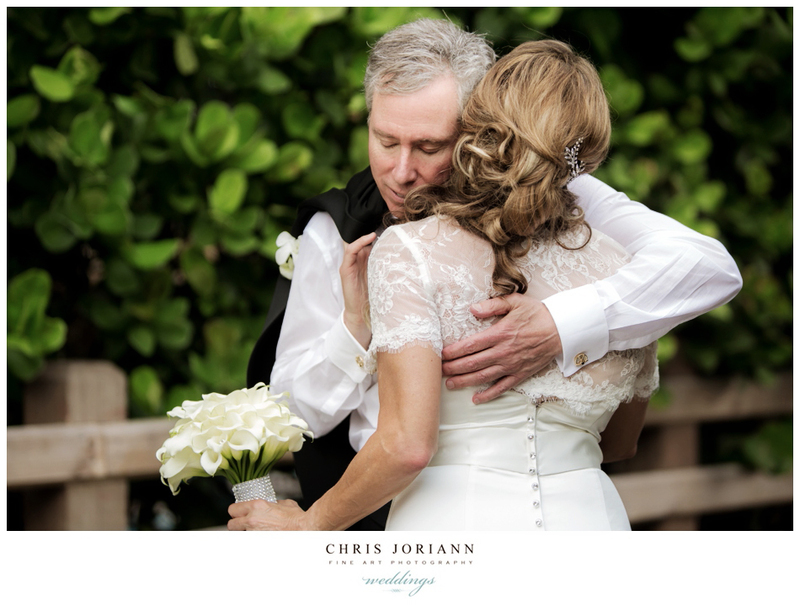 And scooped her right up in his arms. 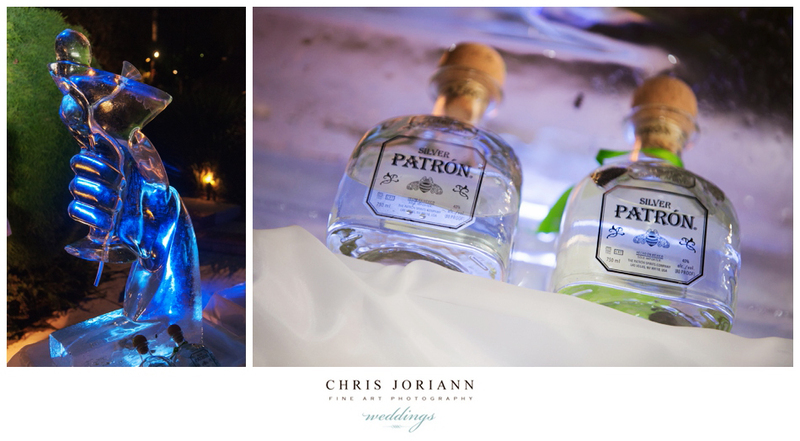 Due to the heat, refreshments were hand delivered… in the form of… tequila shots. 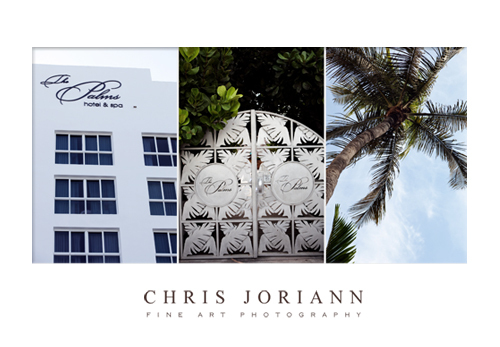 I must say, The Palms shot more like a tropical “key west” paradise, than a SoBe hotel, complete with tiki huts, bamboo gardens, and don’t forget the exotic birds. 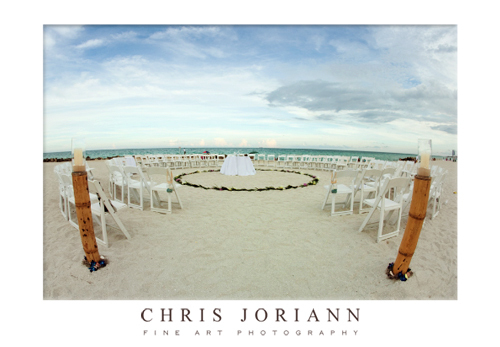 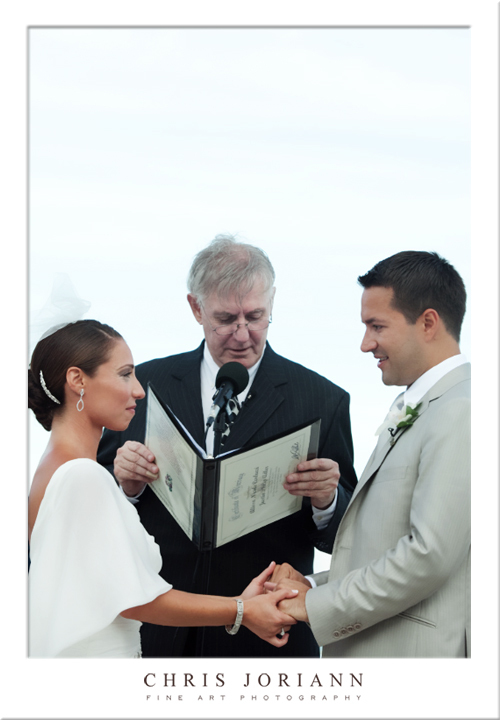 The ceremony, took place right on the beach. 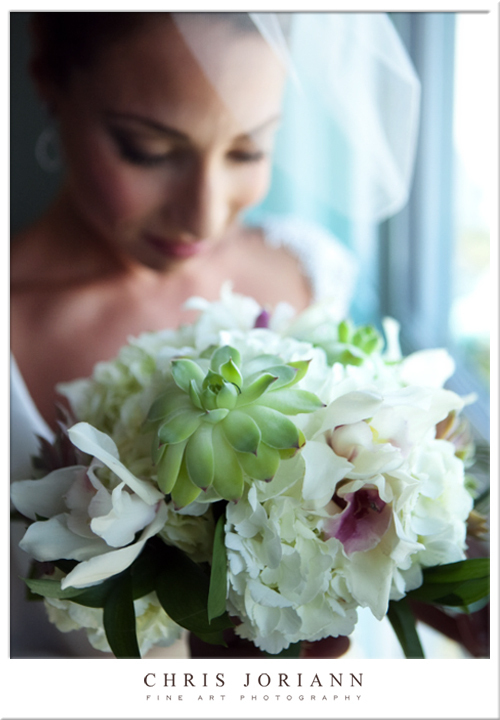 Surrounded by a wreath of palms, accented with succulents, lilys, orchids and roses. 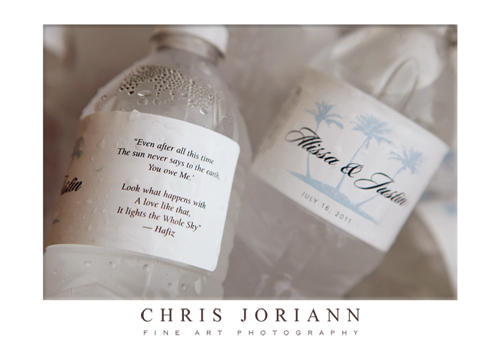 As were these cute customized waters. 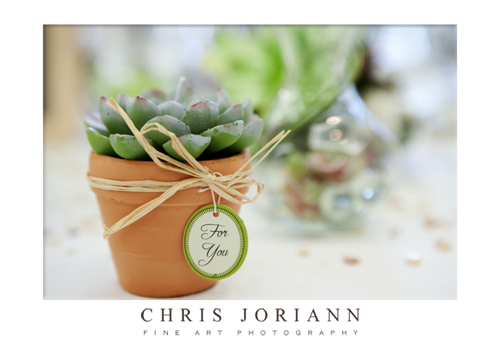 I just loved the quote on the label!!! 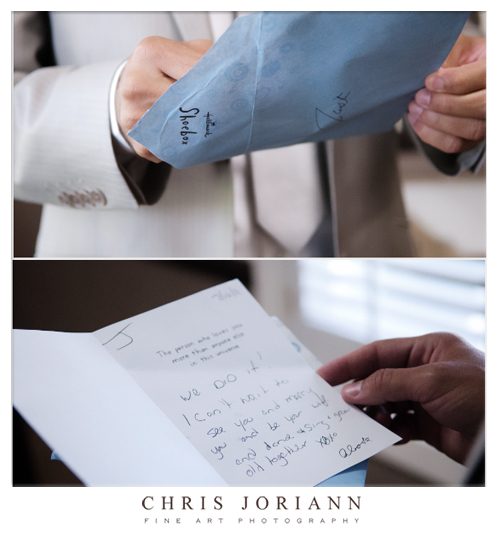 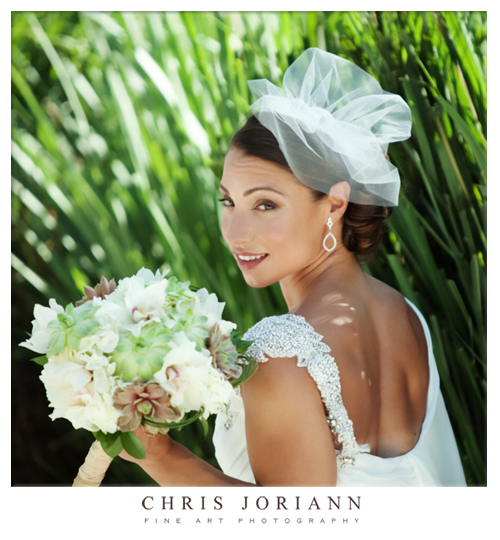 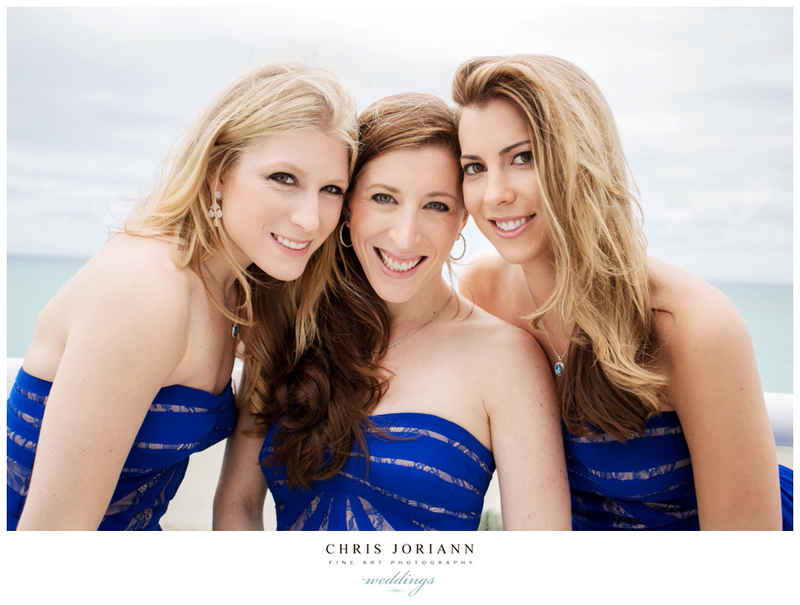 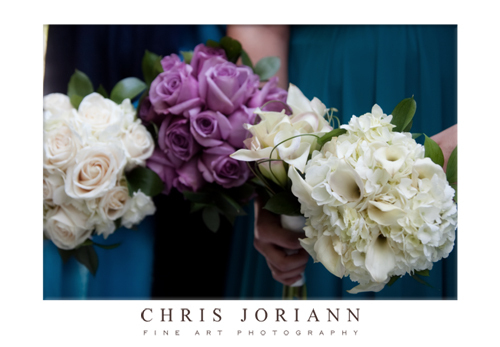 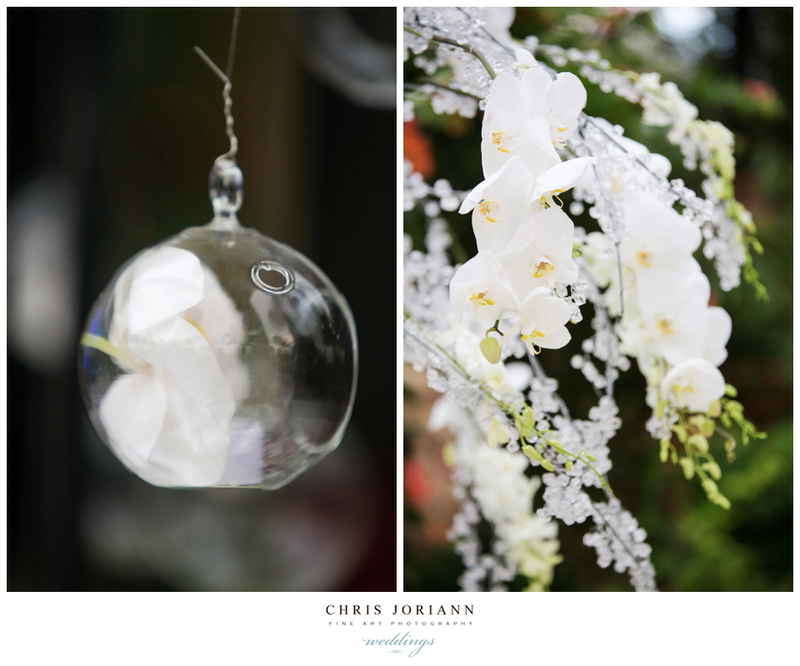 The bridemaids looked on… holding all DIFFERENT bouquets… great idea! 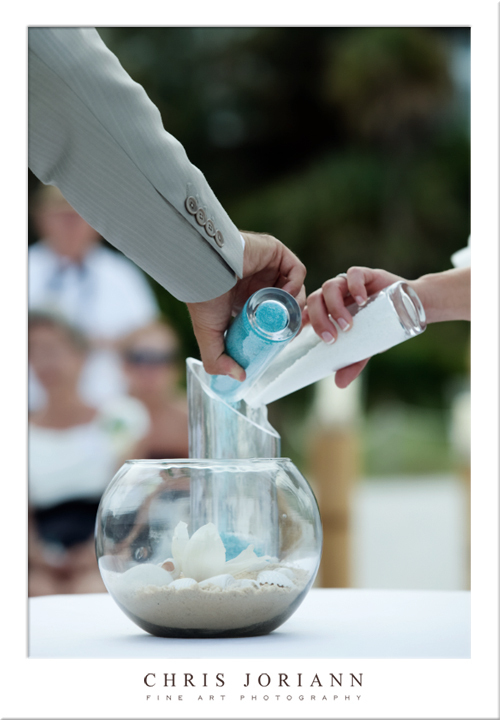 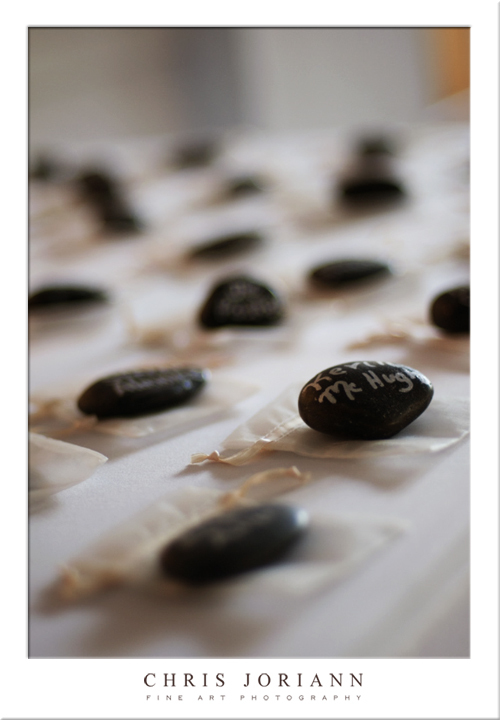 They poured sand, signifying the joining two lives into one. 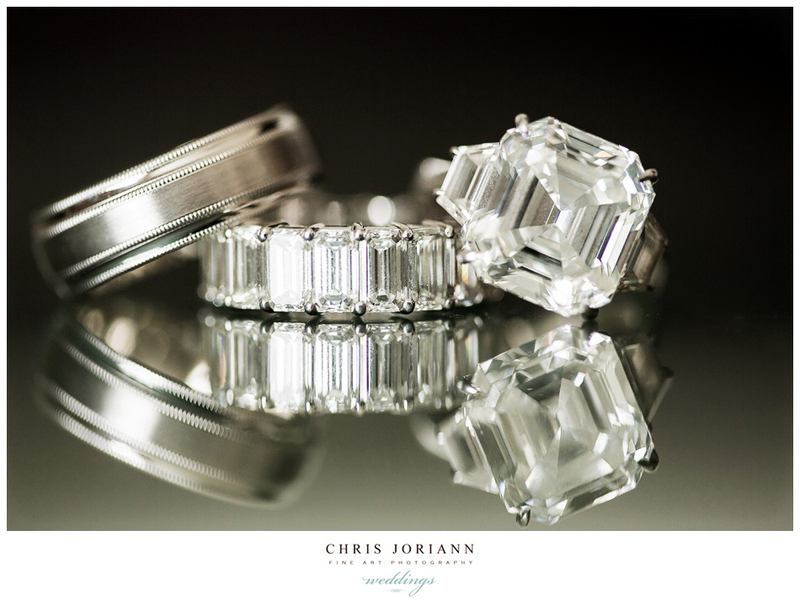 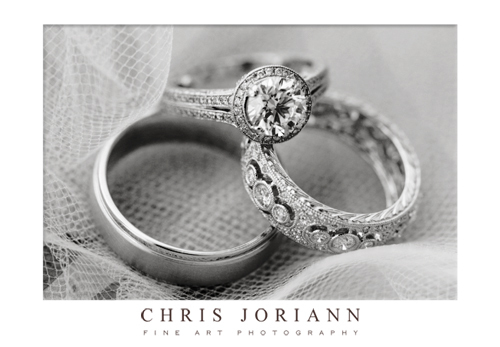 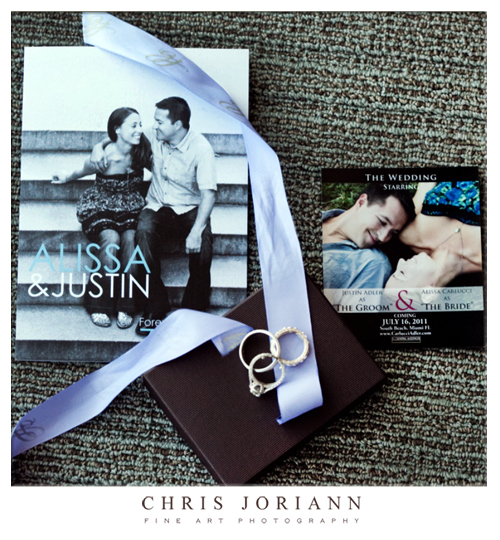 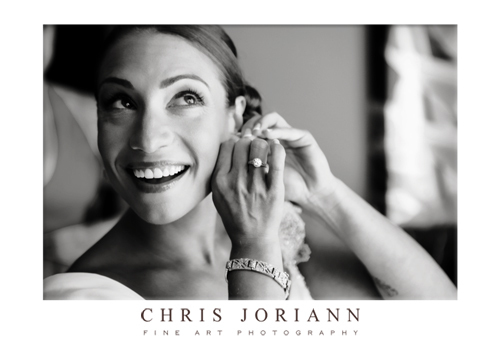 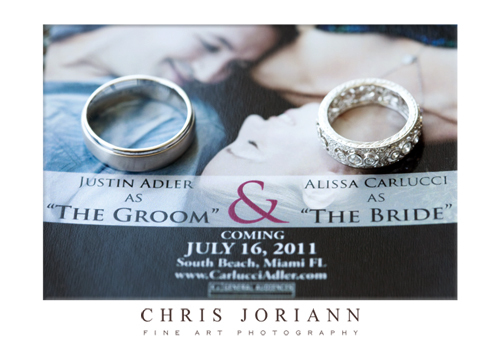 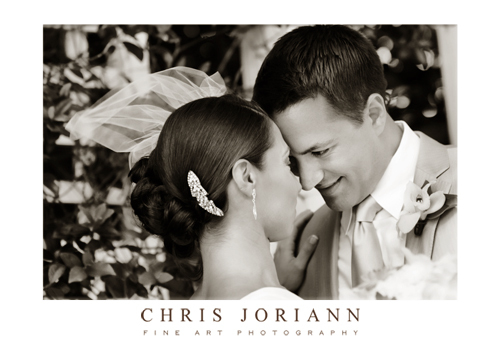 And promised to love for eternity as Justin placed the wedding band on Alissa’s finger. 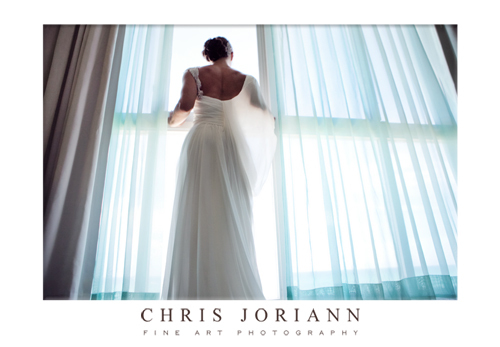 Here they are in their first portrait as husband and wife… looking out at the sea. 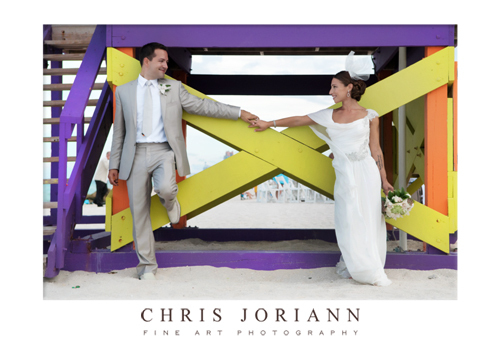 A quick portrait by the lifeguard hut… pretty much because I liked the cool colors. 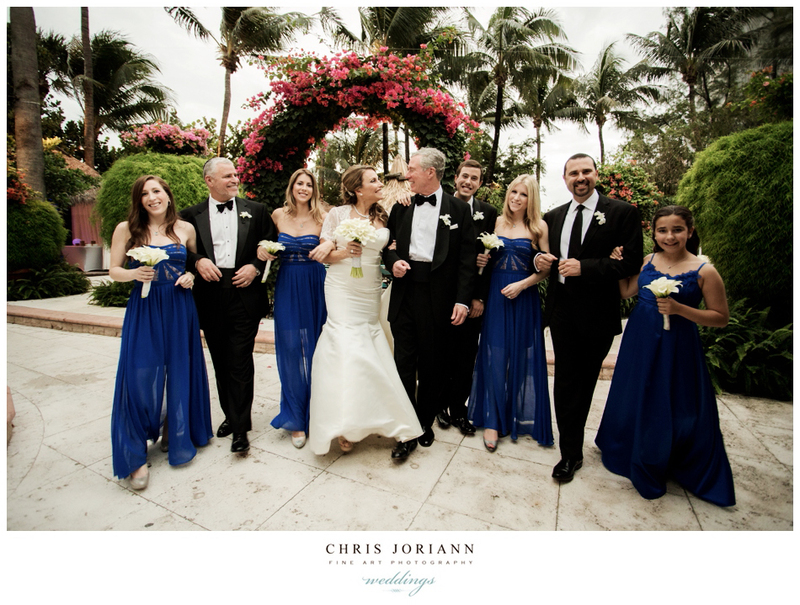 Then the bridal party was off to the party. 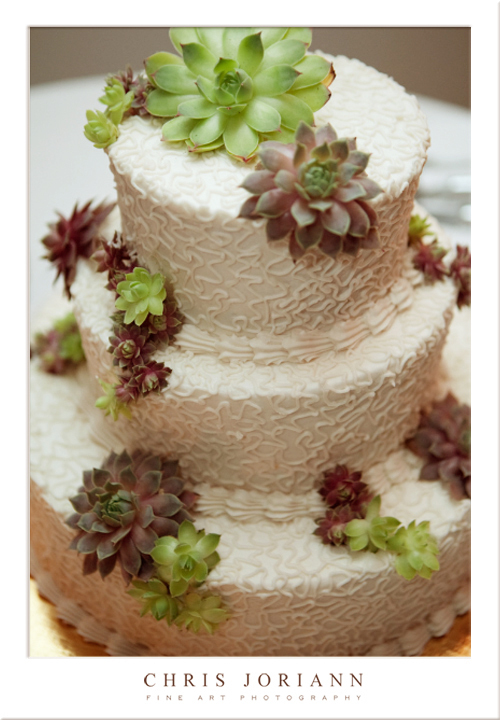 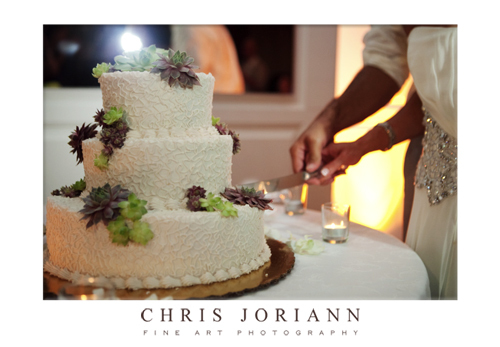 Again, succulents were everywhere… Even on the cake. 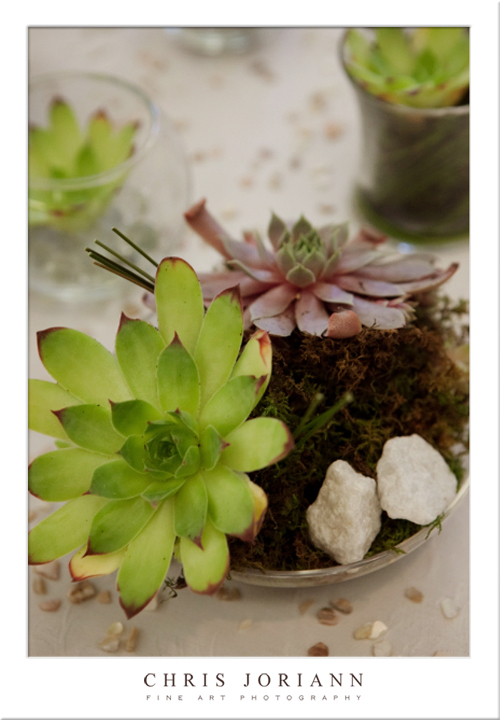 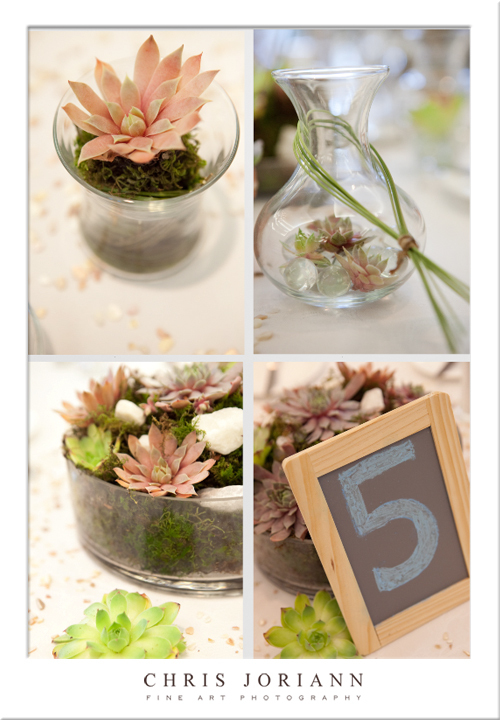 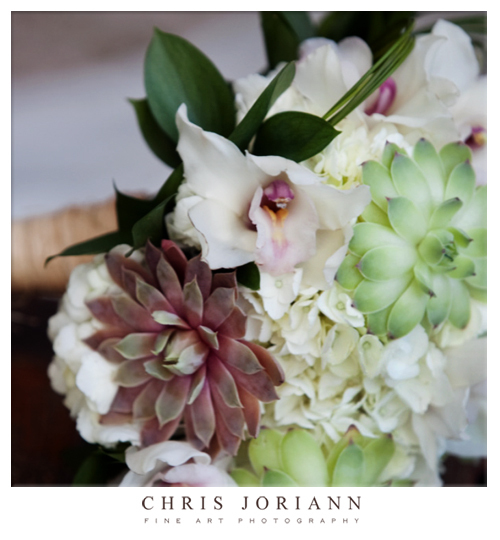 And yes… more… you guessed it… wonderful succulent arrangements in various sizes and styles. 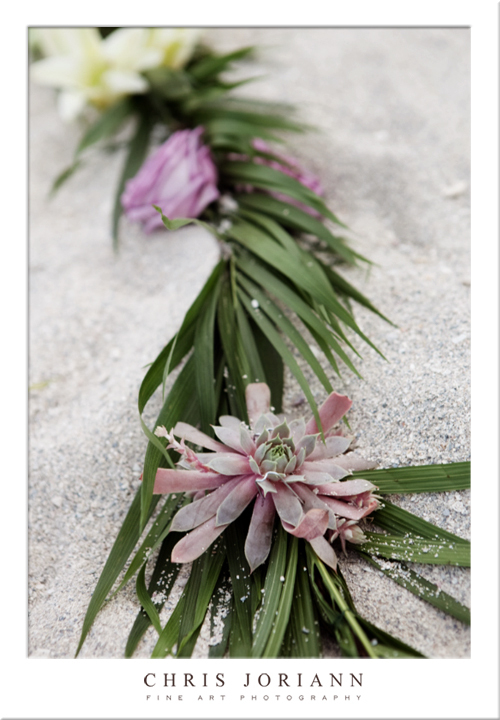 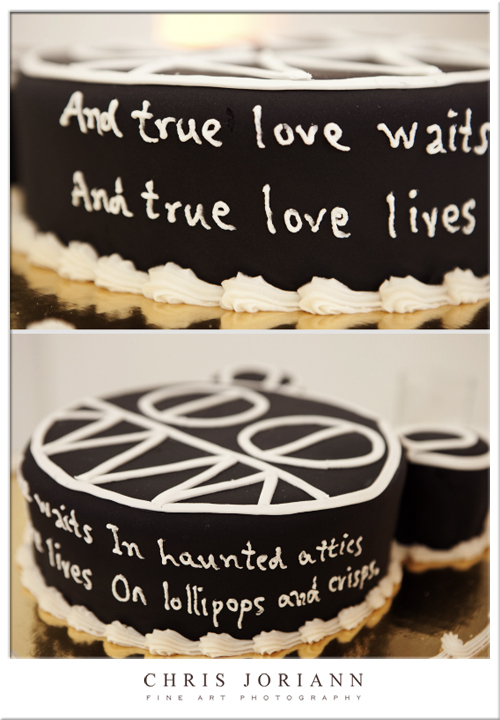 Even their favor kept with the theme… and although it looked like a plant, it was really… a candle. 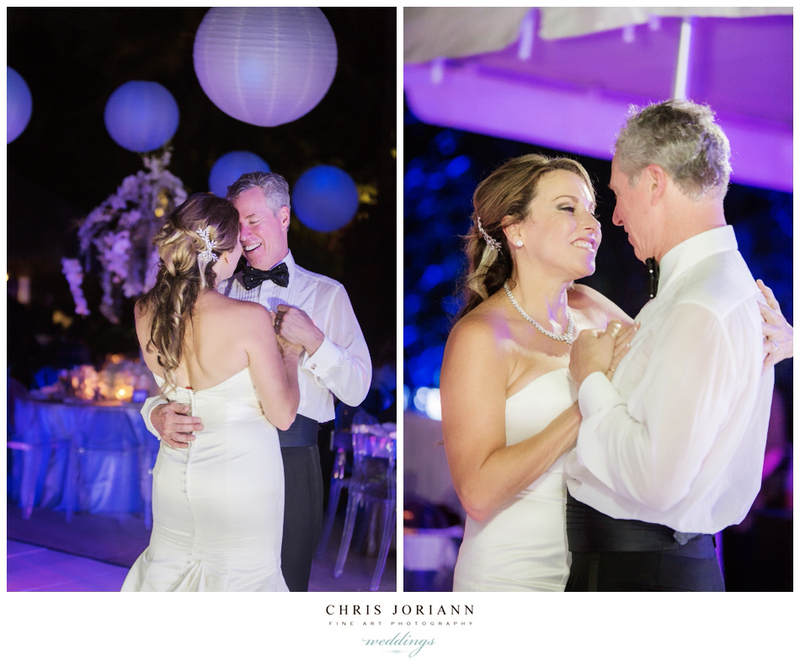 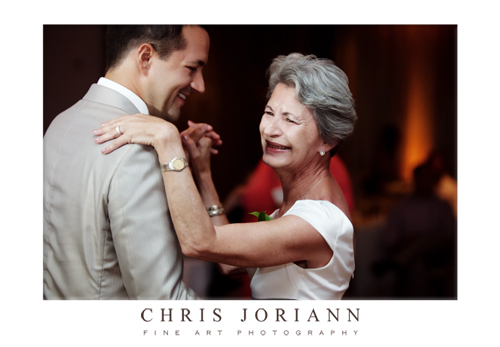 After a quick change of gown, the bride and groom had their first dance. 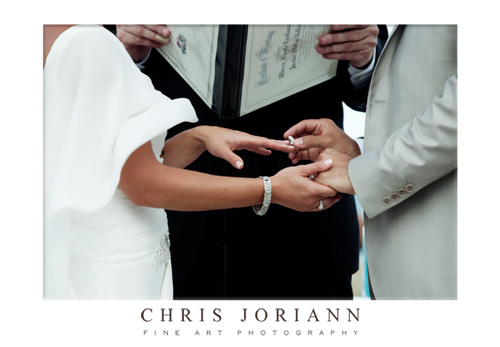 Came to a perfect end.